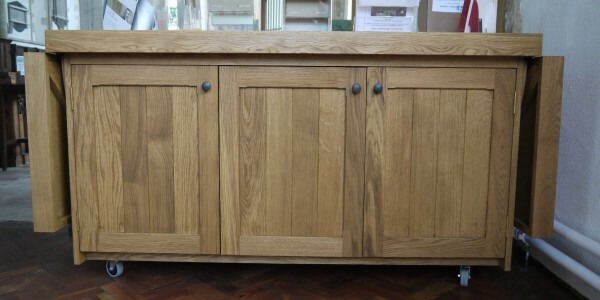 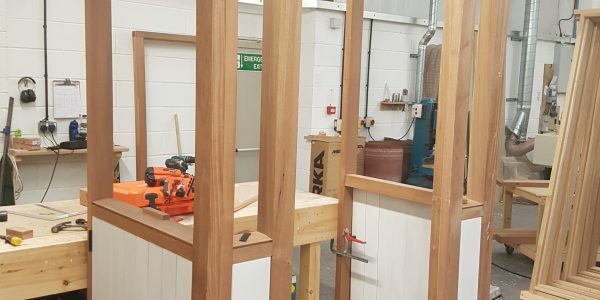 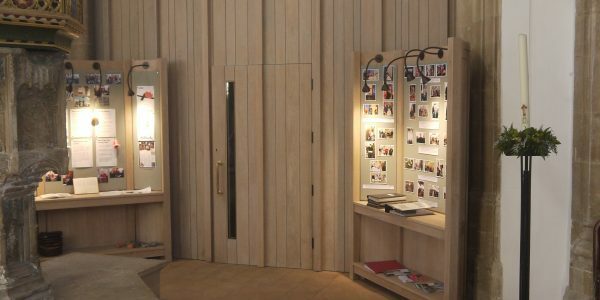 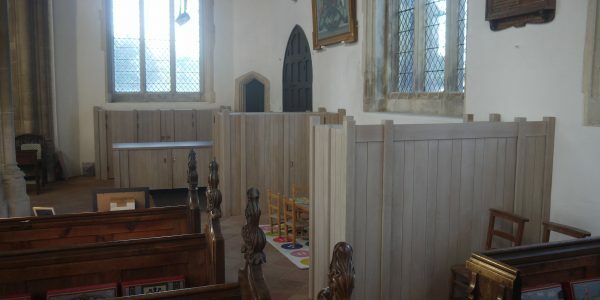 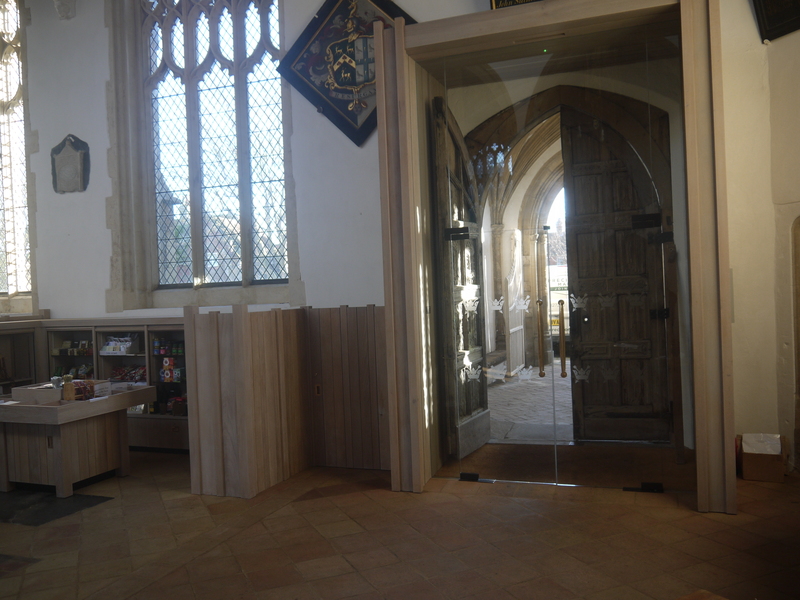 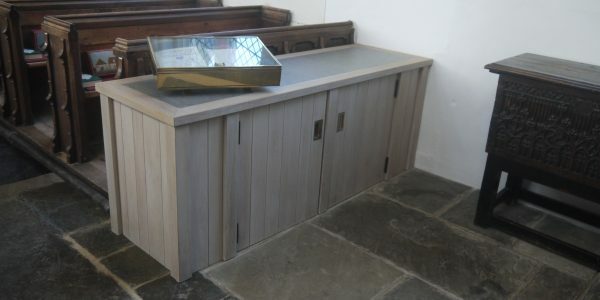 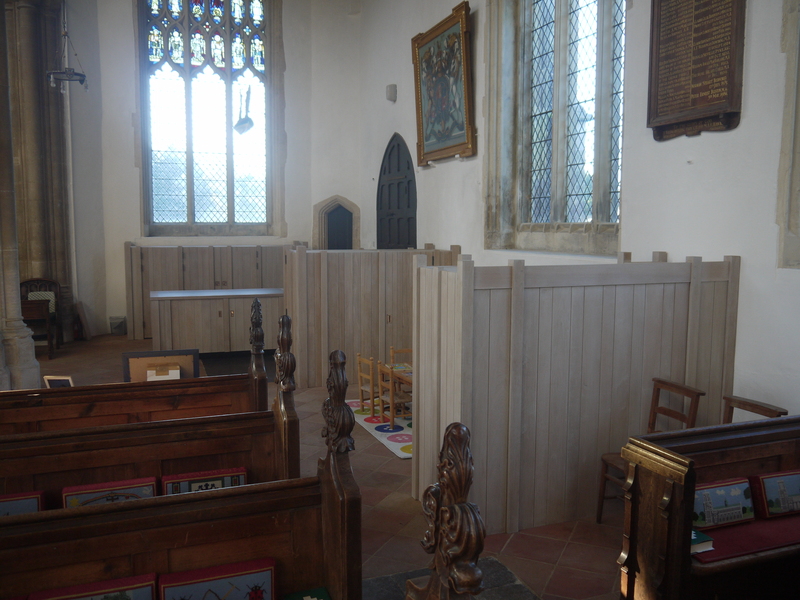 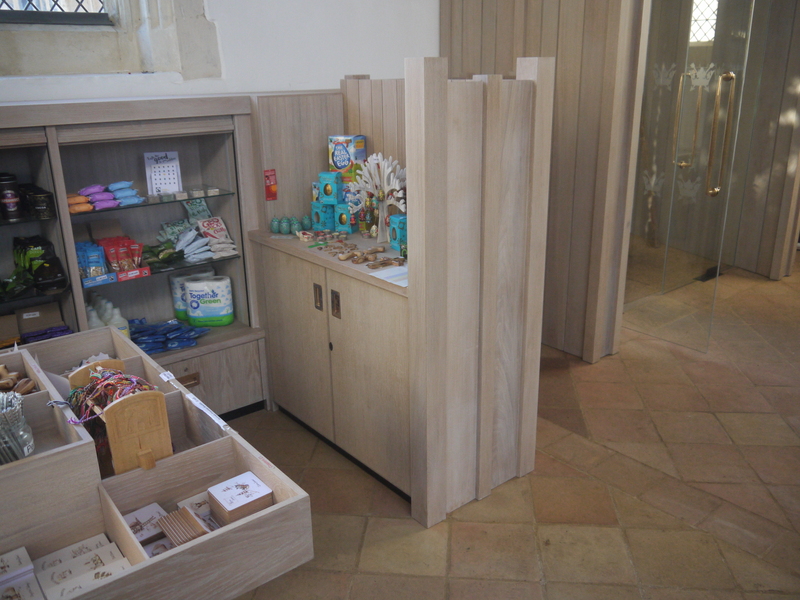 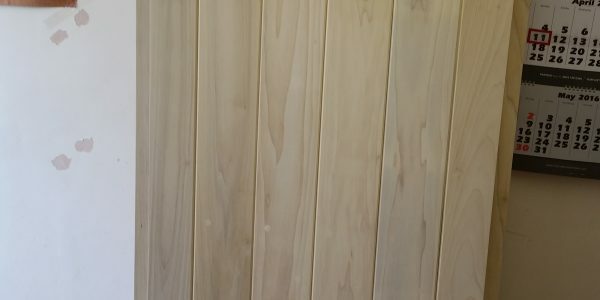 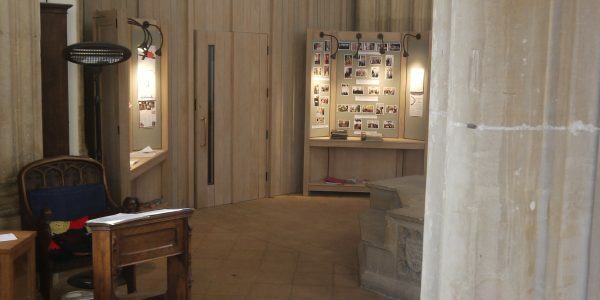 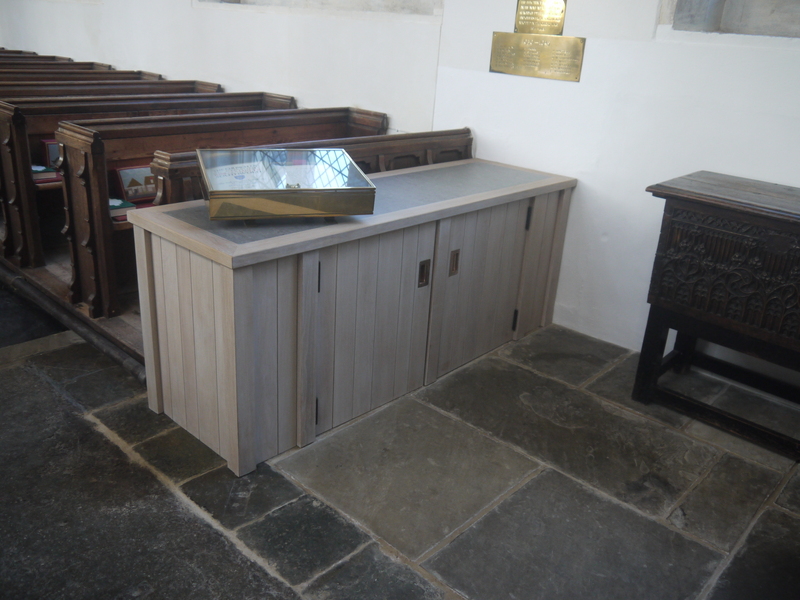 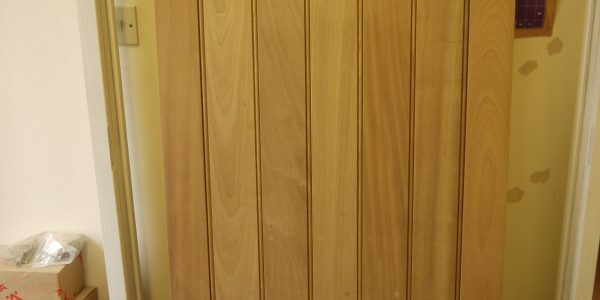 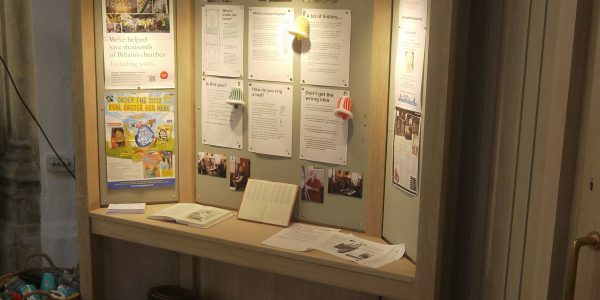 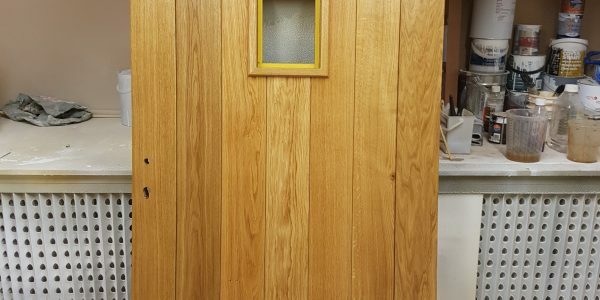 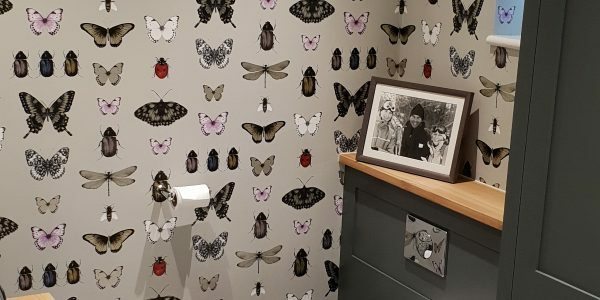 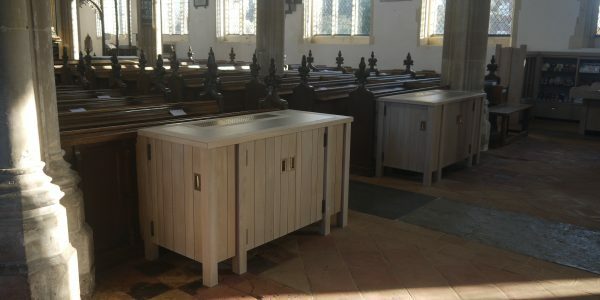 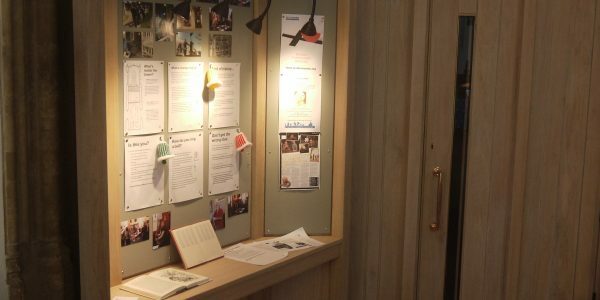 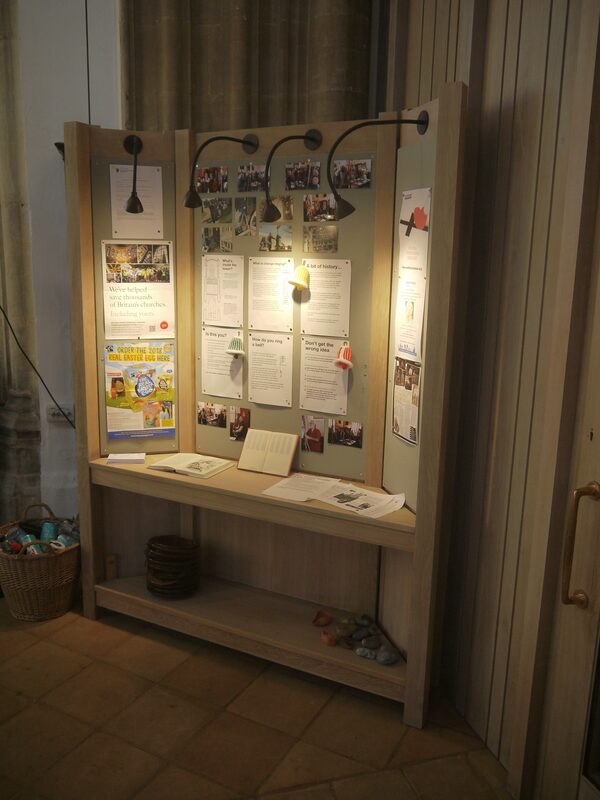 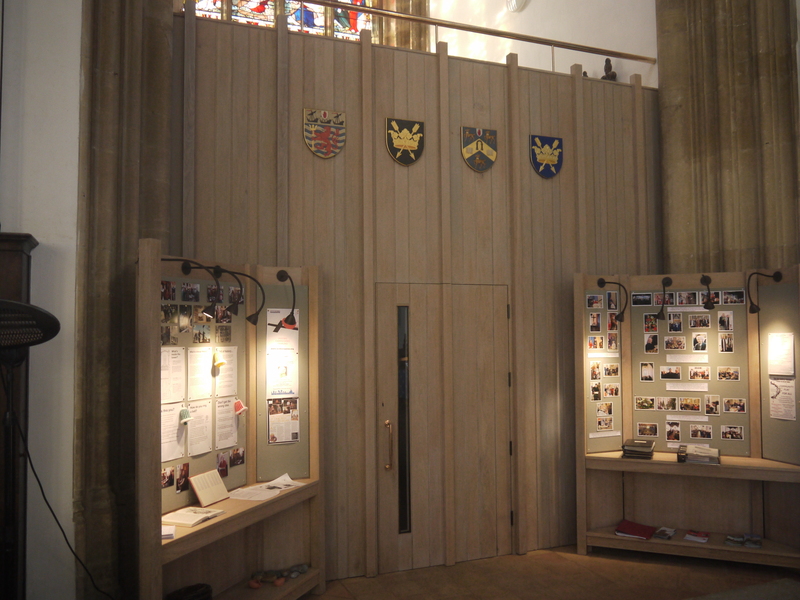 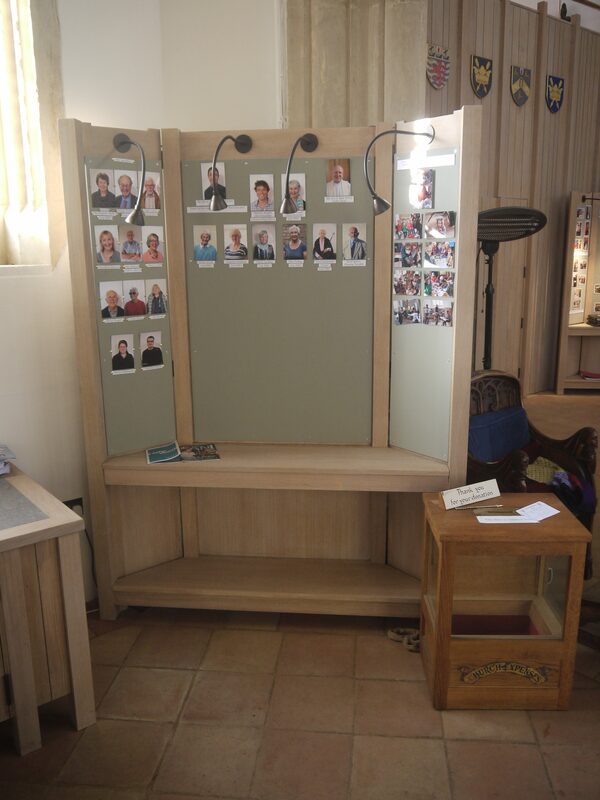 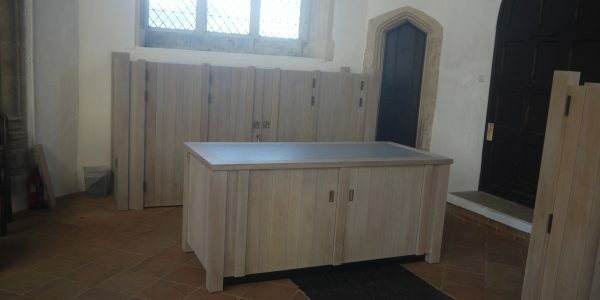 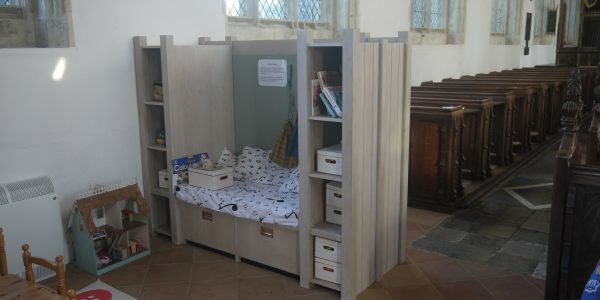 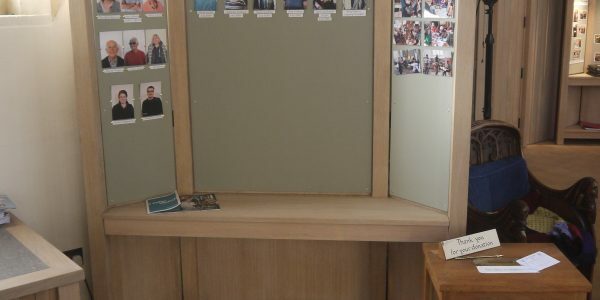 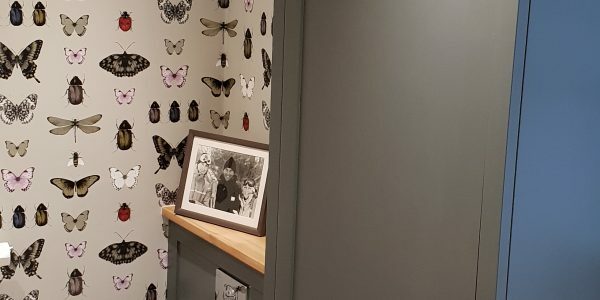 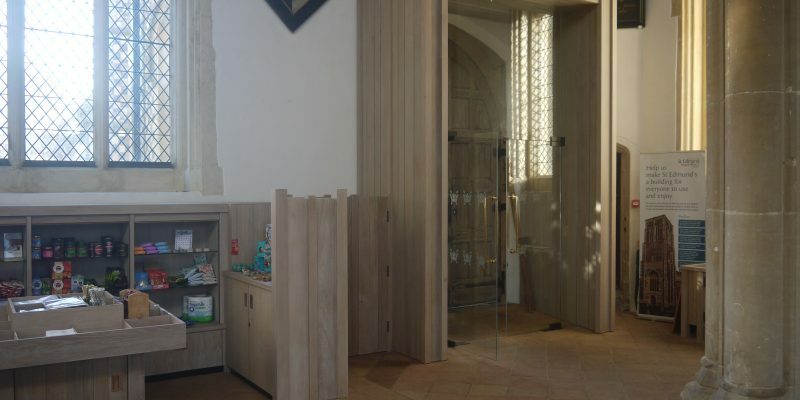 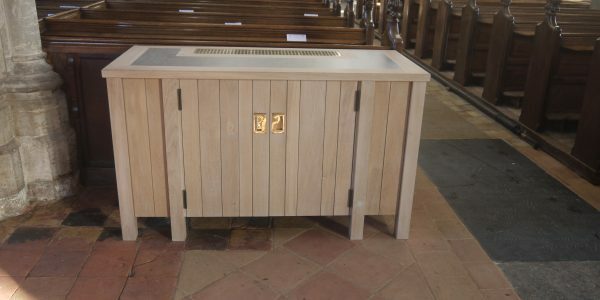 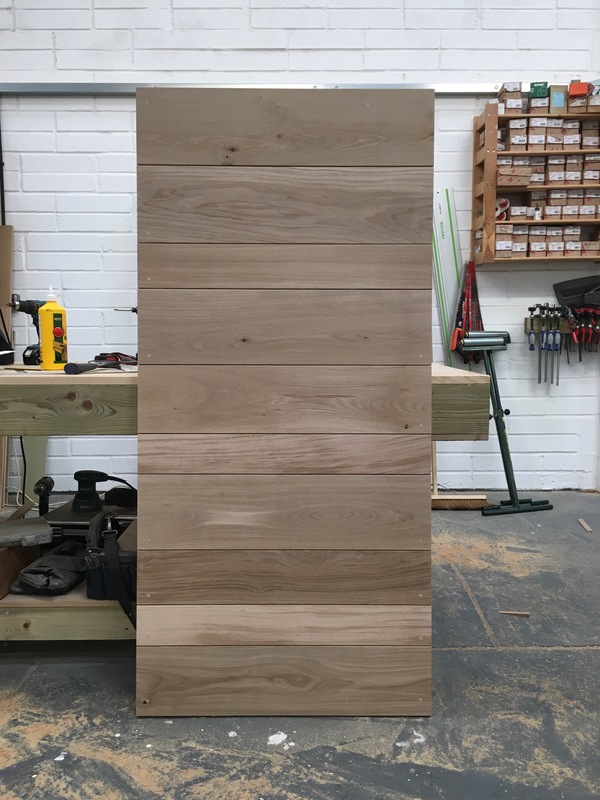 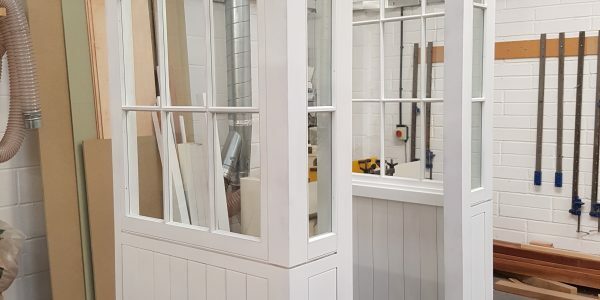 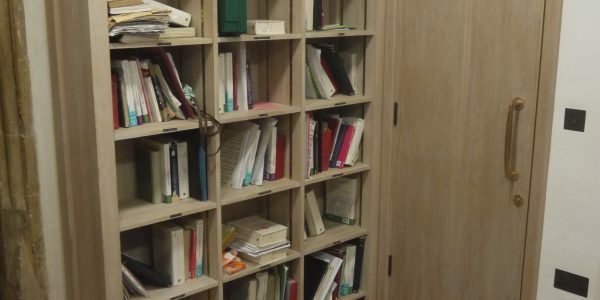 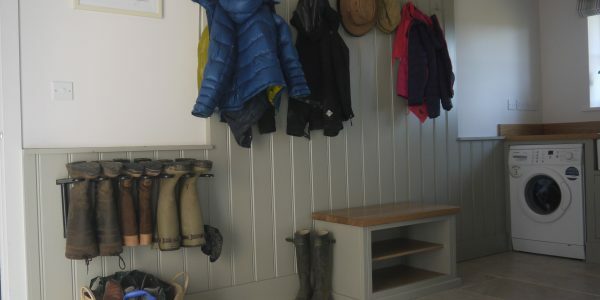 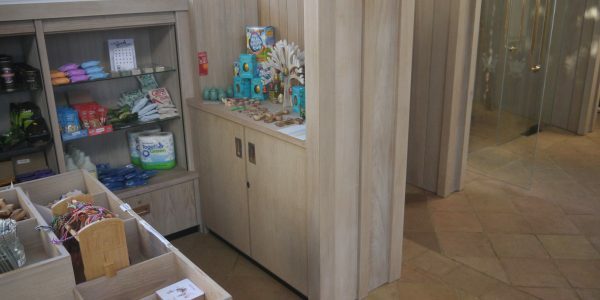 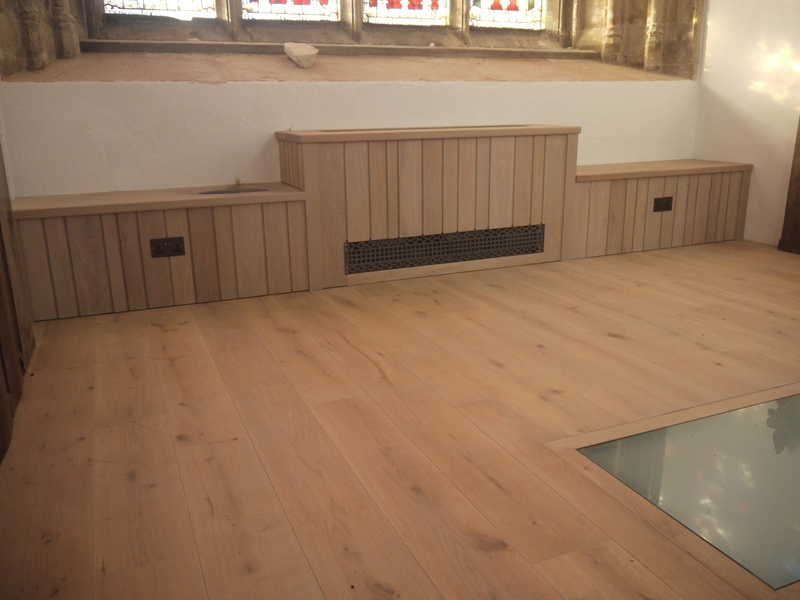 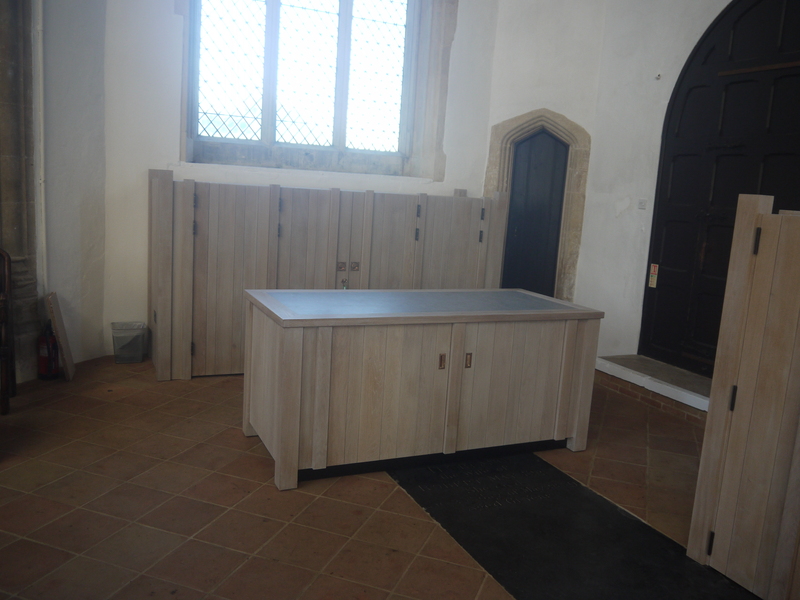 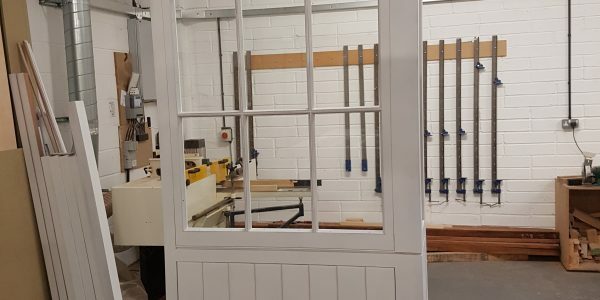 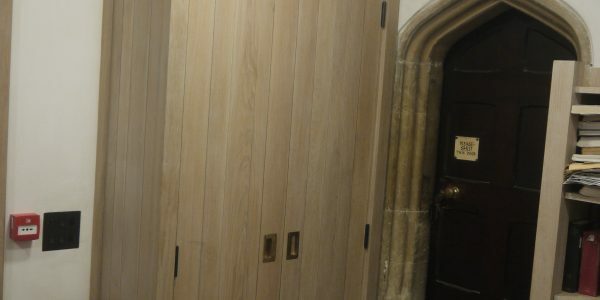 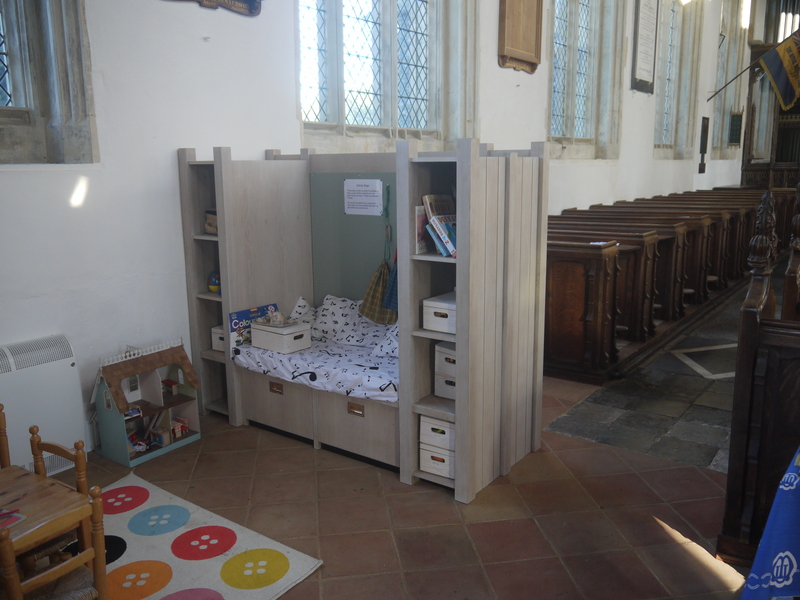 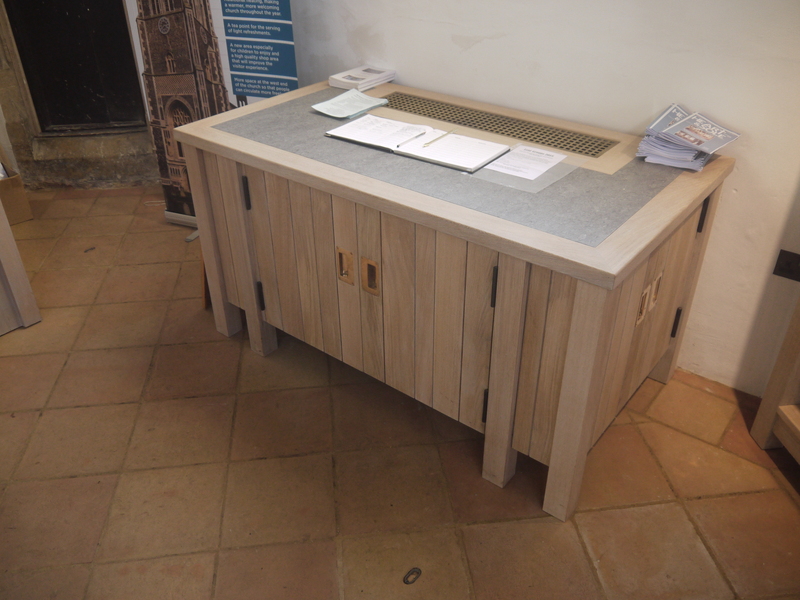 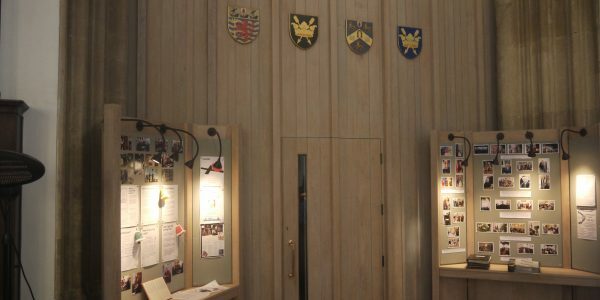 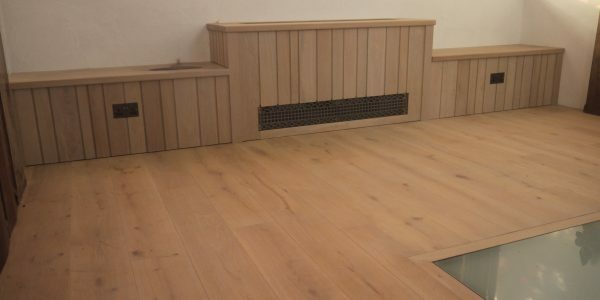 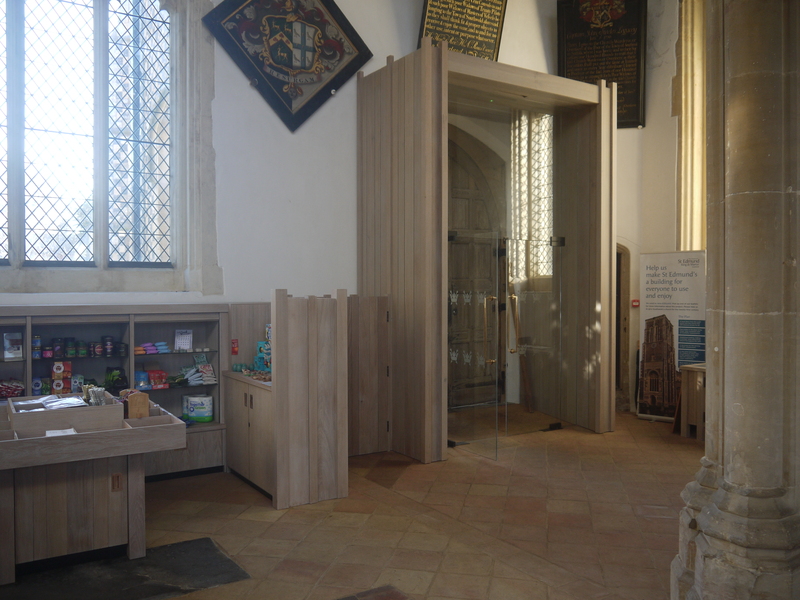 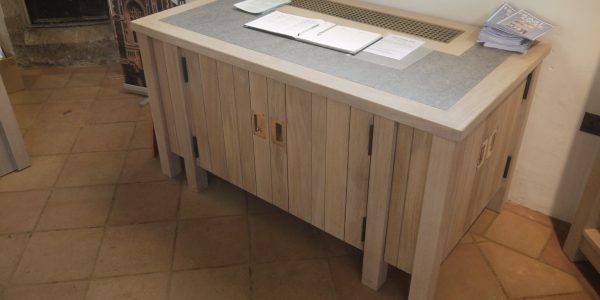 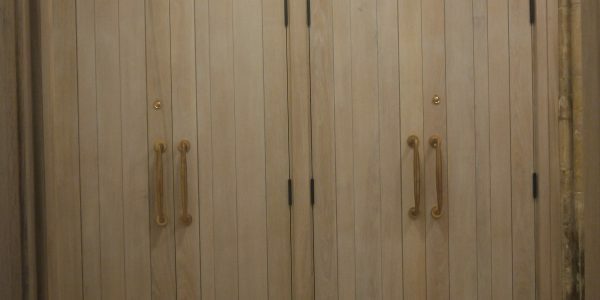 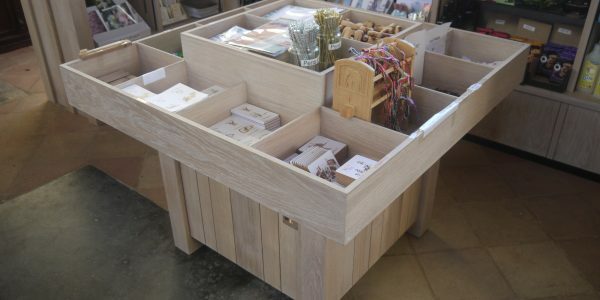 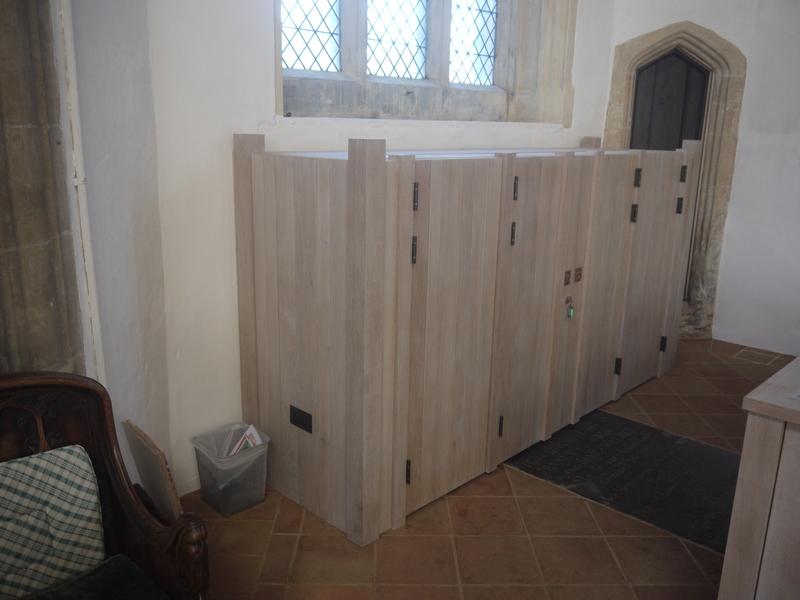 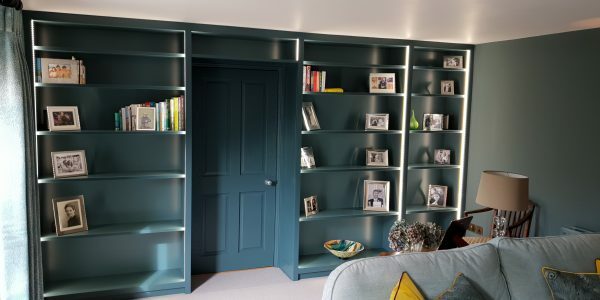 The joinery we manufactured included a children’s area and a number of heater units, display units, bookcases, storage cupboards, internal doors and panelling. 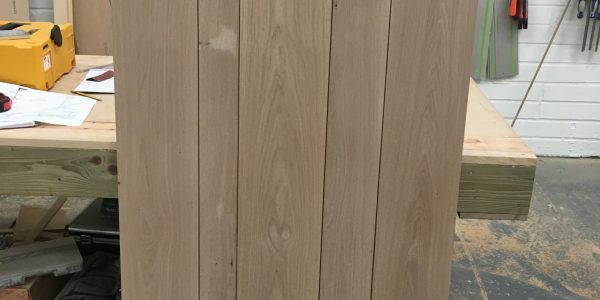 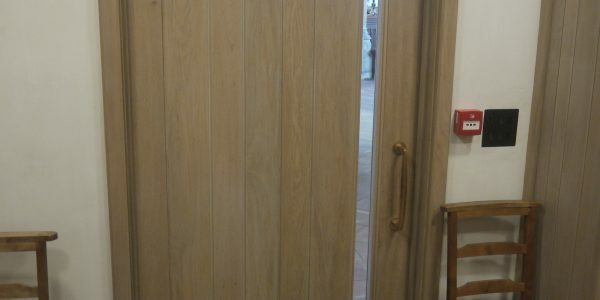 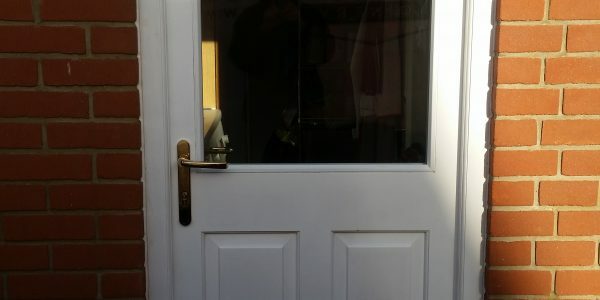 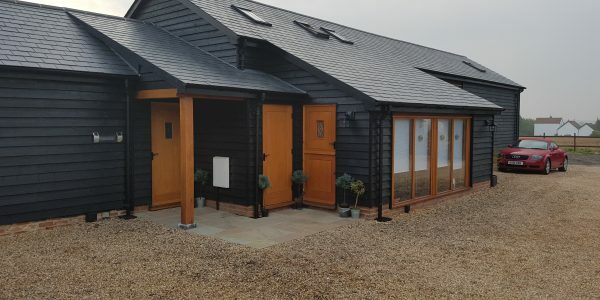 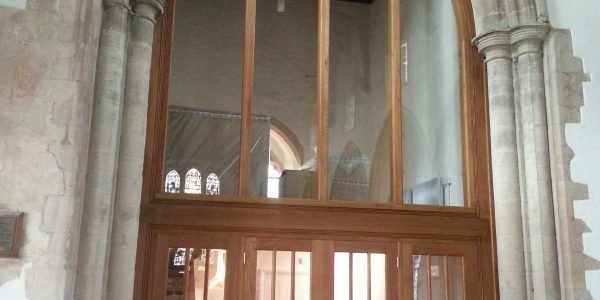 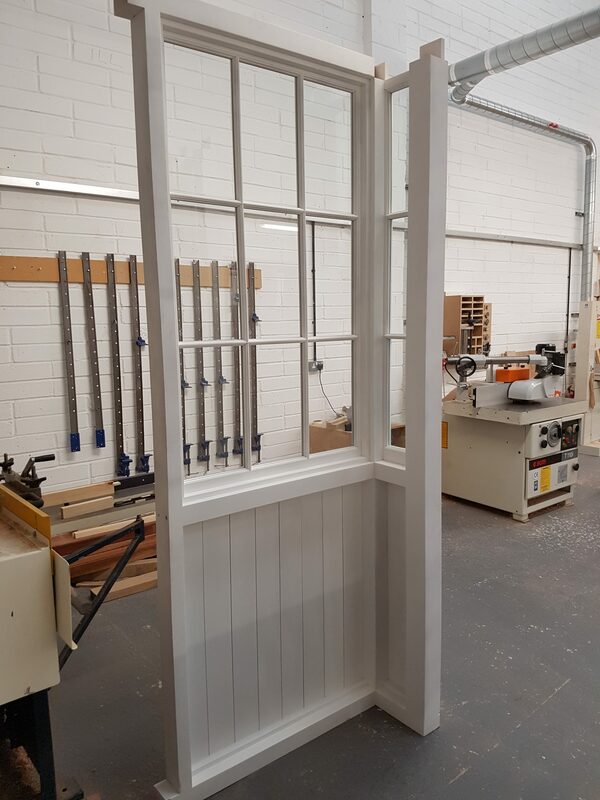 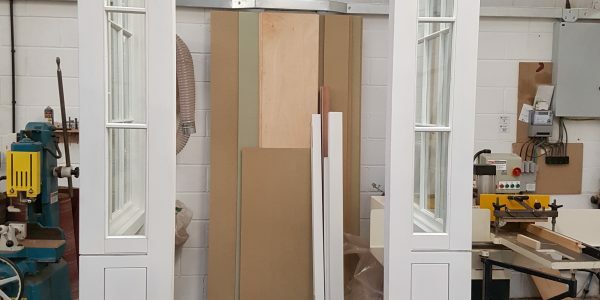 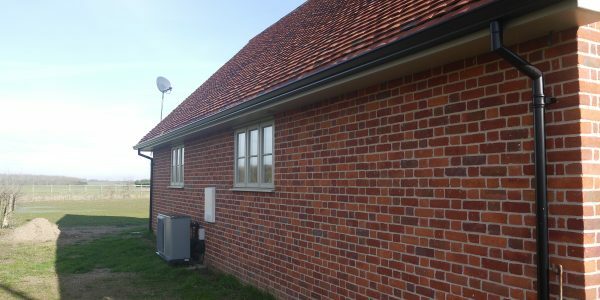 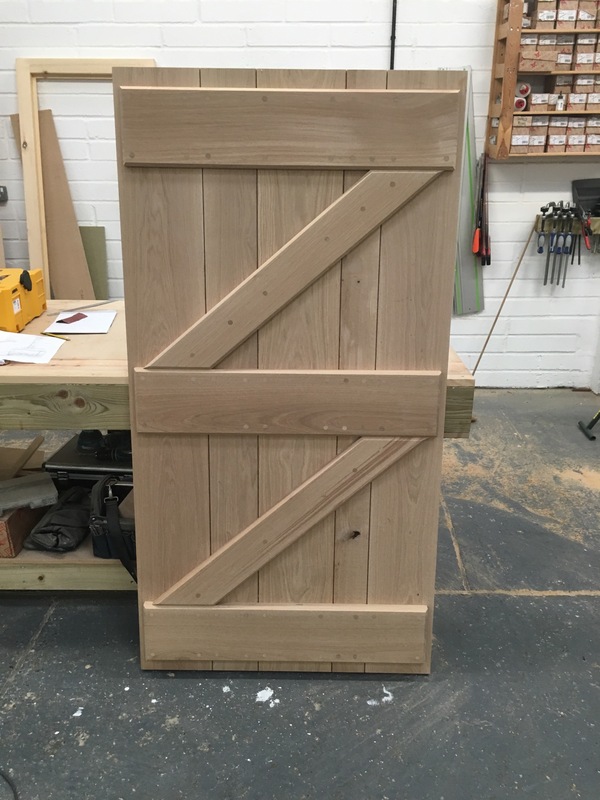 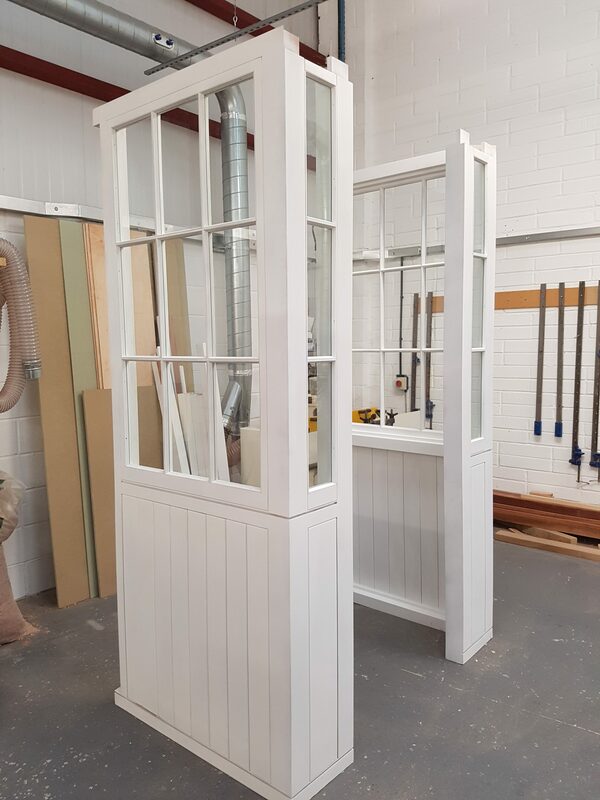 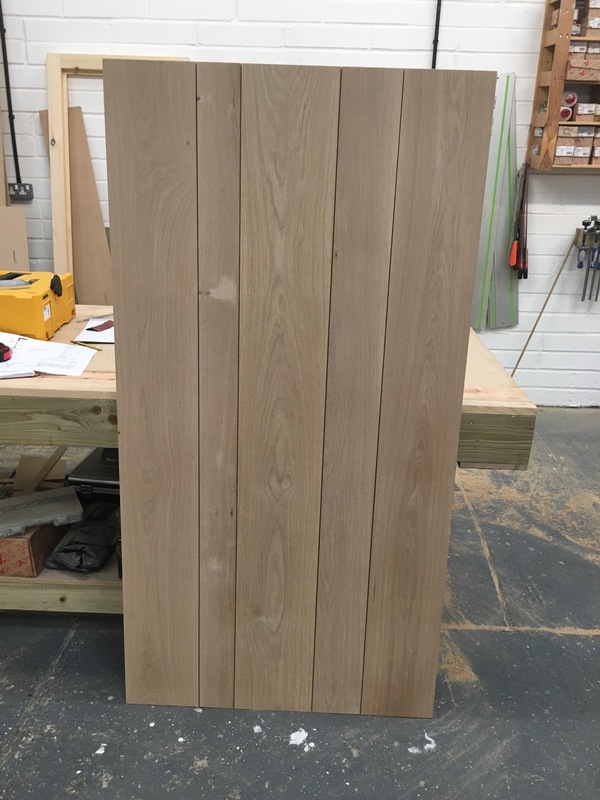 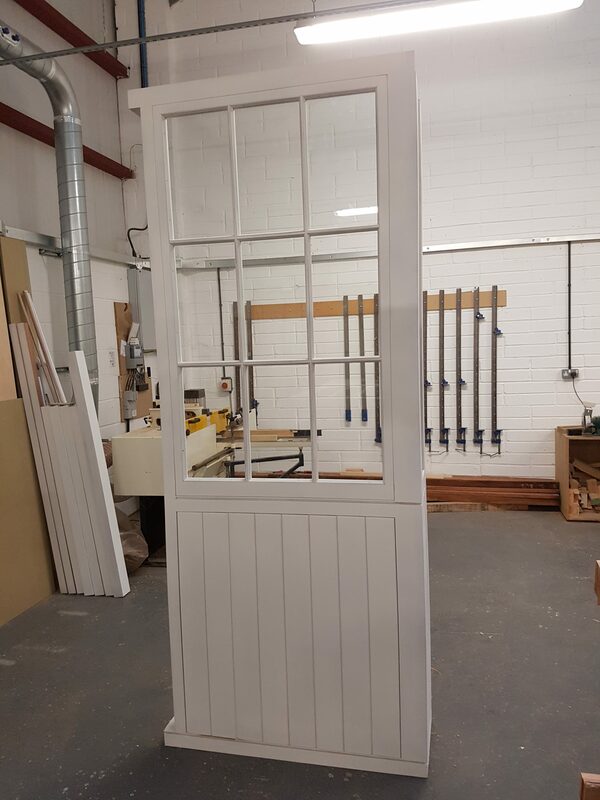 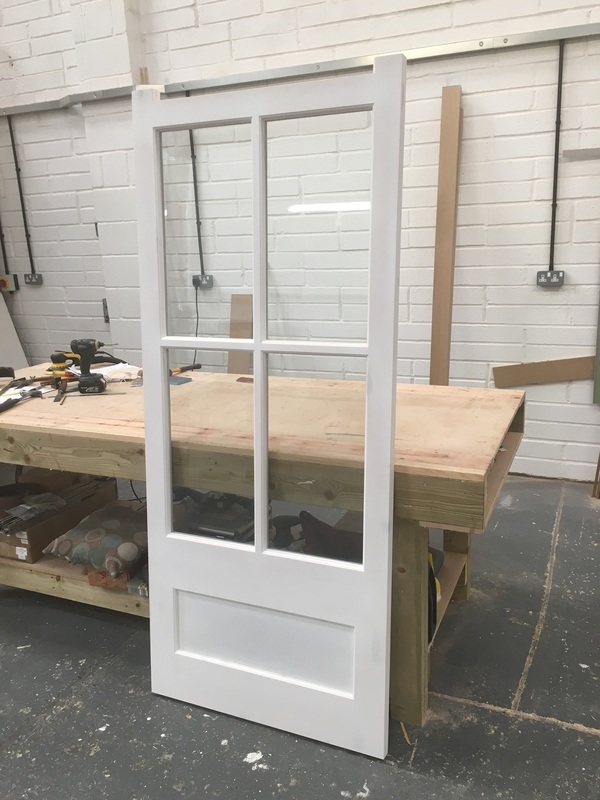 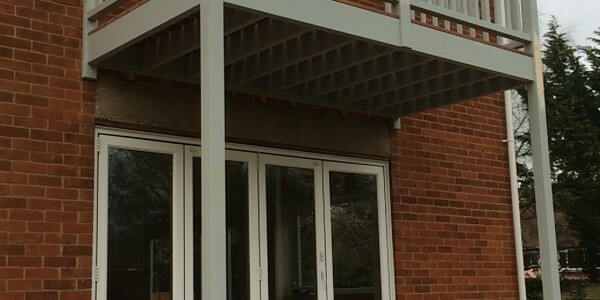 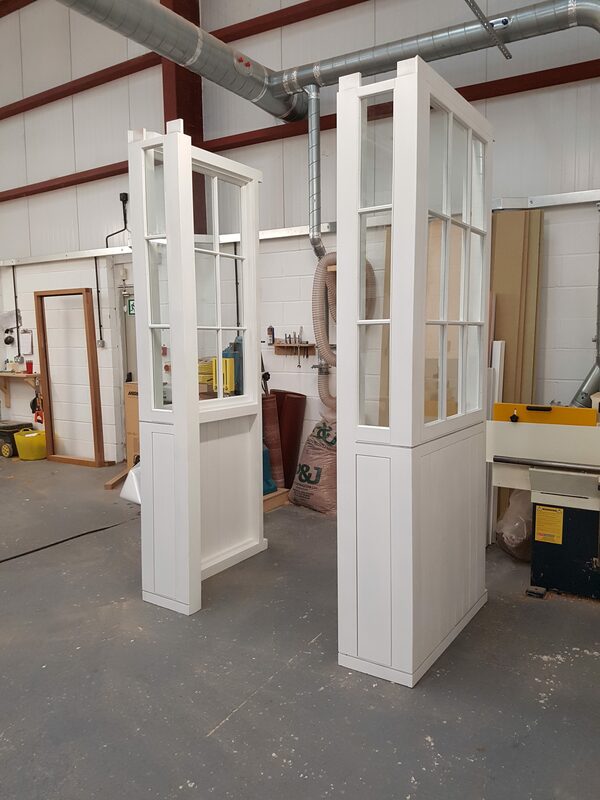 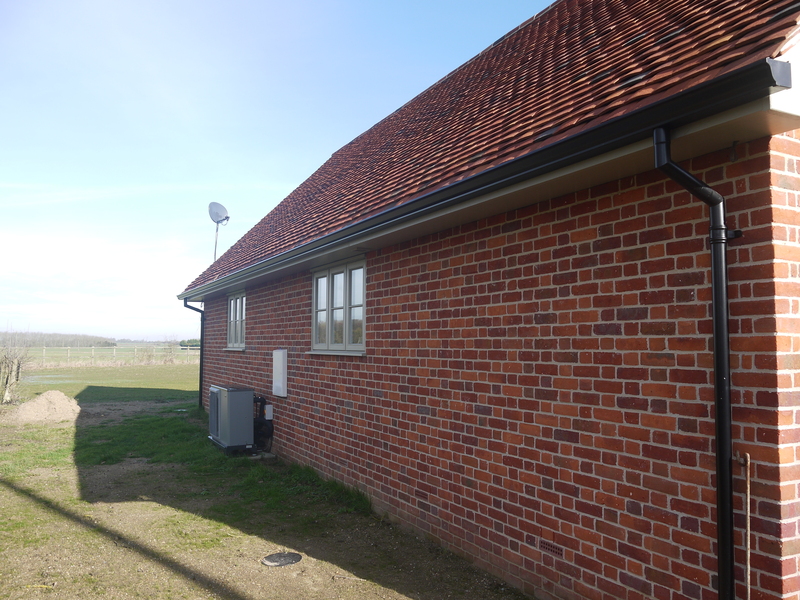 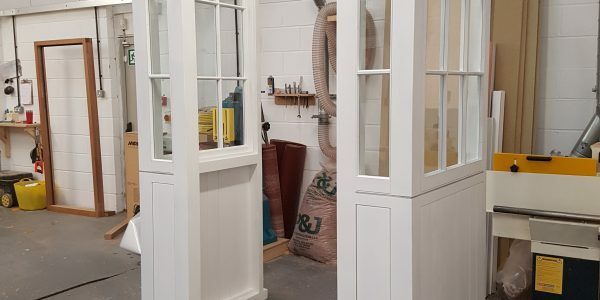 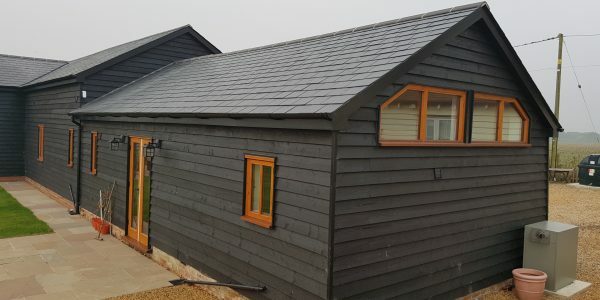 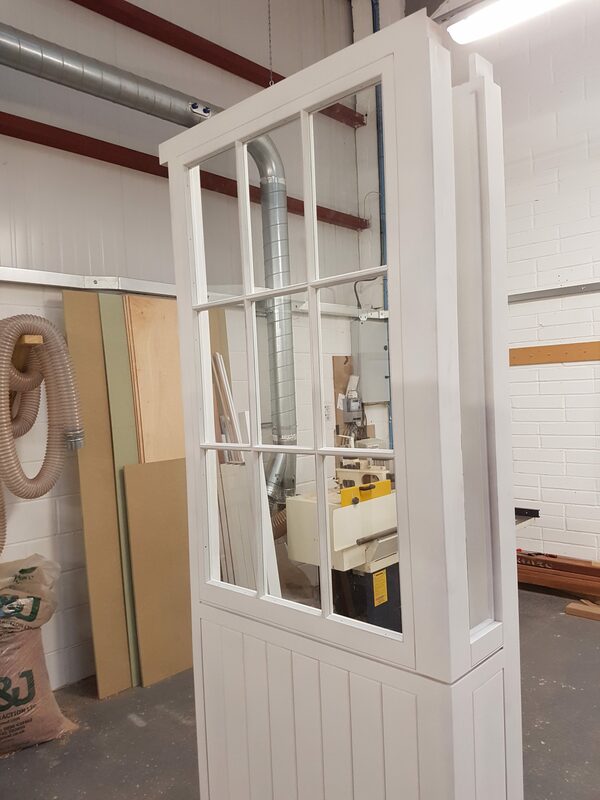 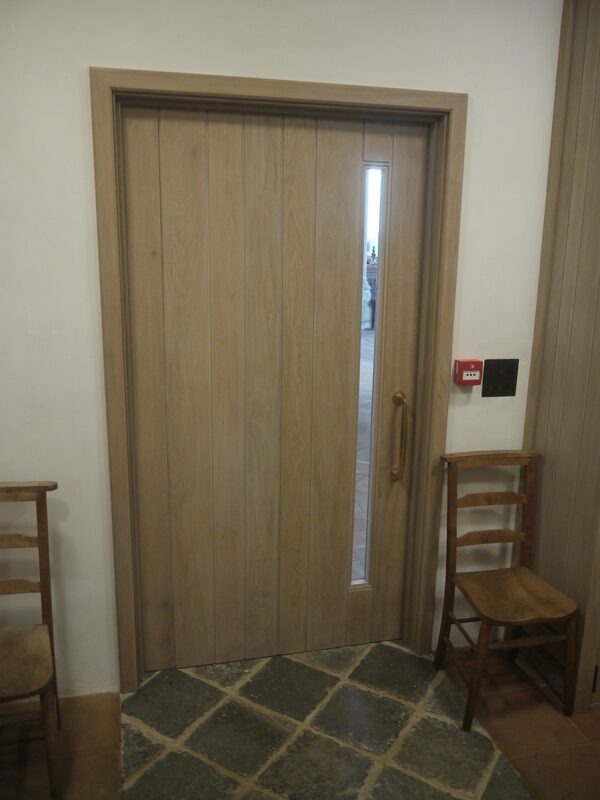 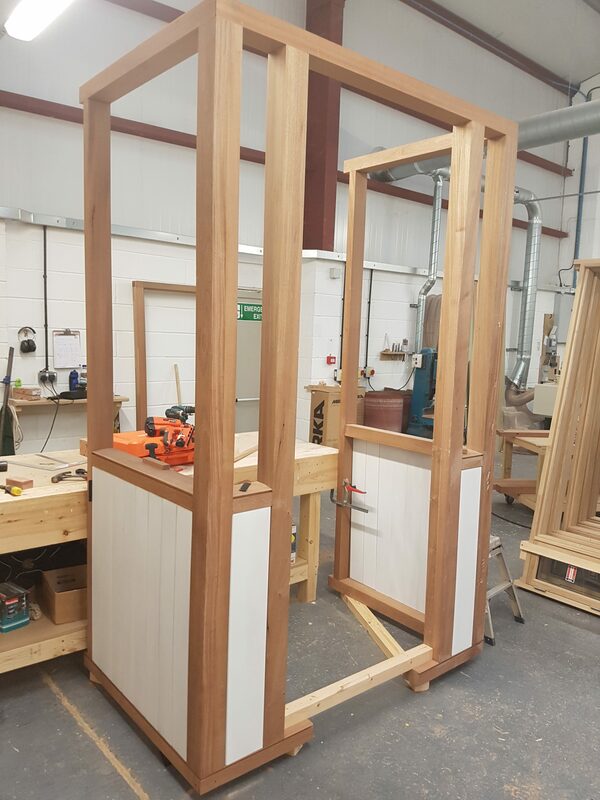 We also supplied an impressive large porch screen, a mobile storage unit, a kitchenette, the main entrance porch and the fitting for the shop area. 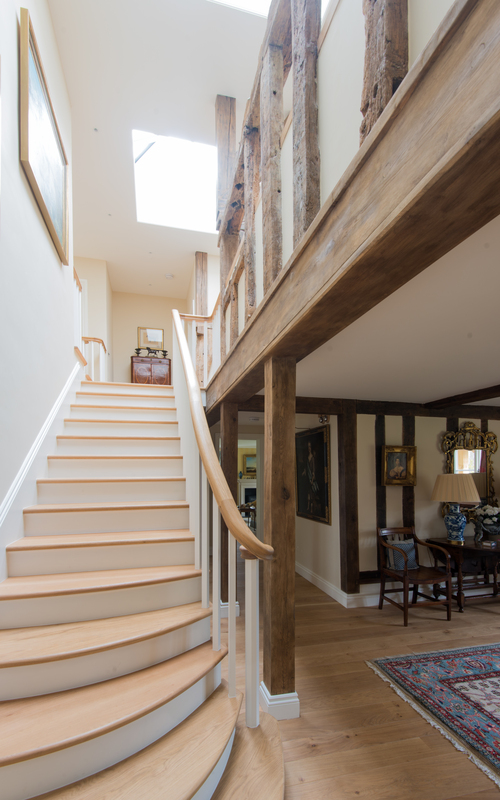 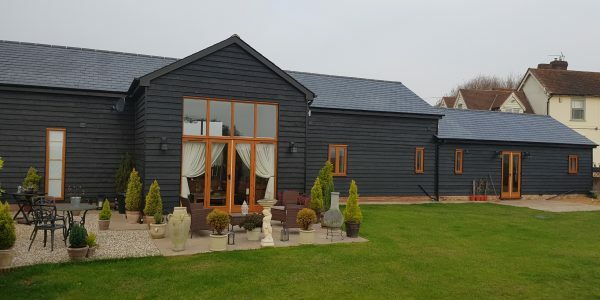 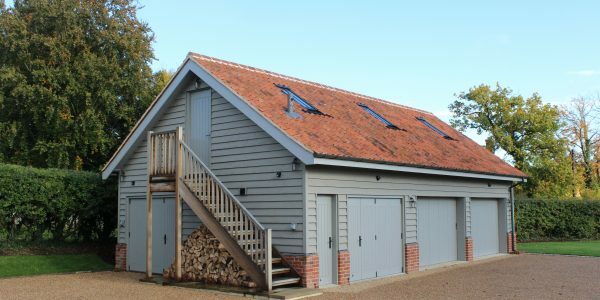 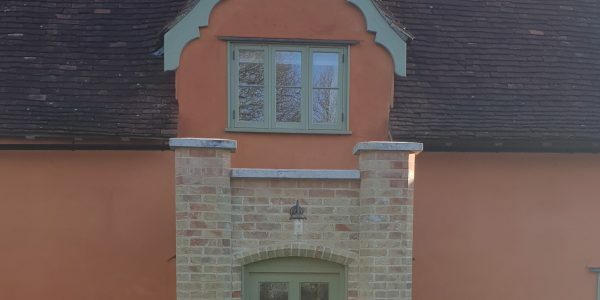 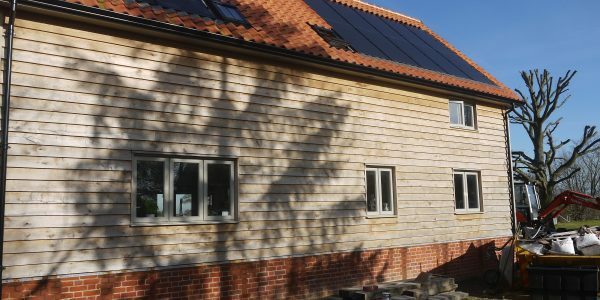 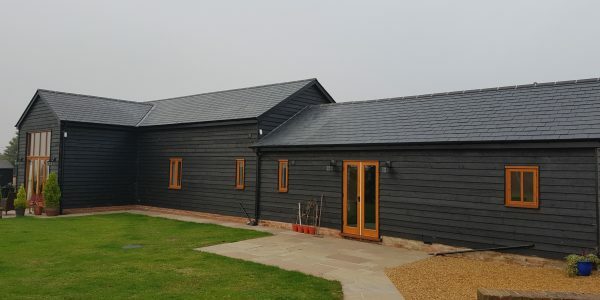 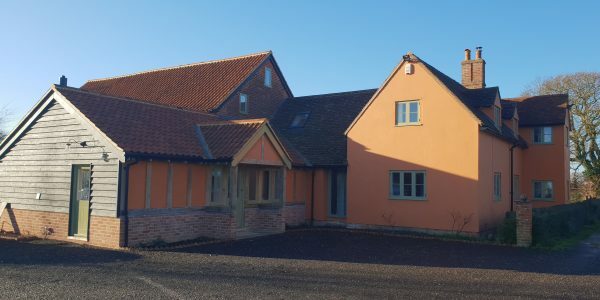 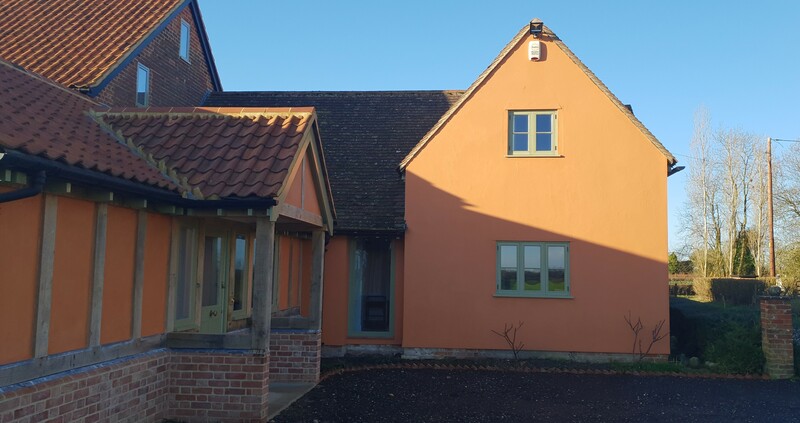 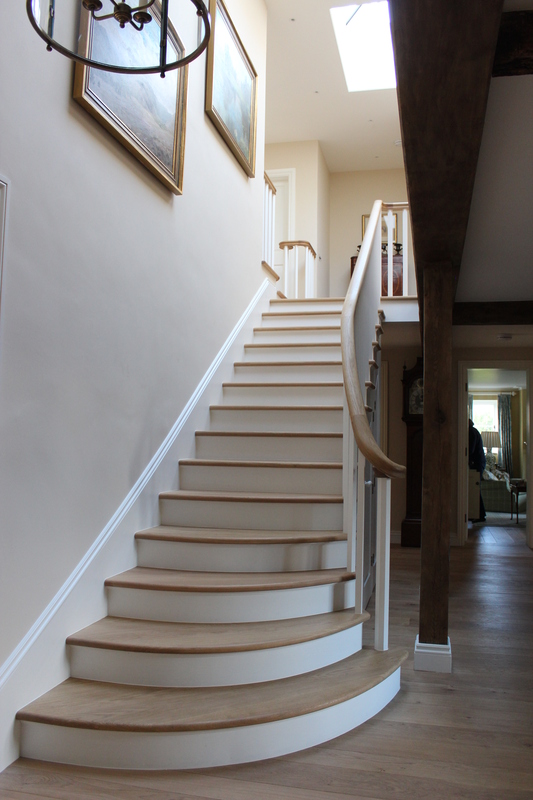 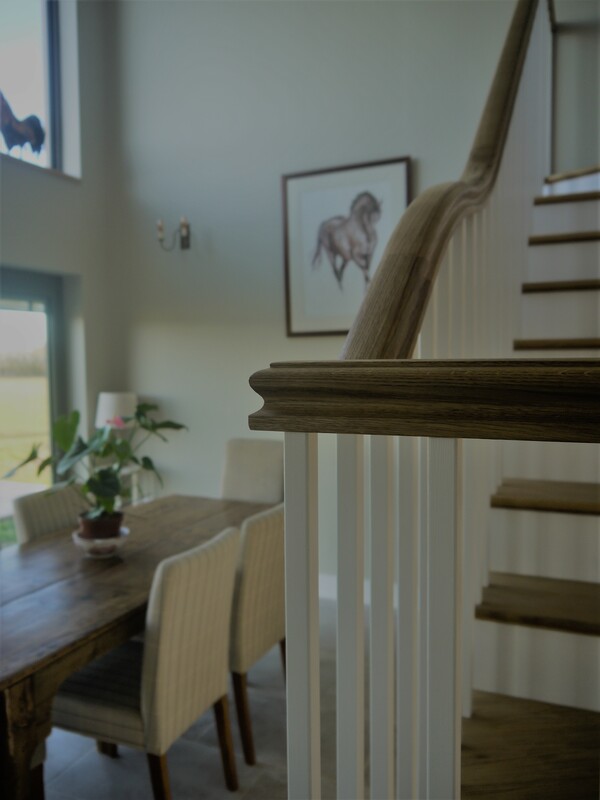 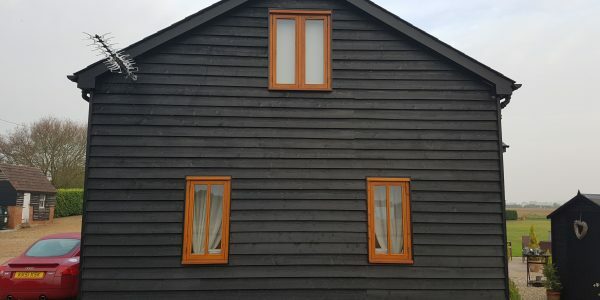 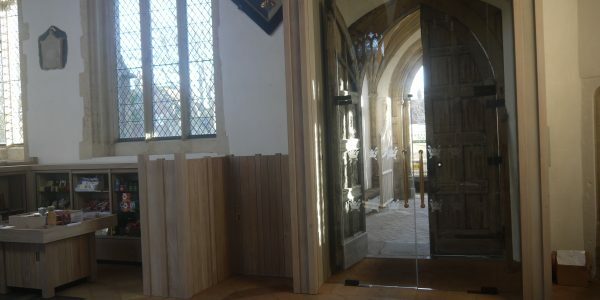 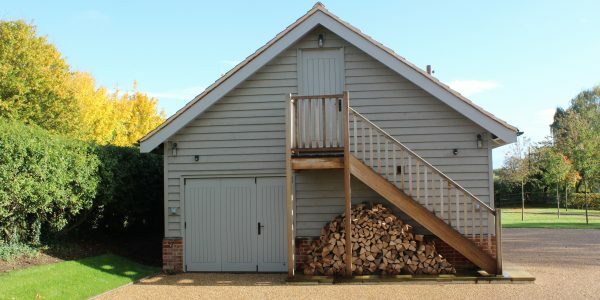 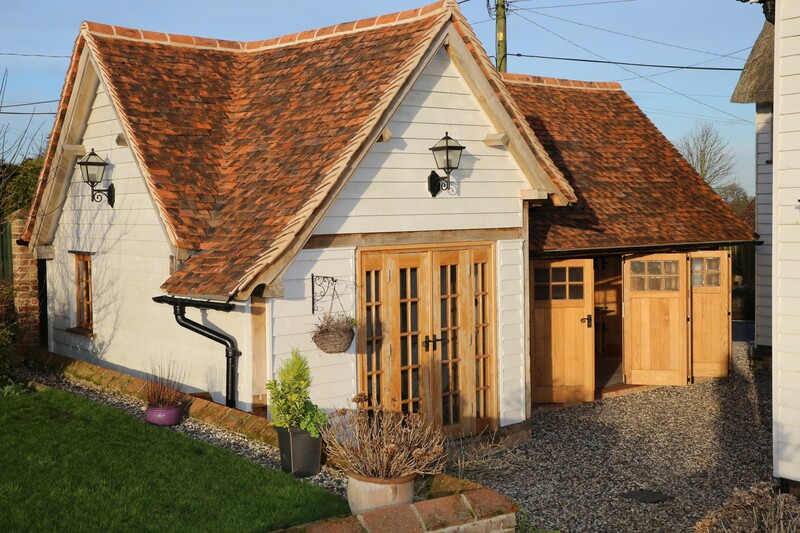 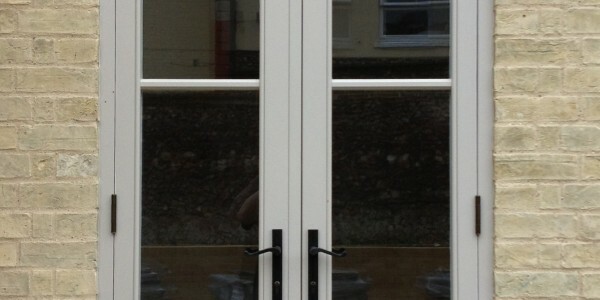 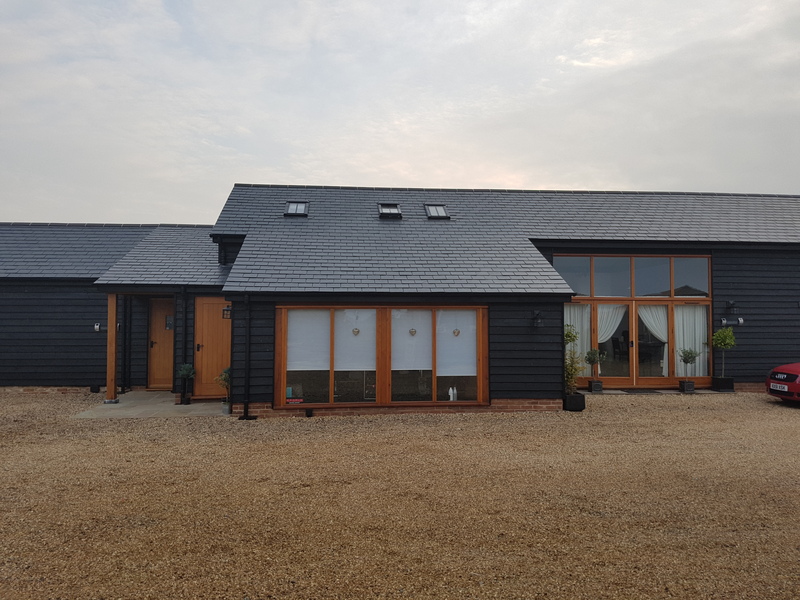 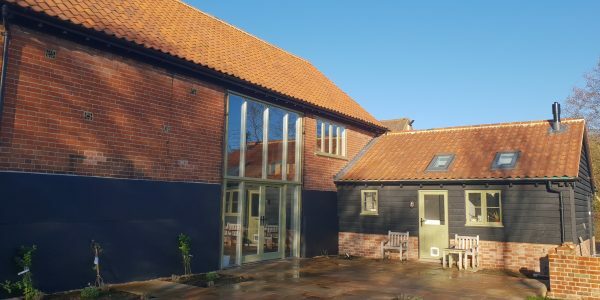 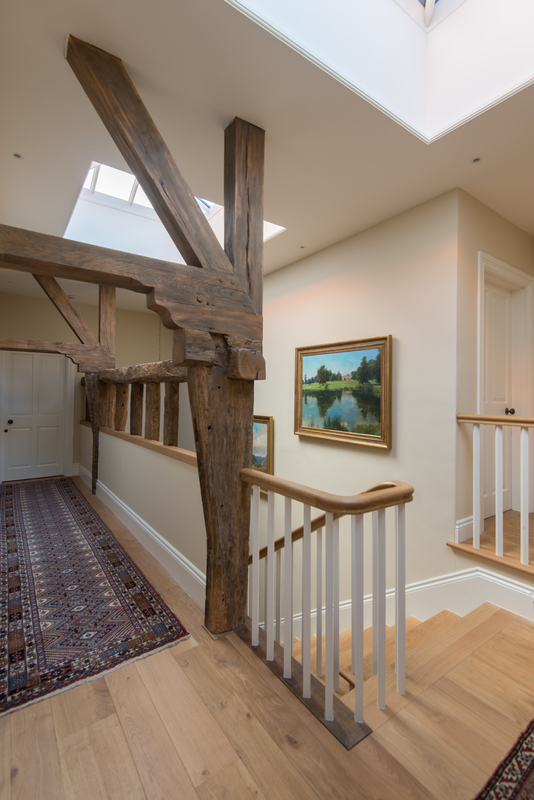 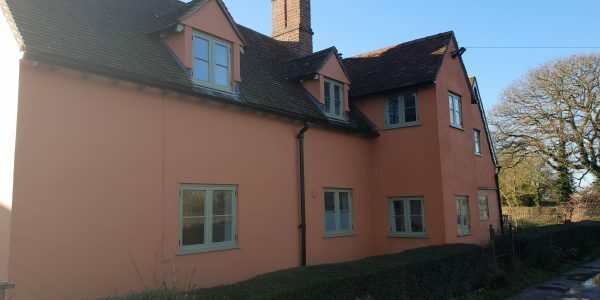 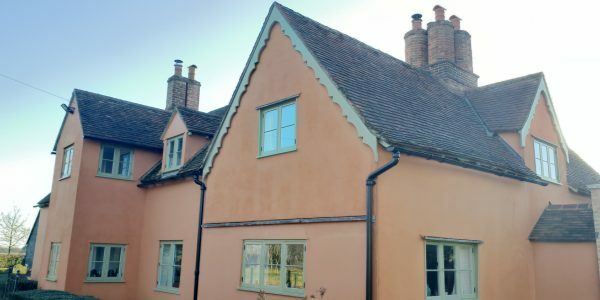 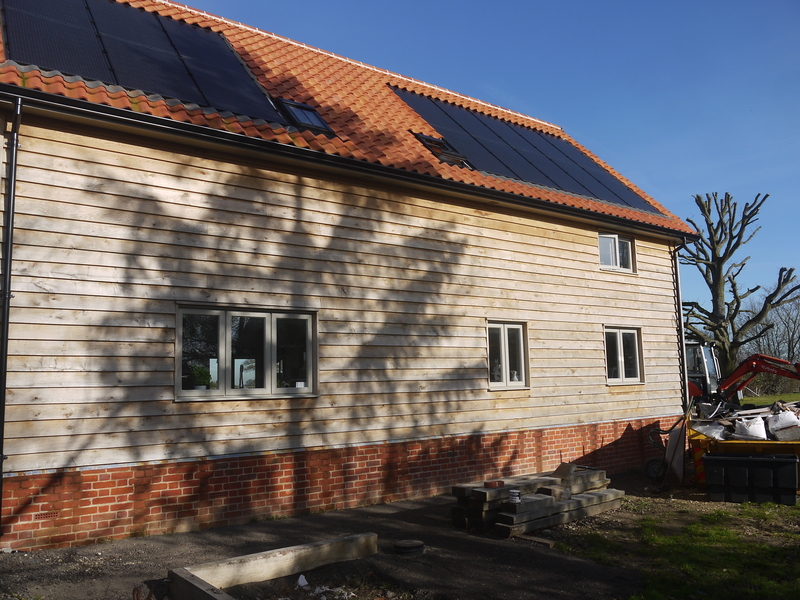 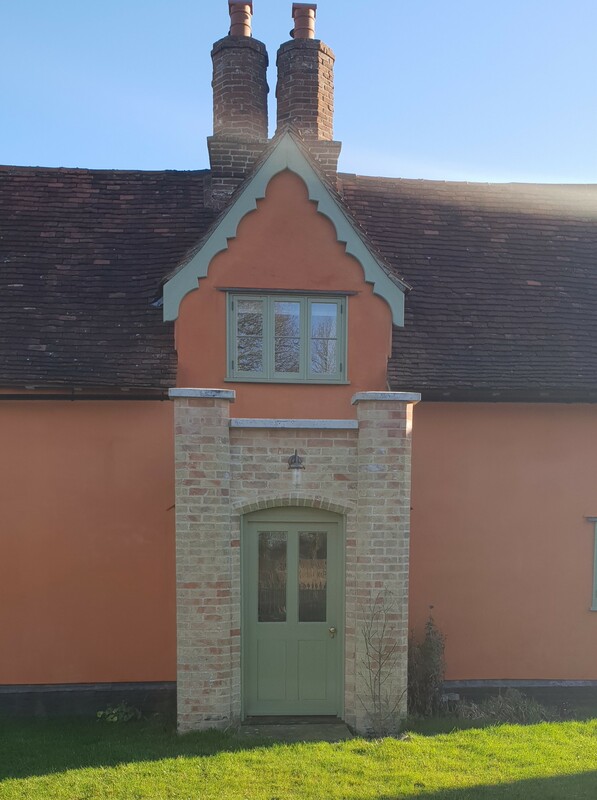 We were commissioned by local restoration builders to supply the joinery for this exceptional house in Denston, Suffolk. 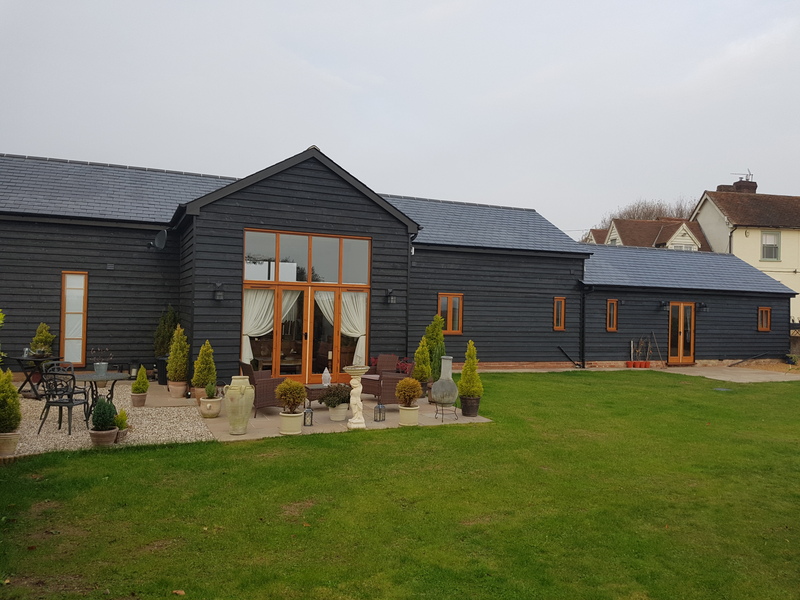 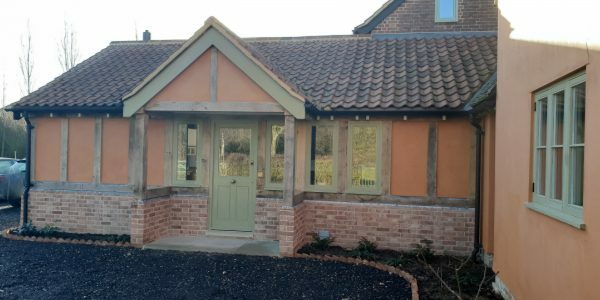 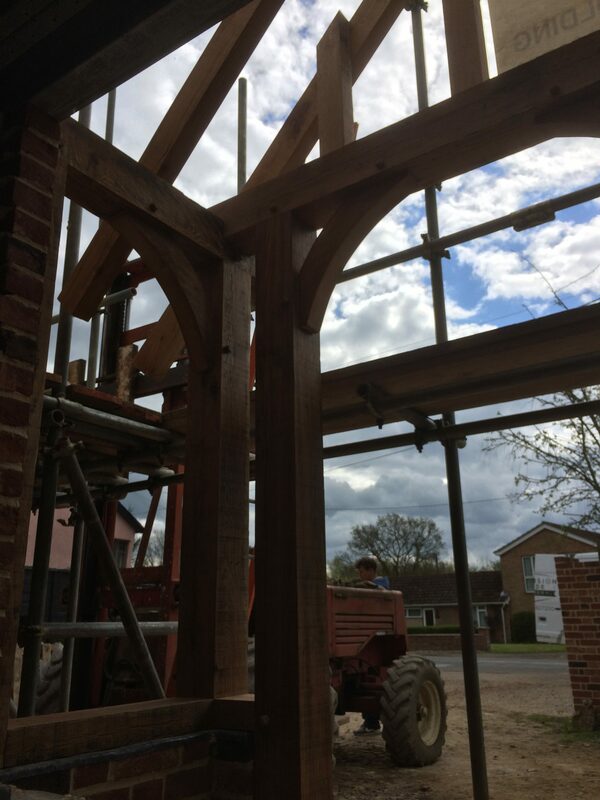 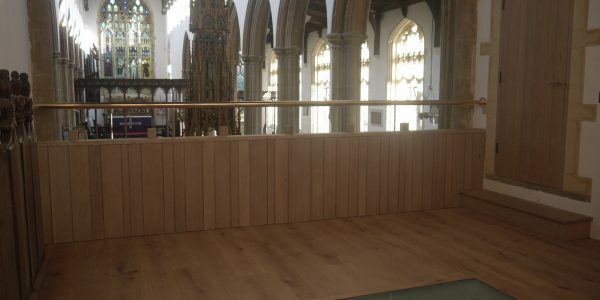 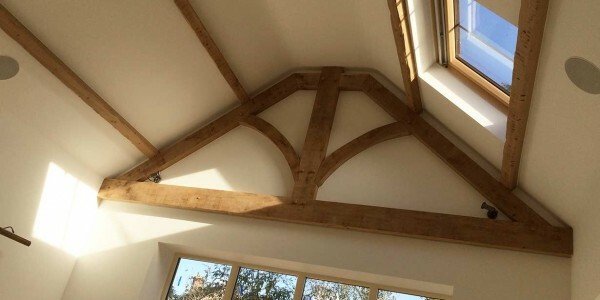 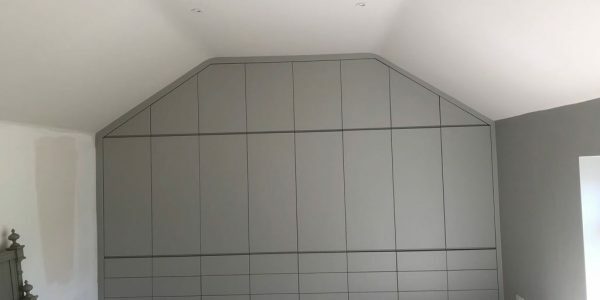 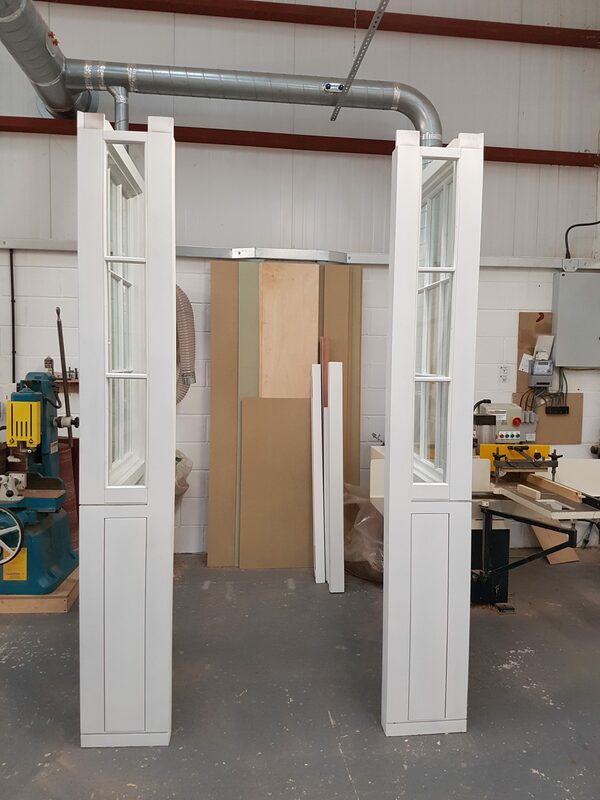 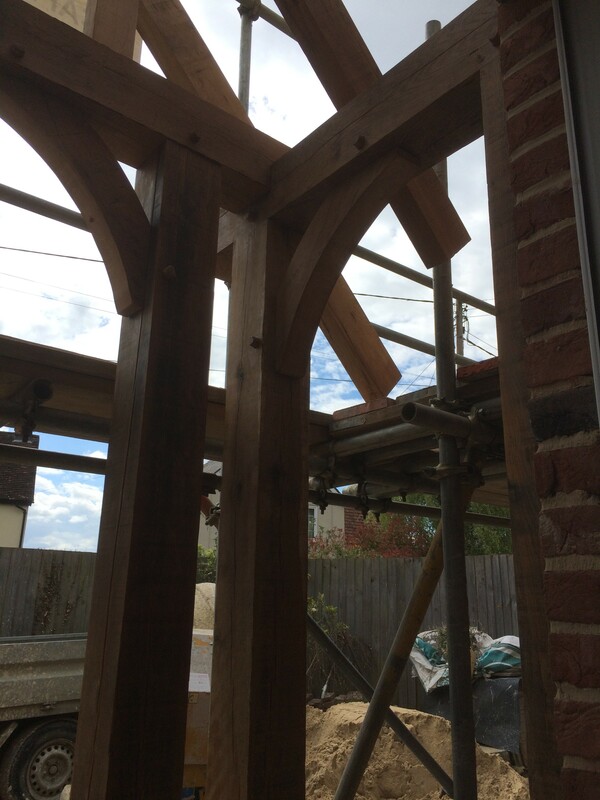 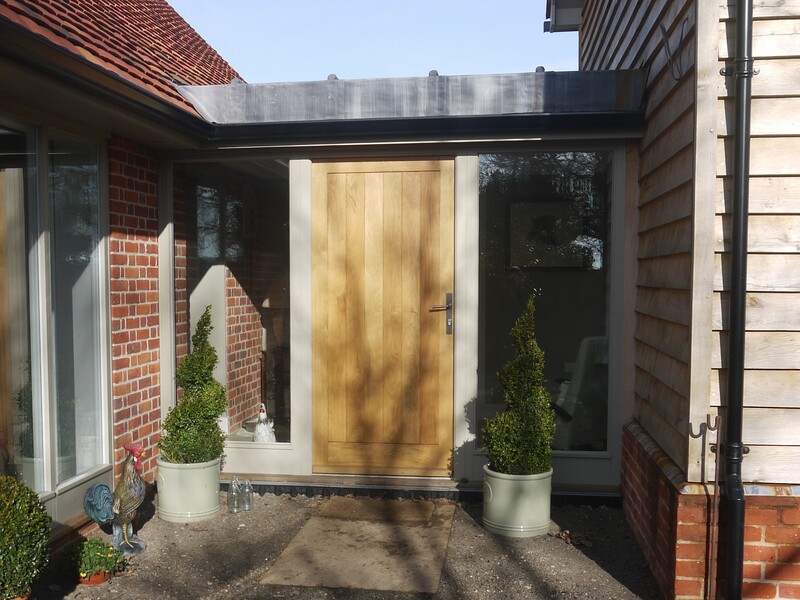 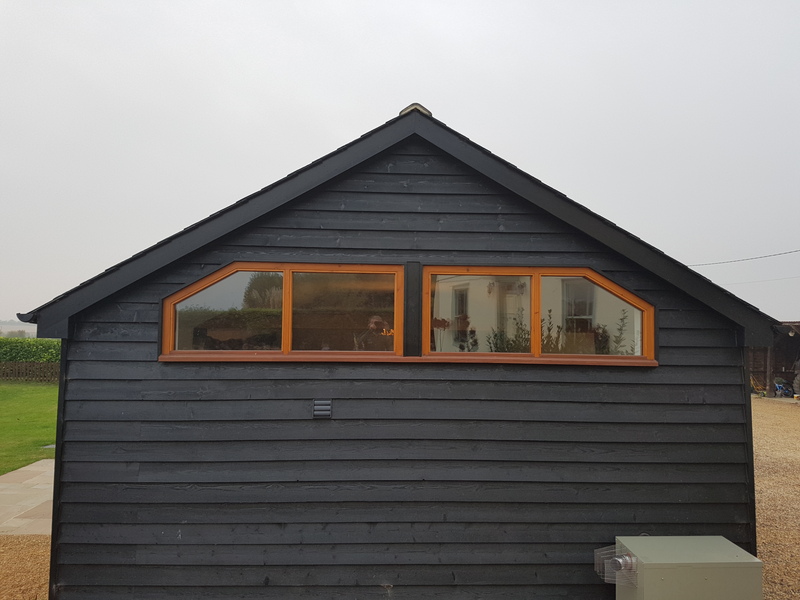 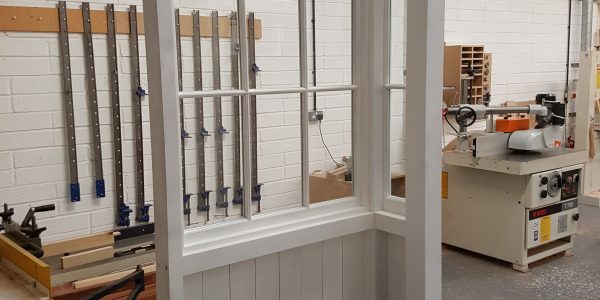 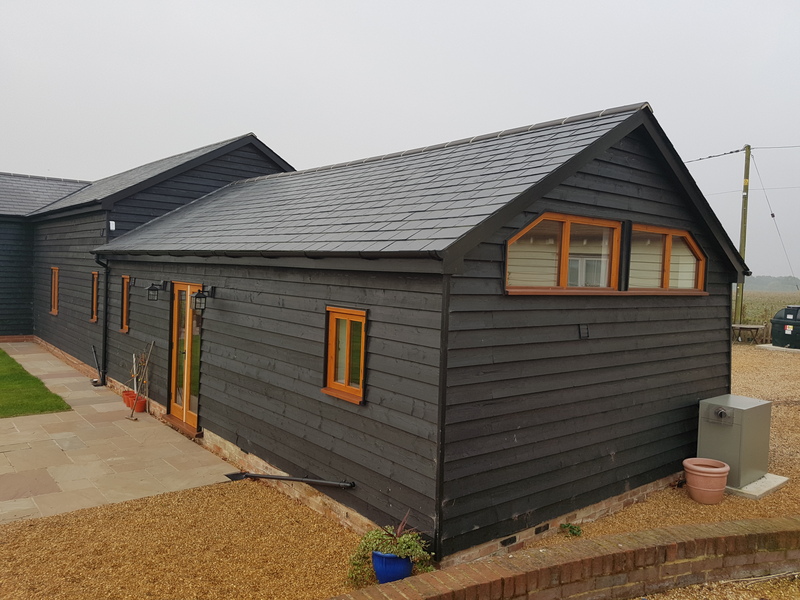 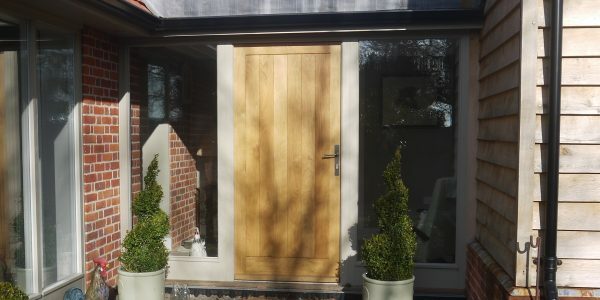 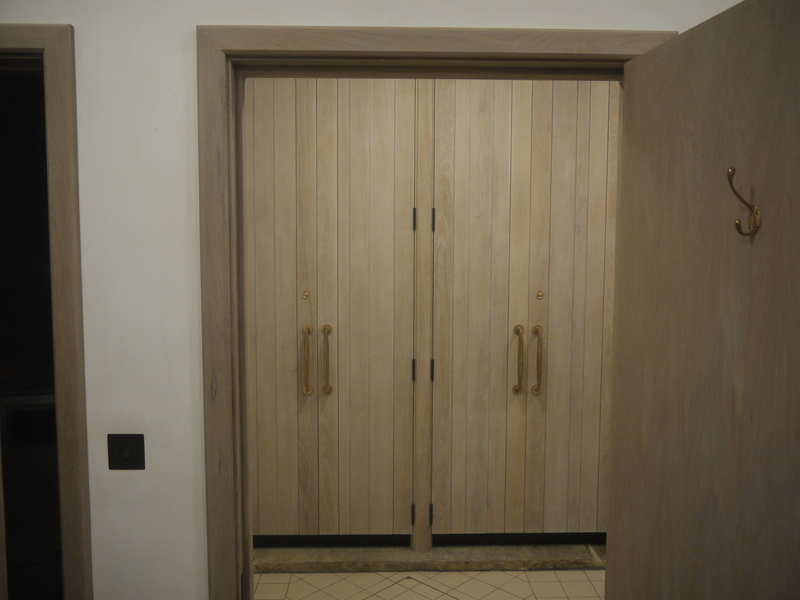 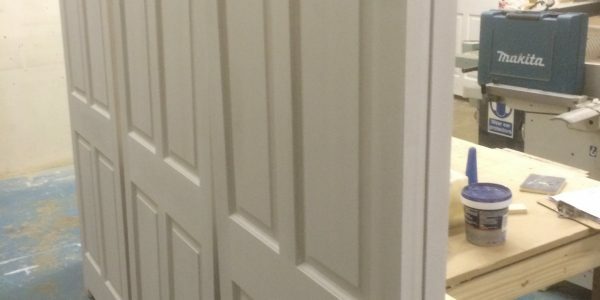 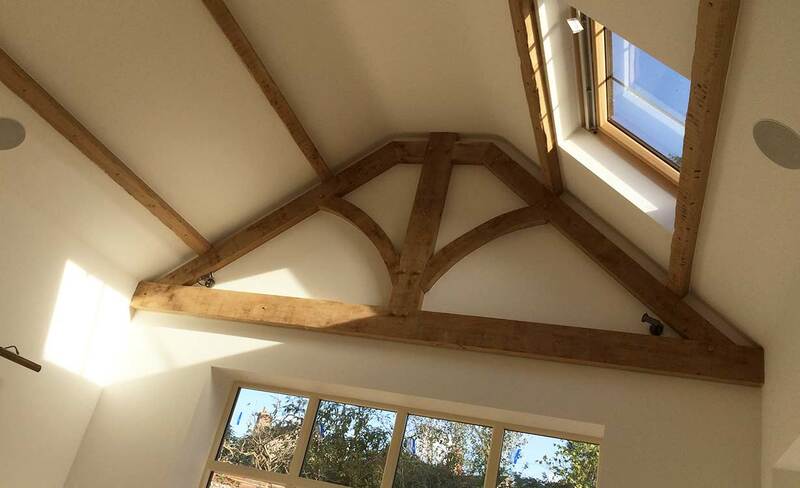 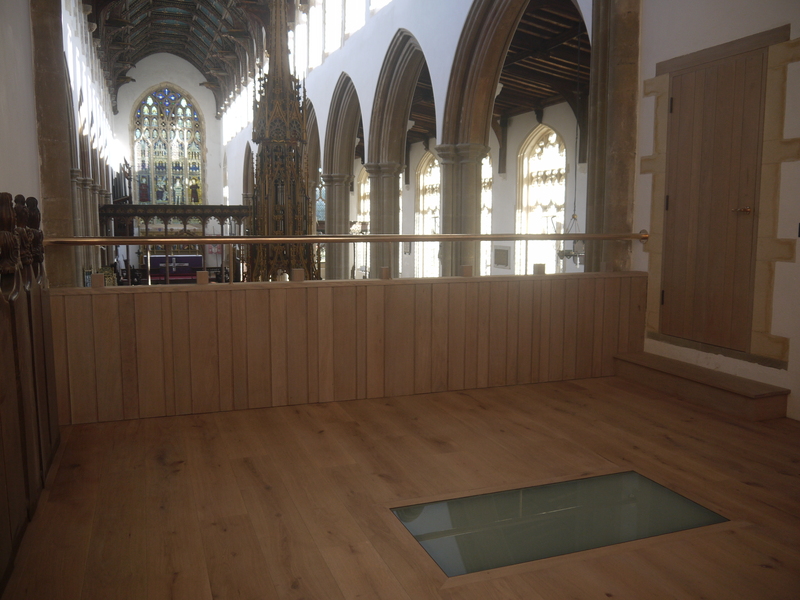 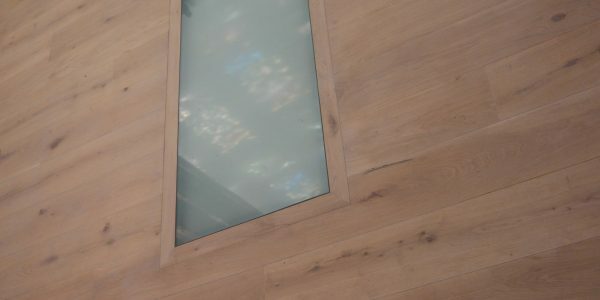 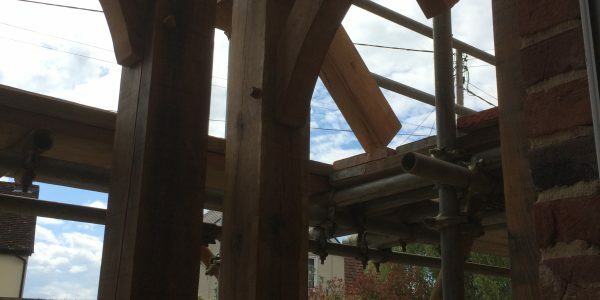 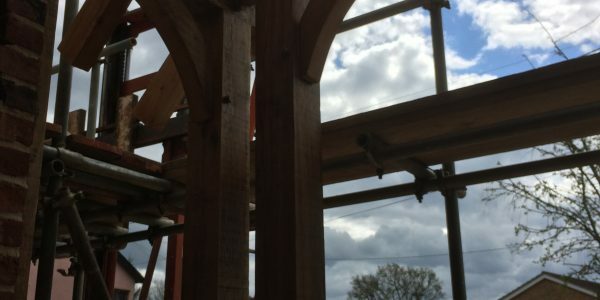 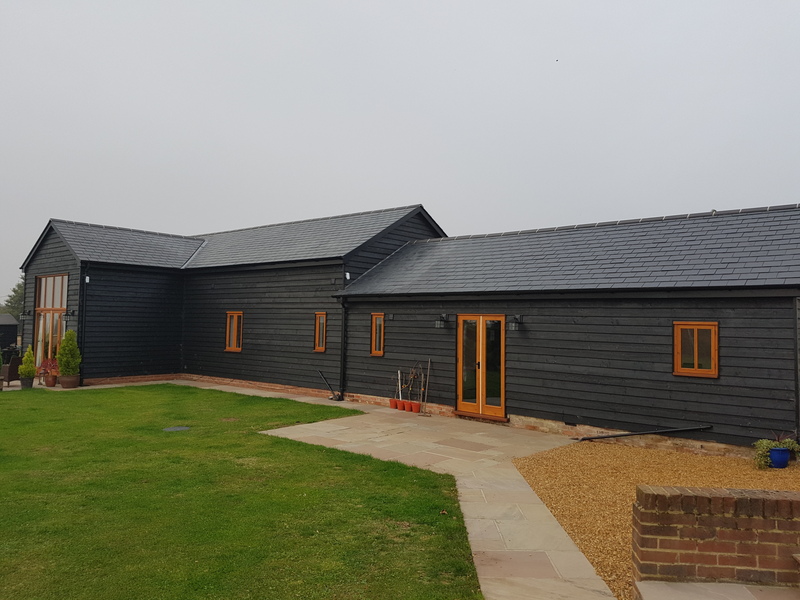 We worked alongside the architect and the contractor to ensure our joinery met with their requirements and overall time frame. 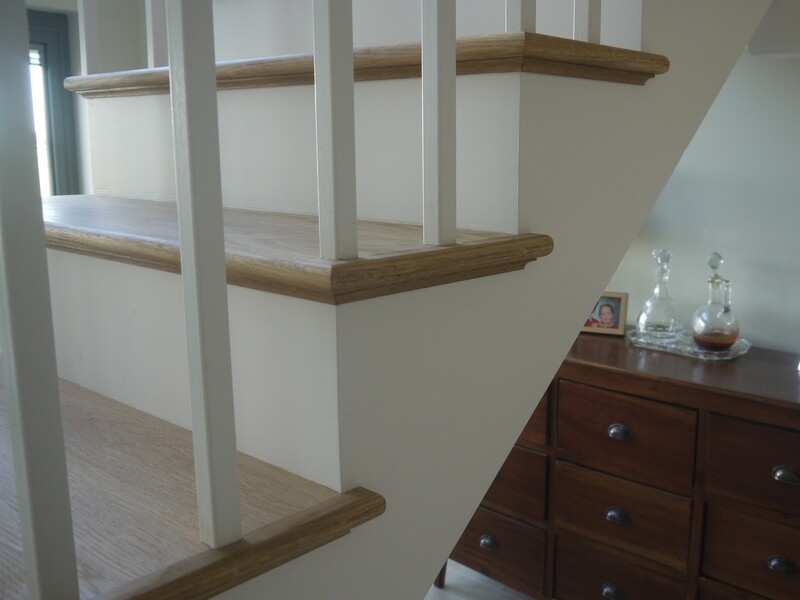 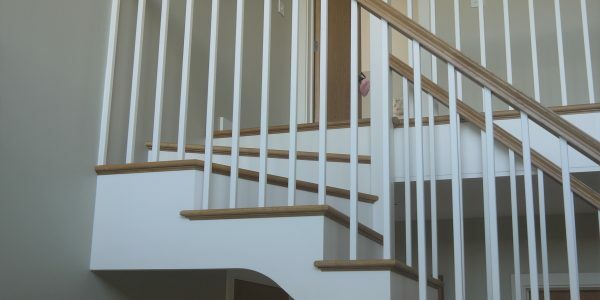 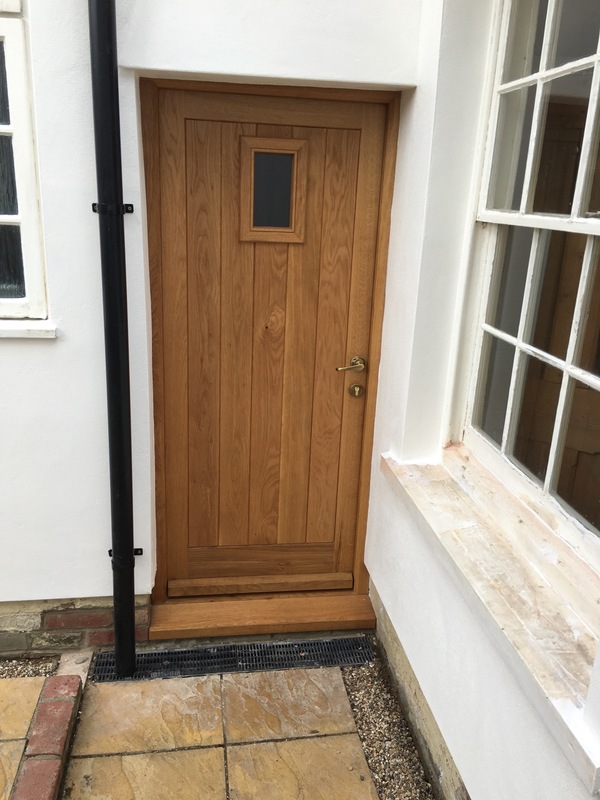 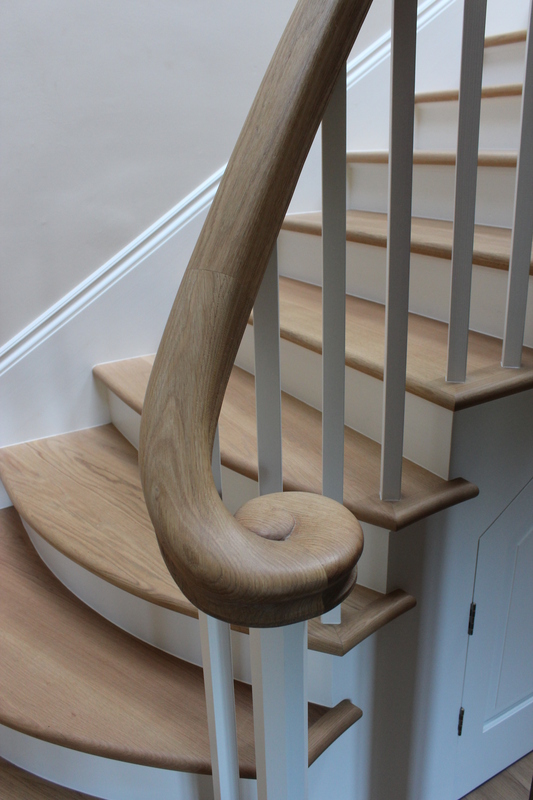 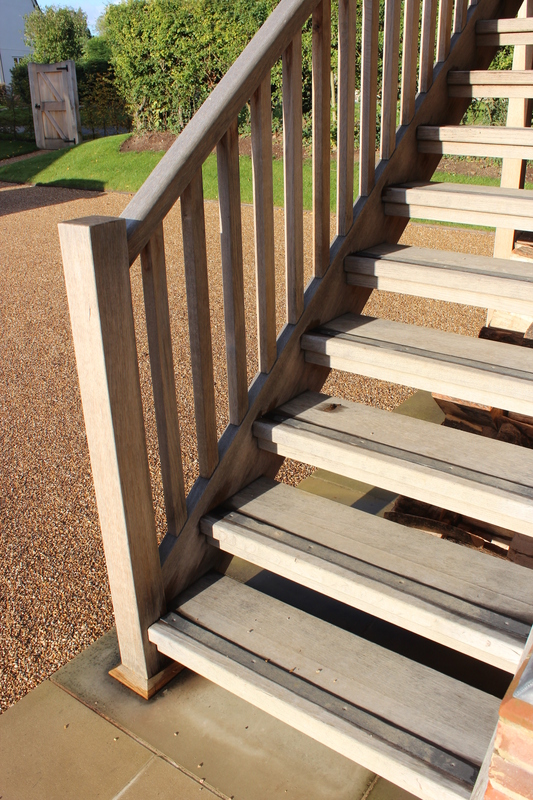 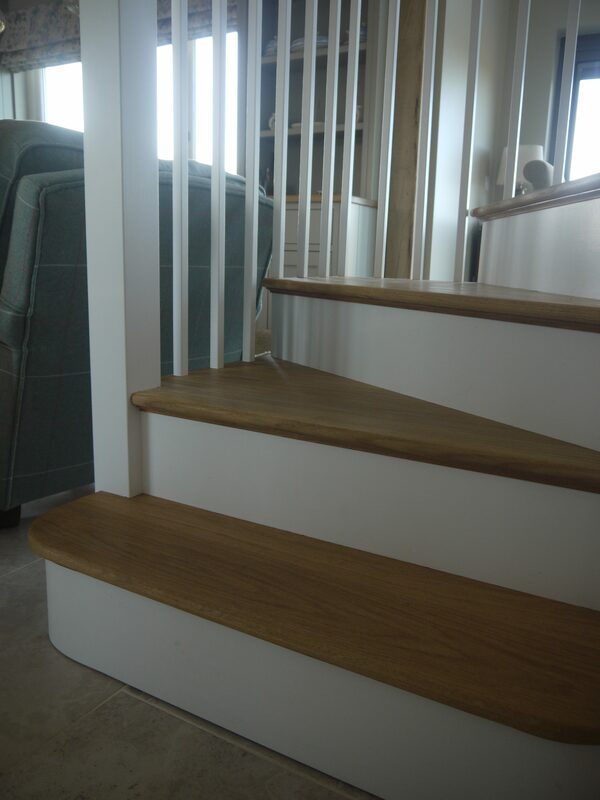 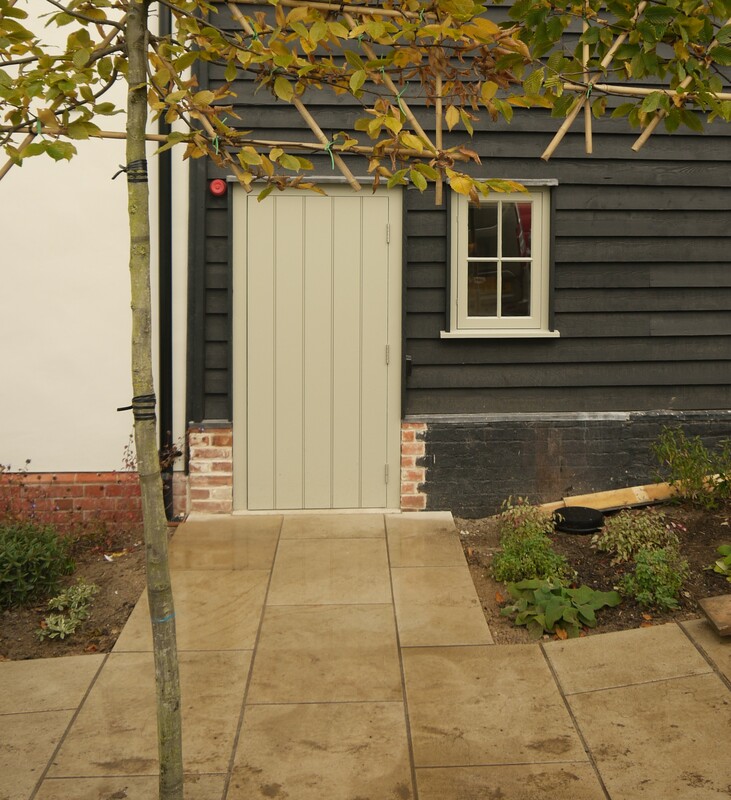 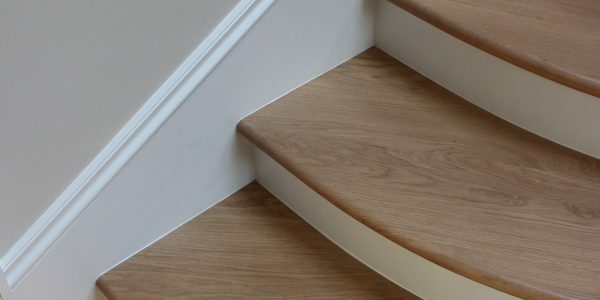 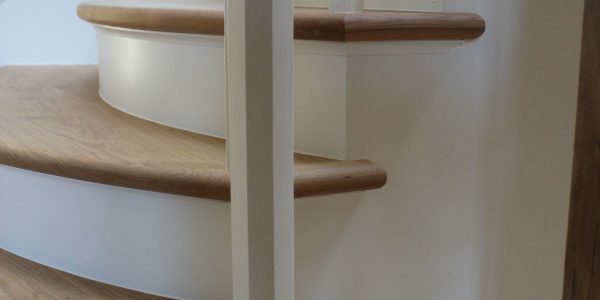 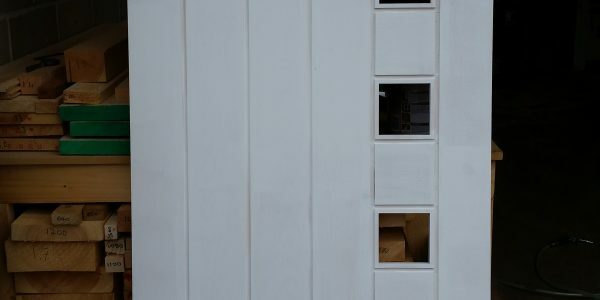 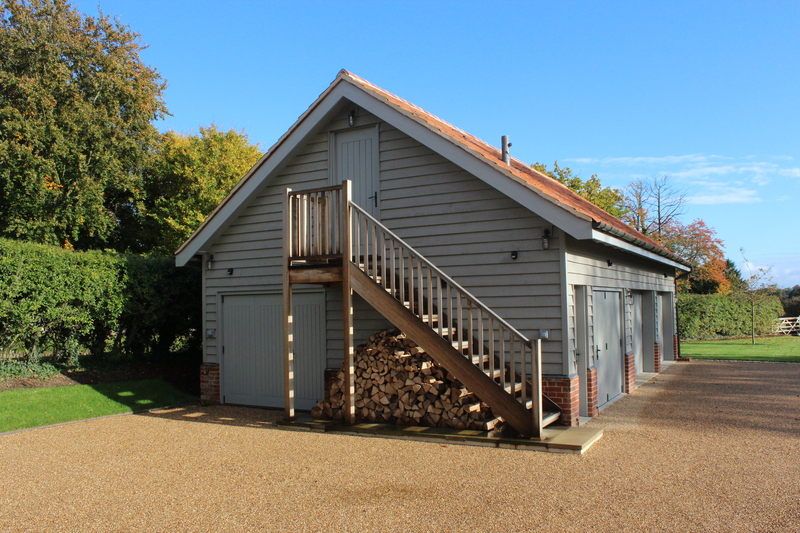 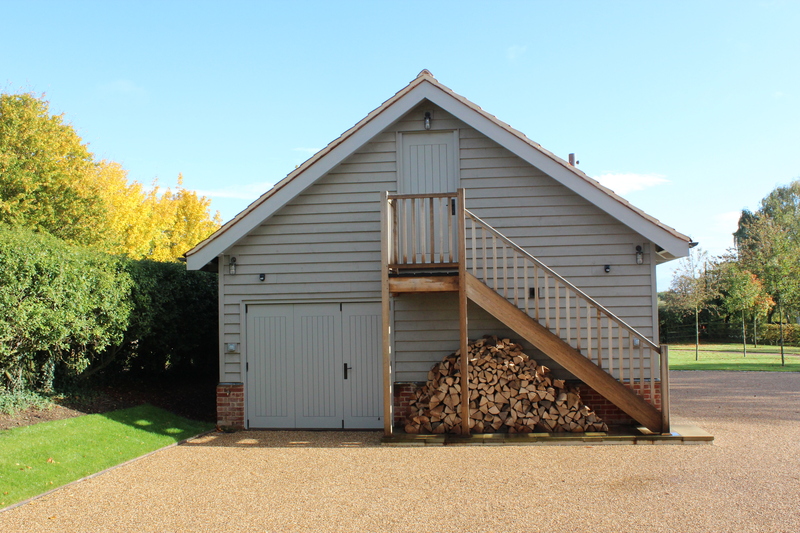 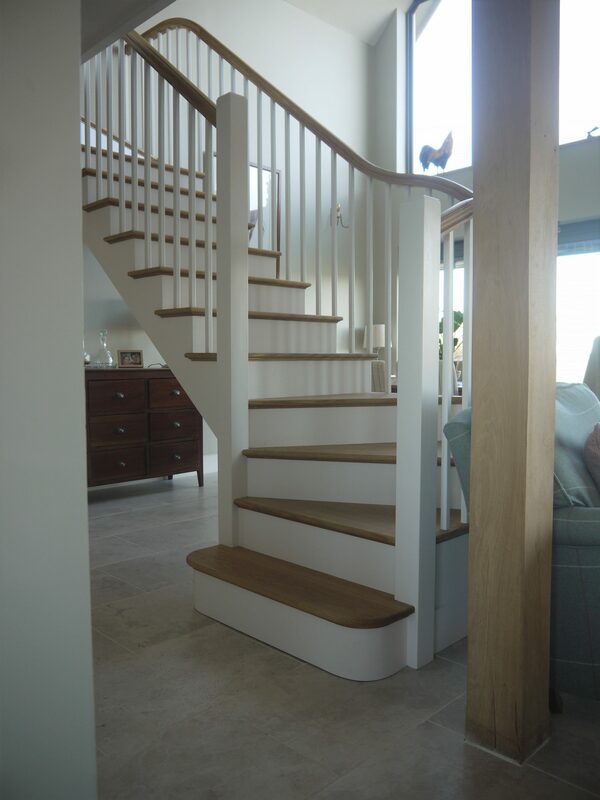 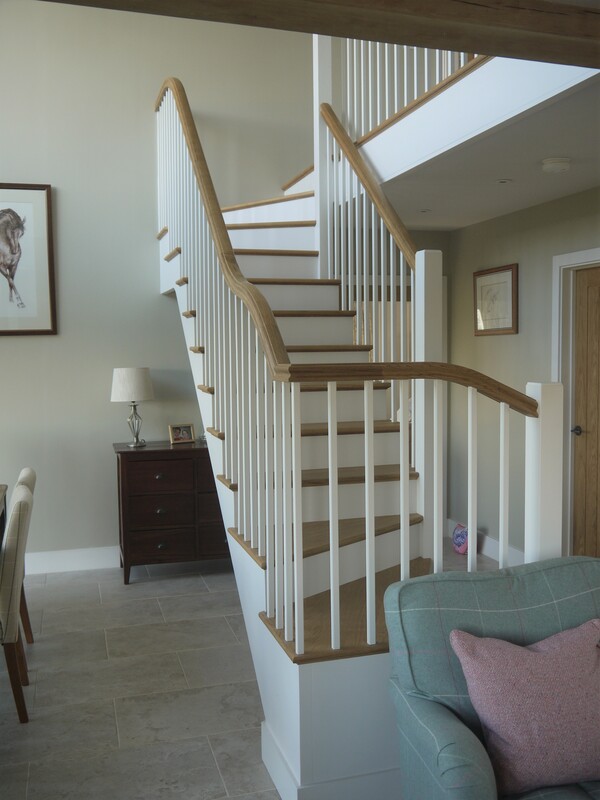 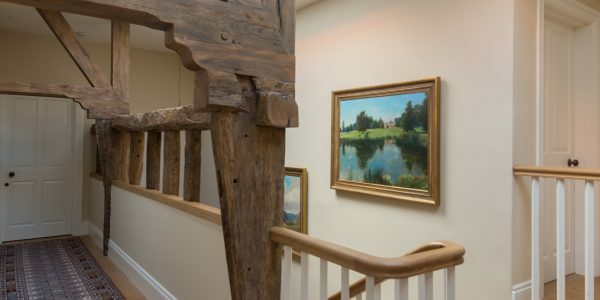 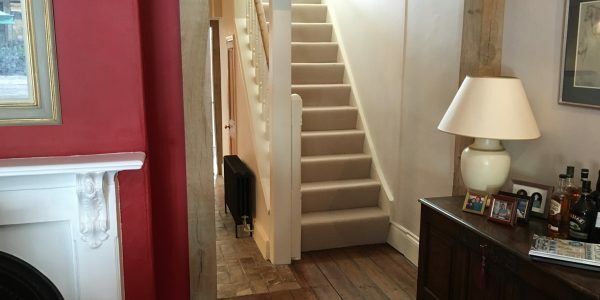 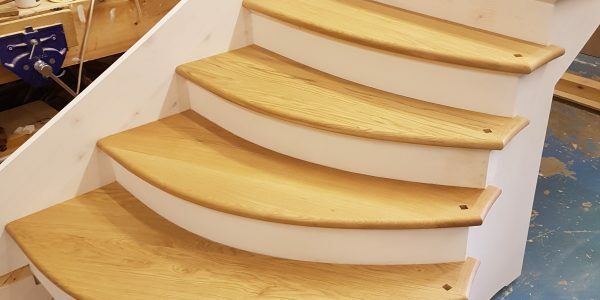 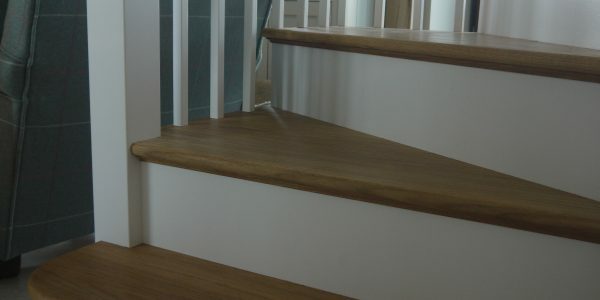 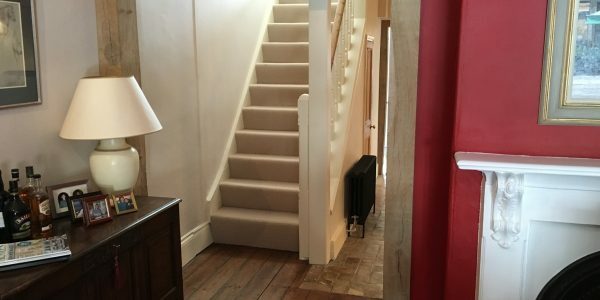 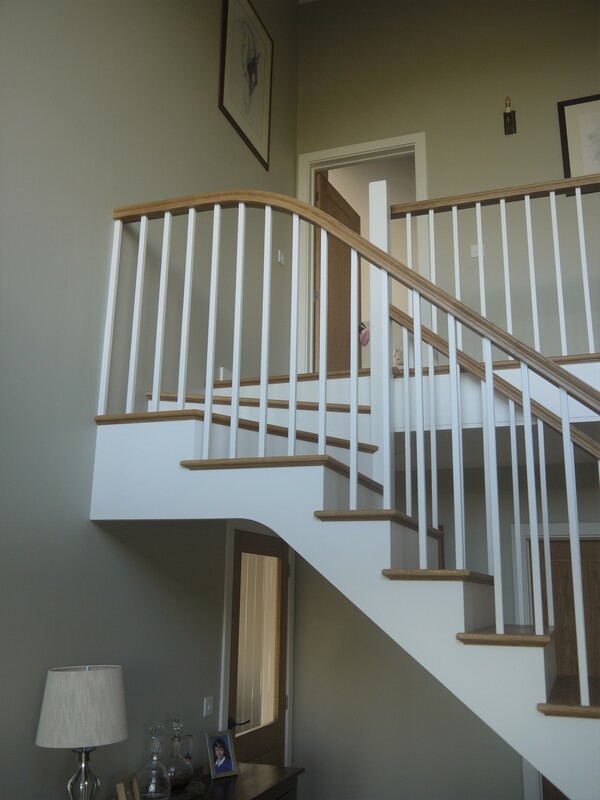 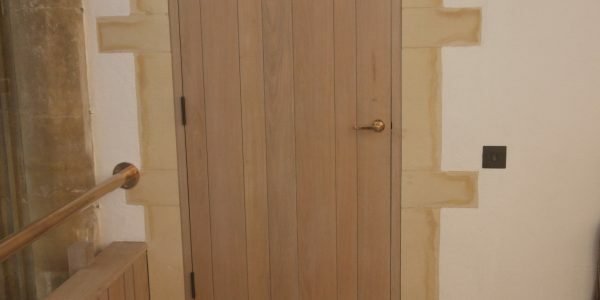 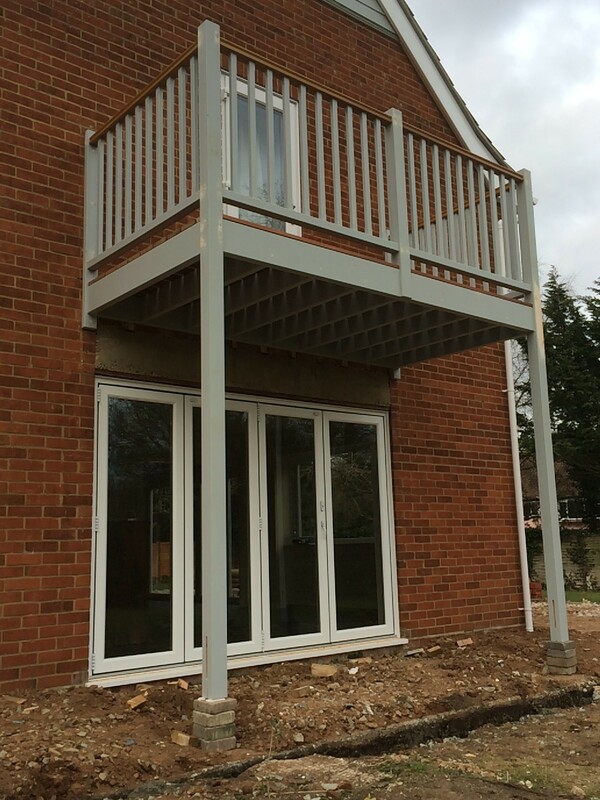 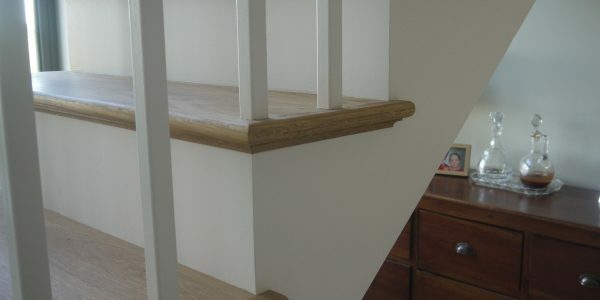 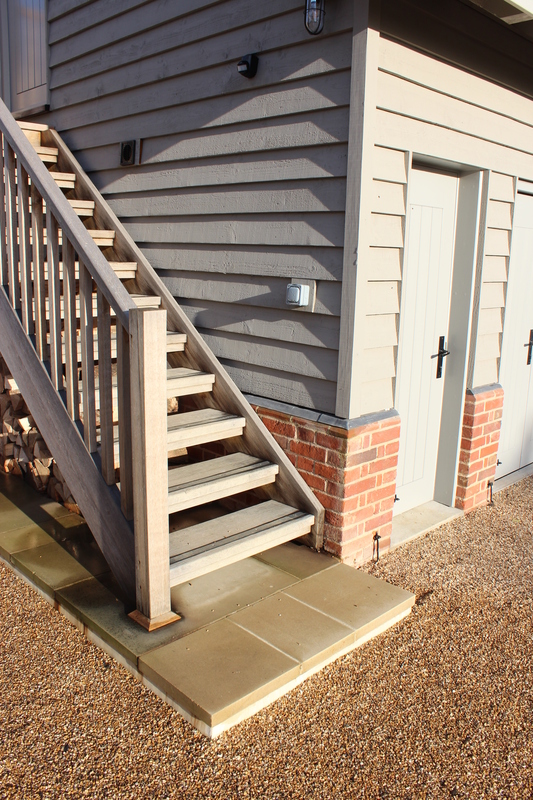 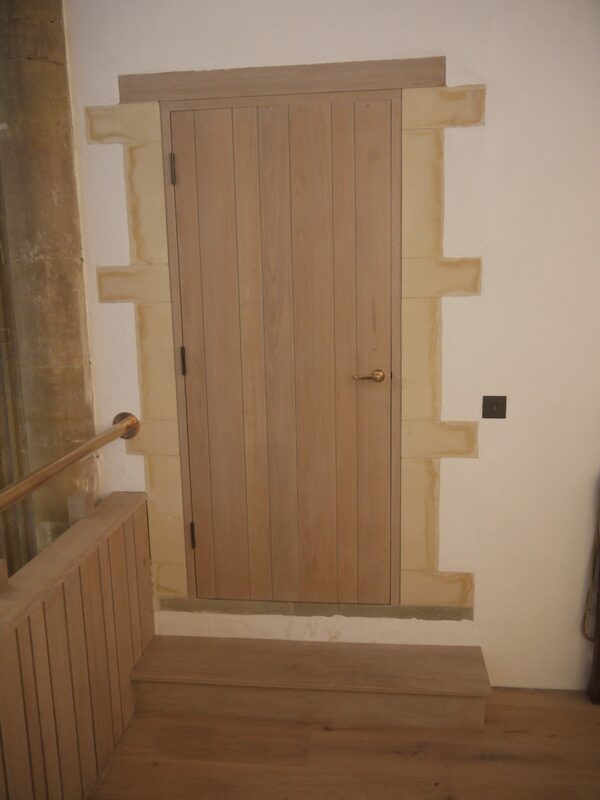 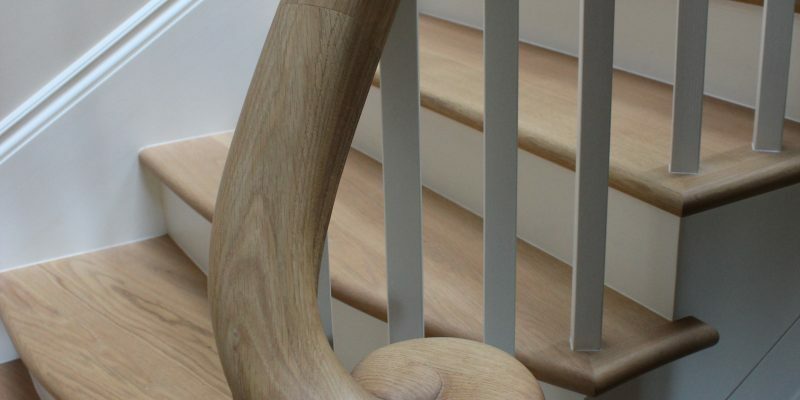 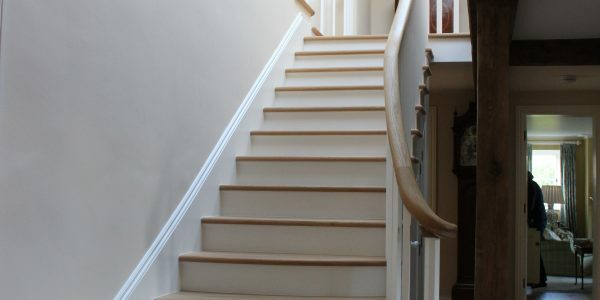 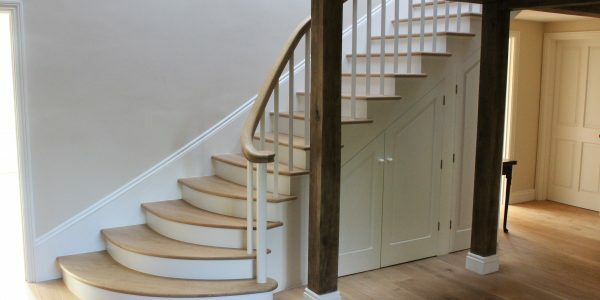 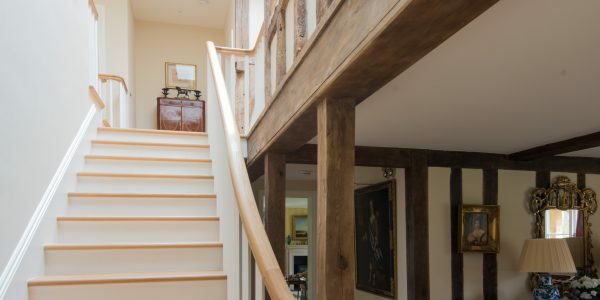 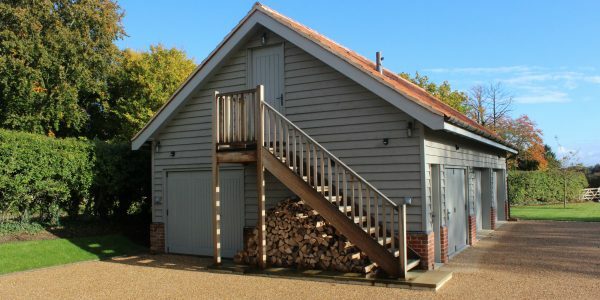 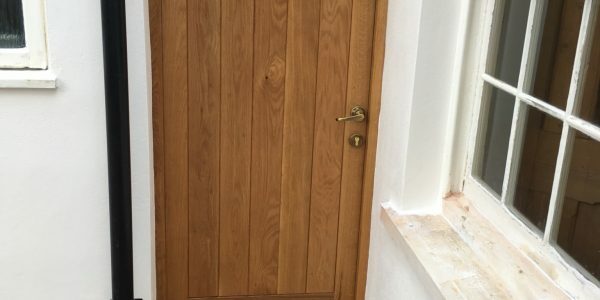 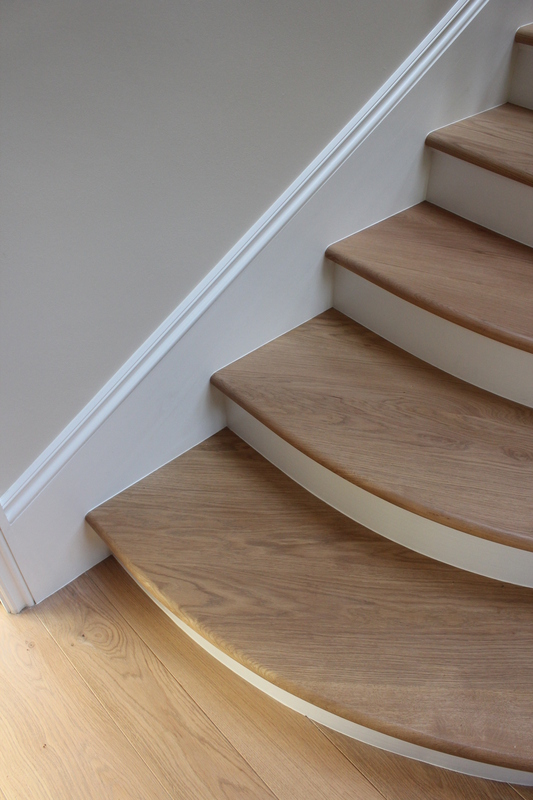 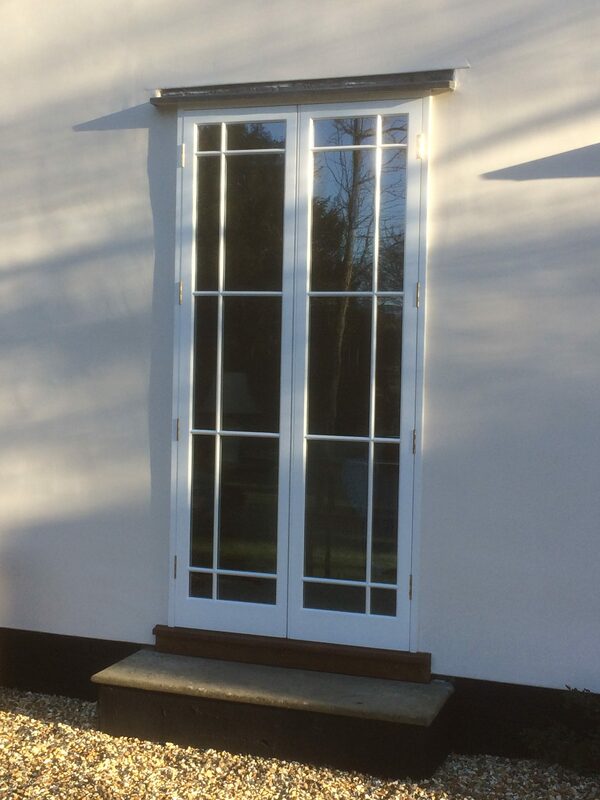 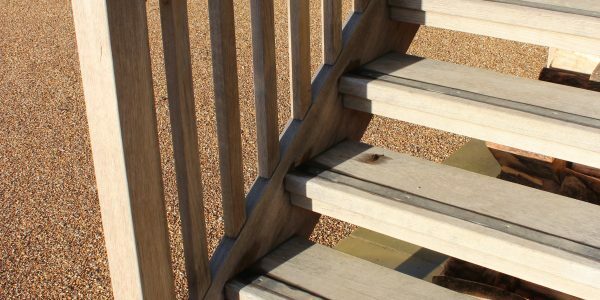 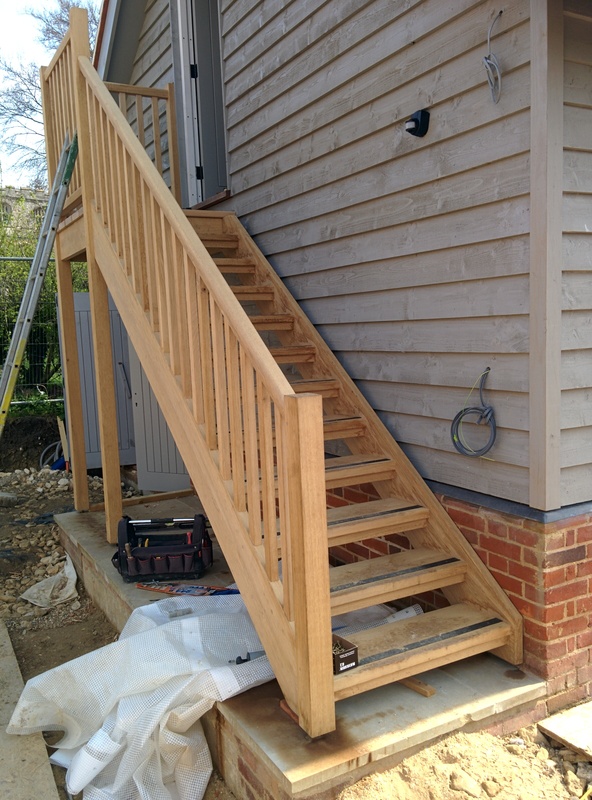 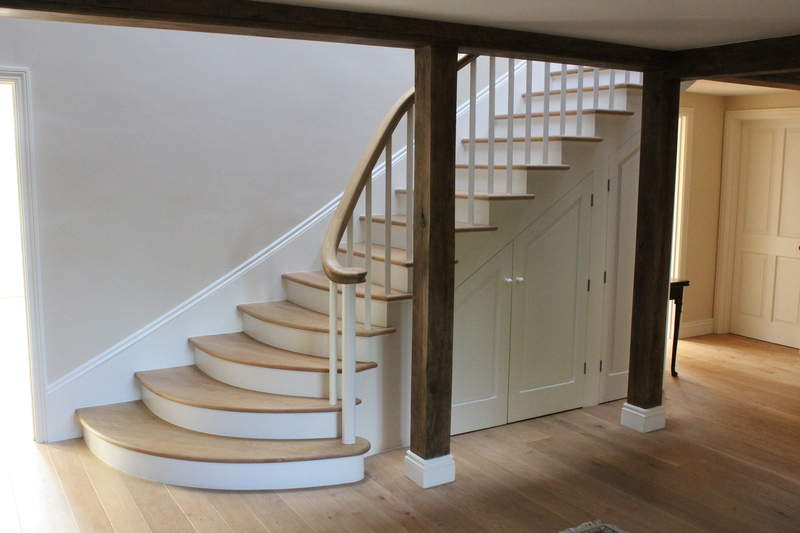 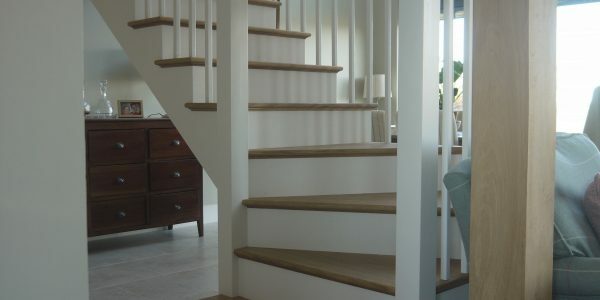 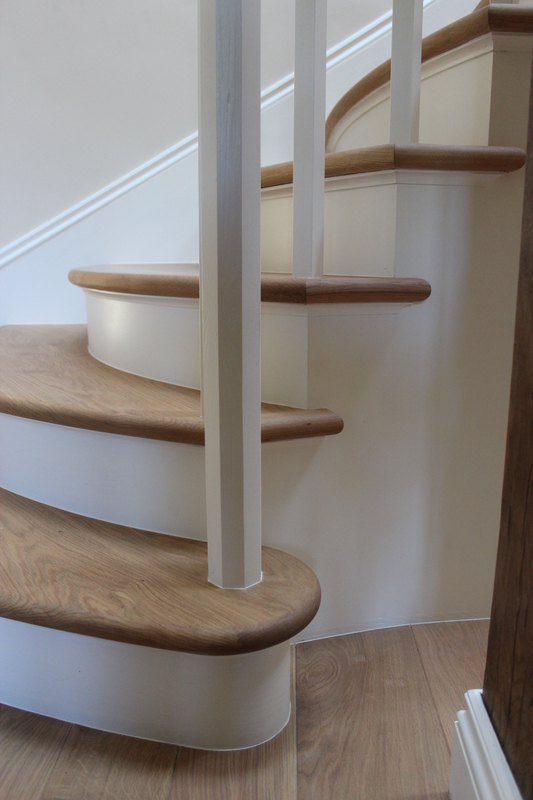 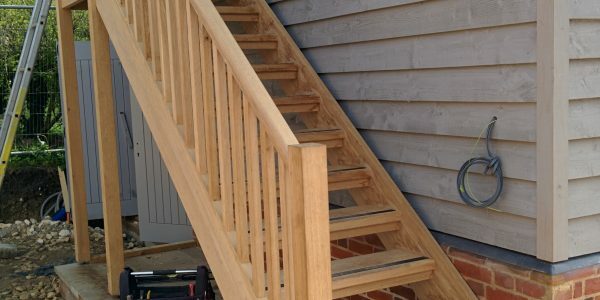 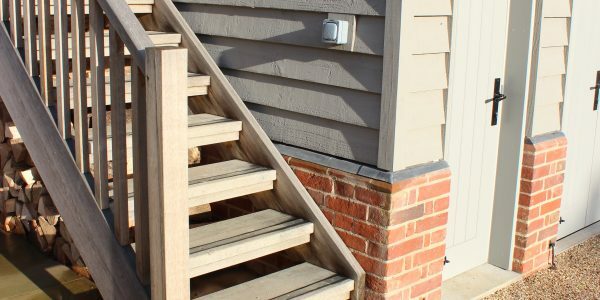 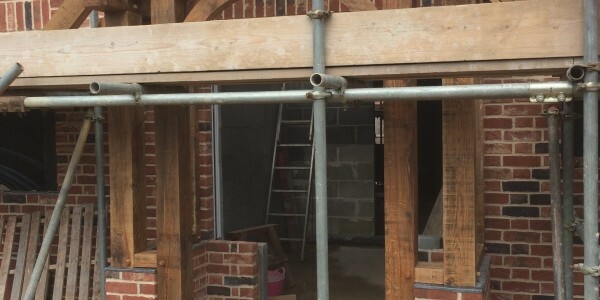 We supplied several aspects of joinery at the property, including an external staircase, an internal staircase and several internal doors. 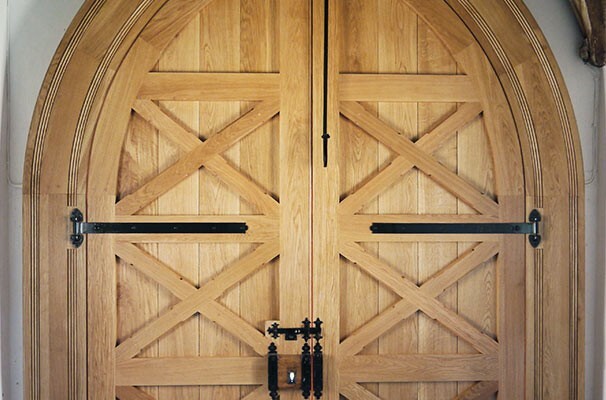 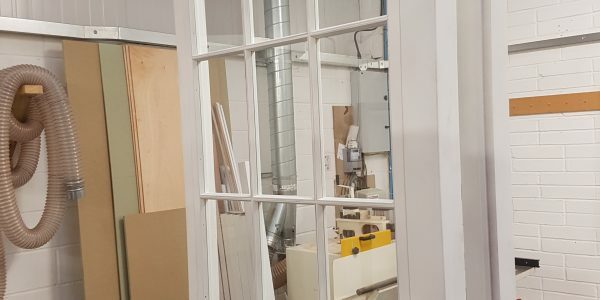 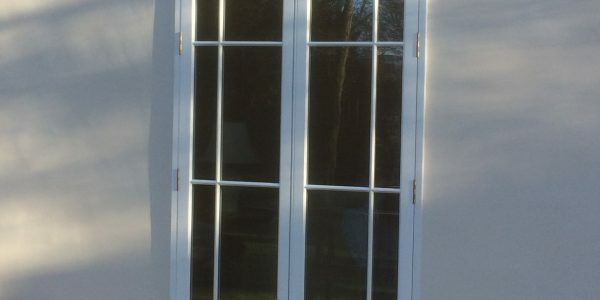 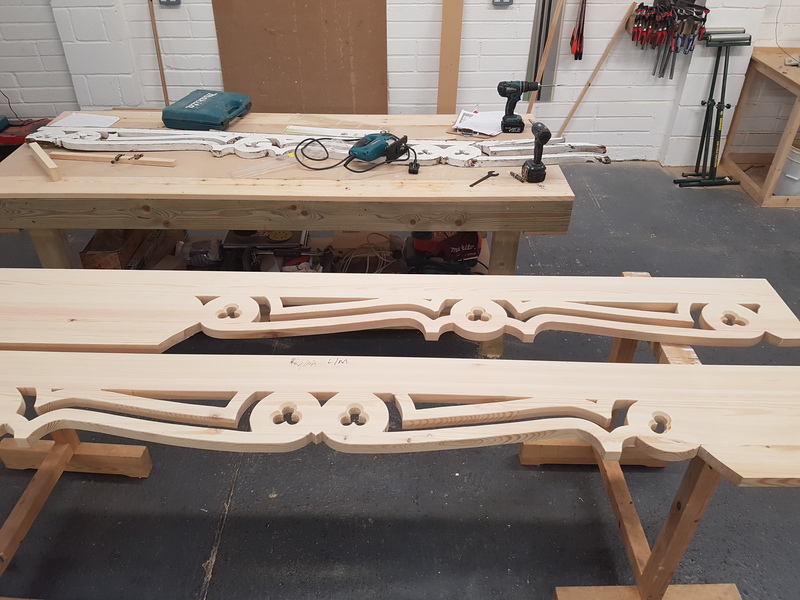 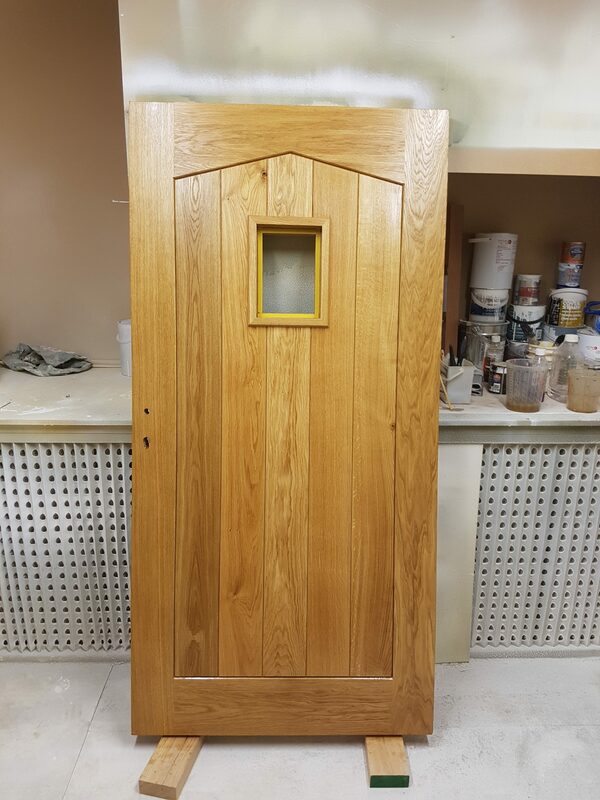 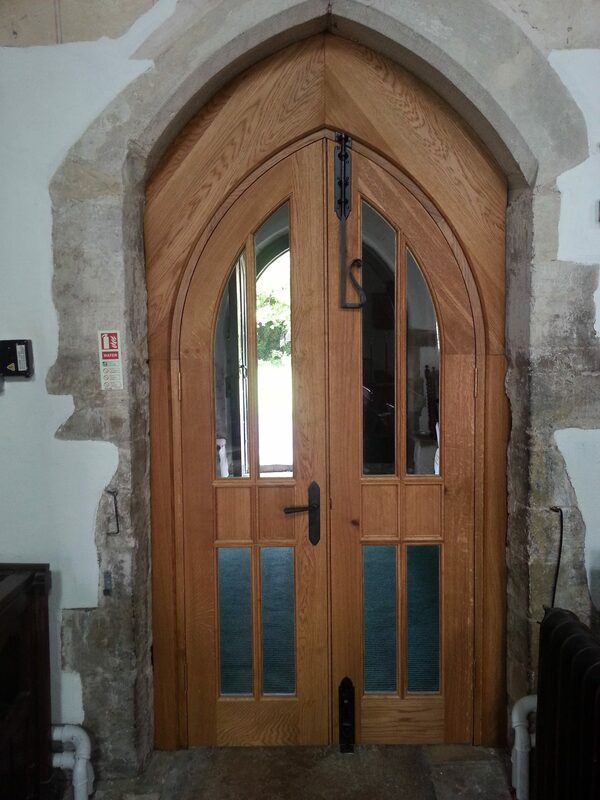 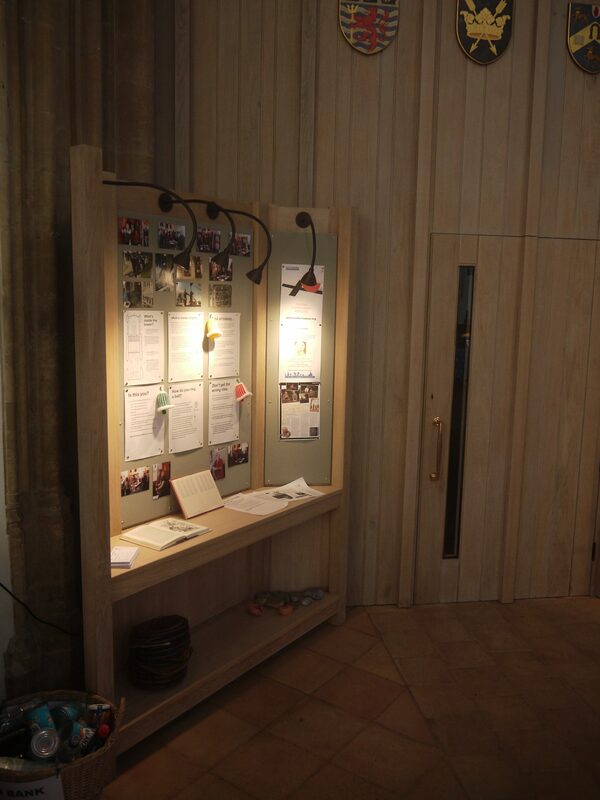 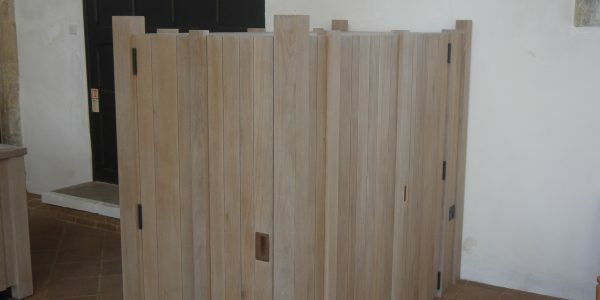 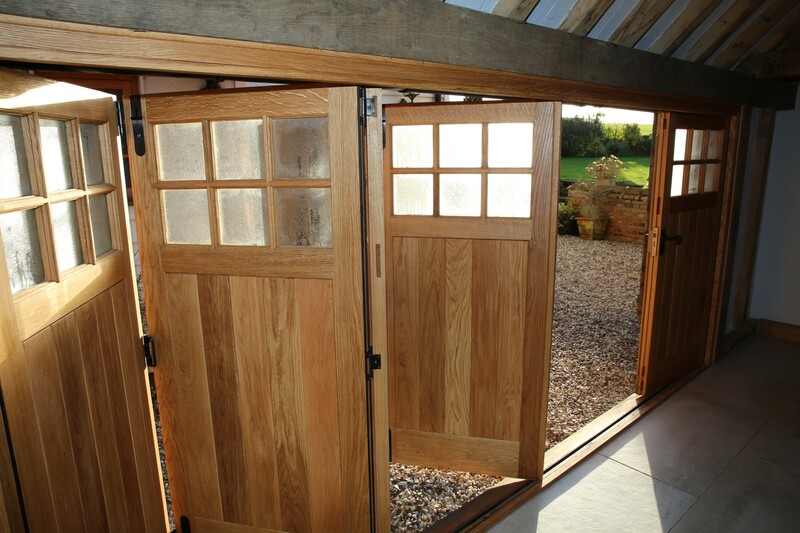 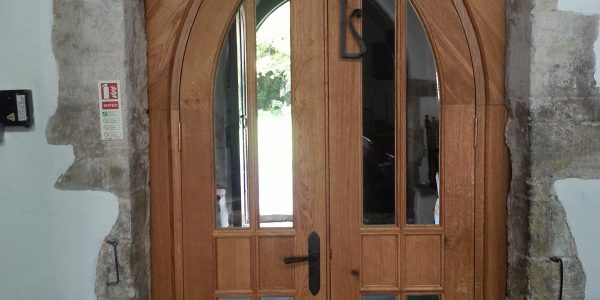 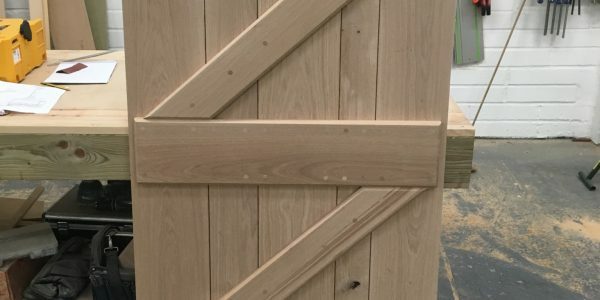 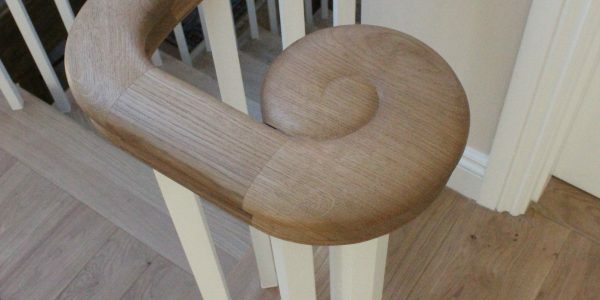 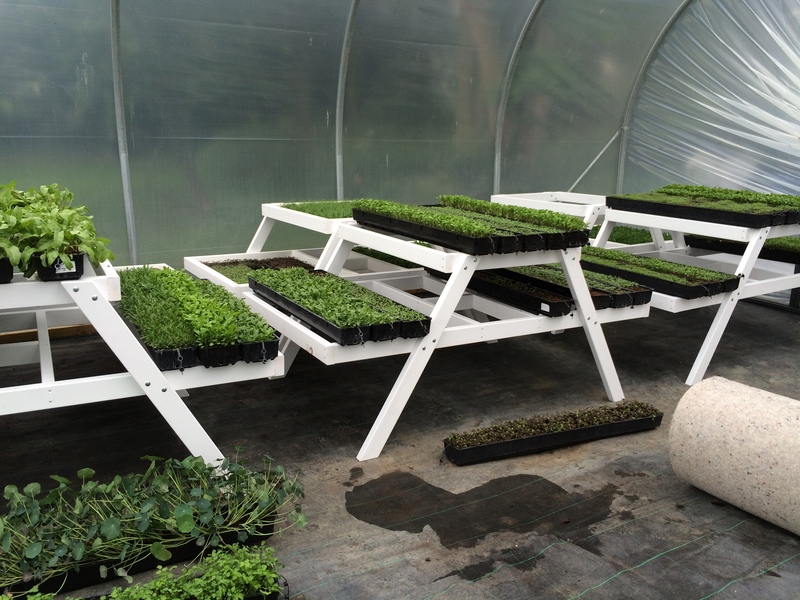 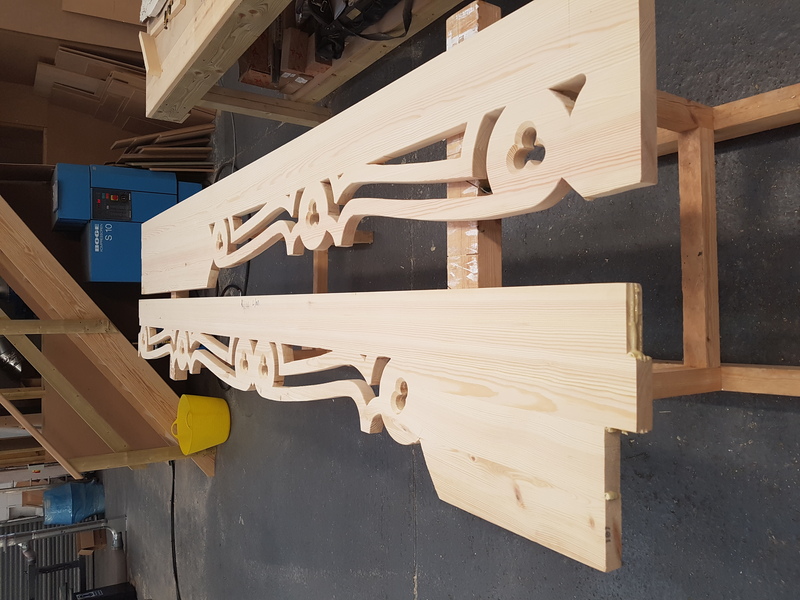 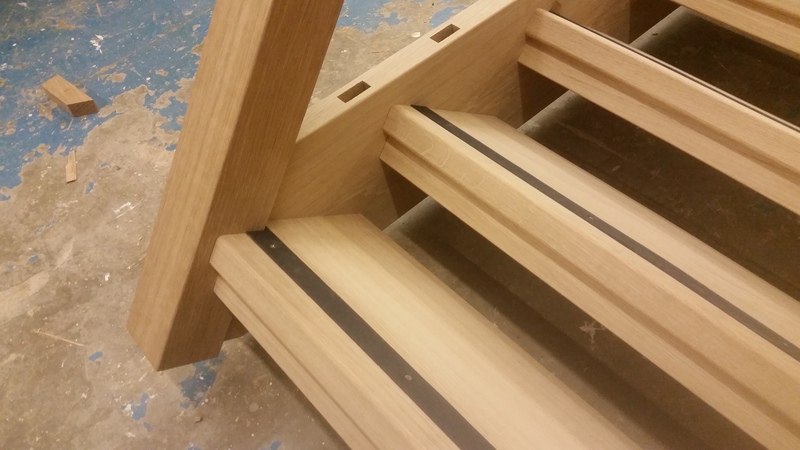 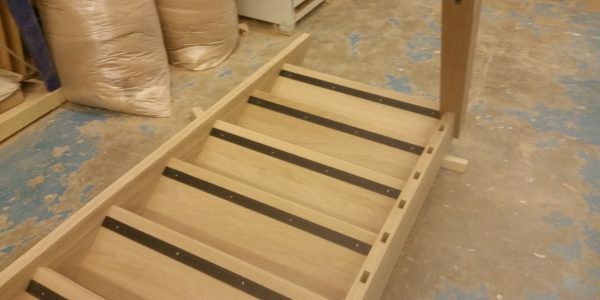 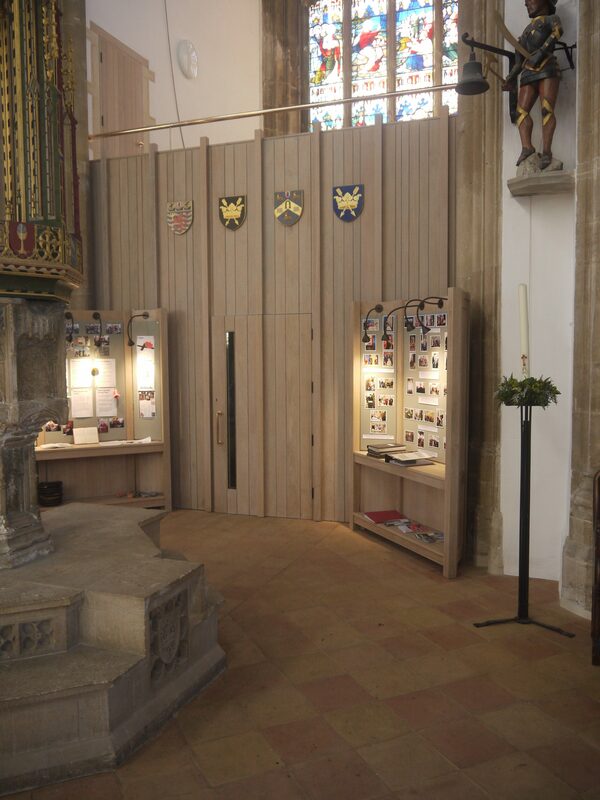 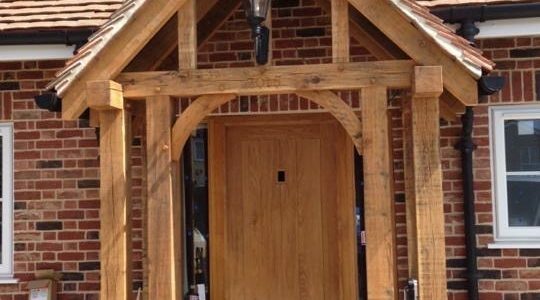 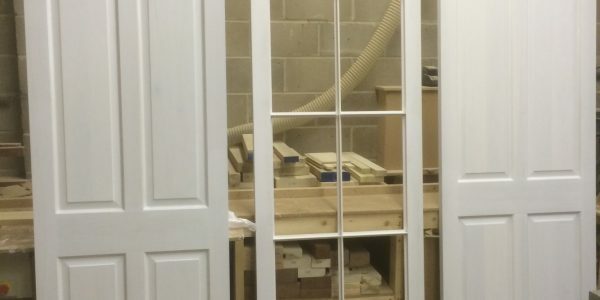 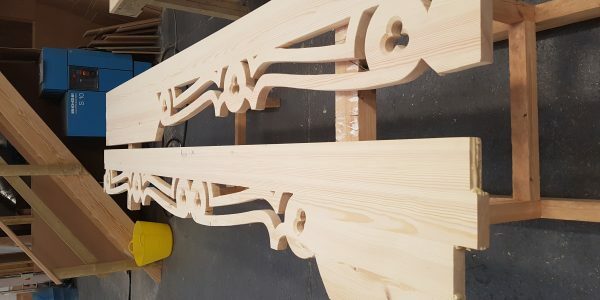 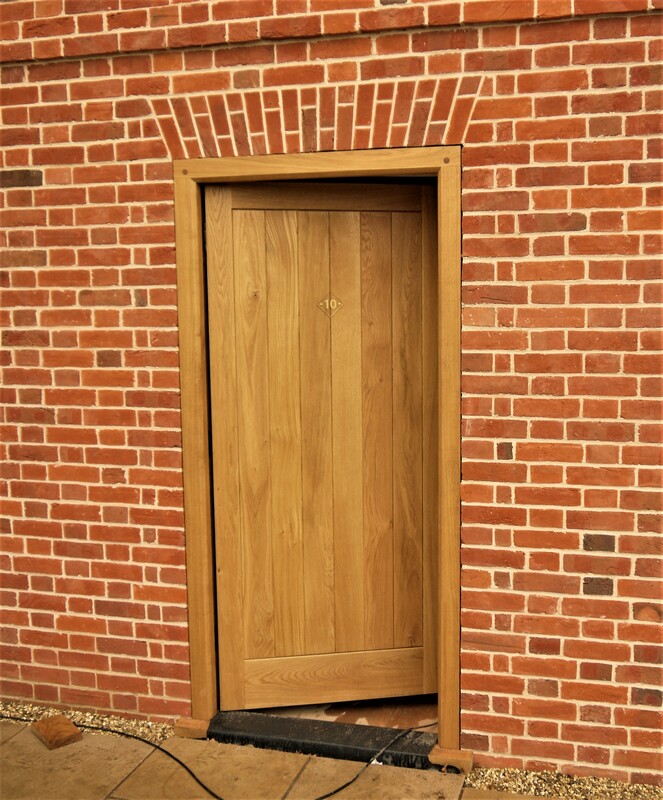 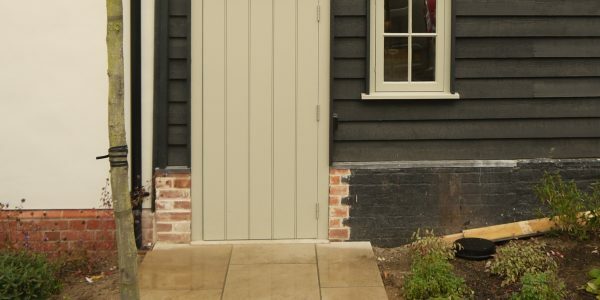 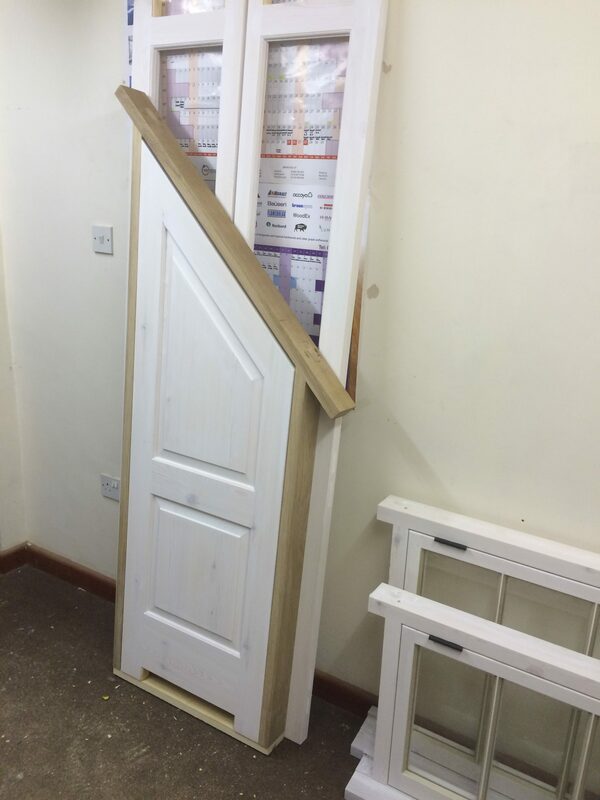 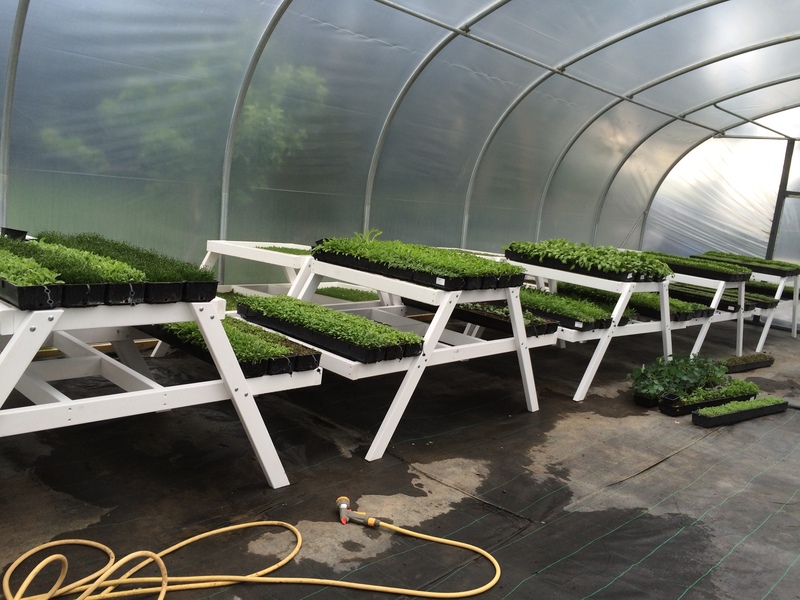 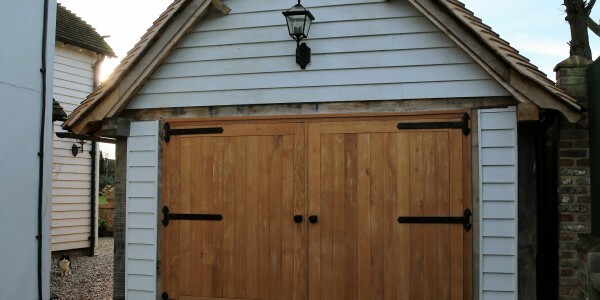 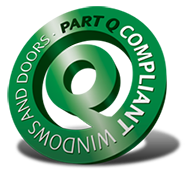 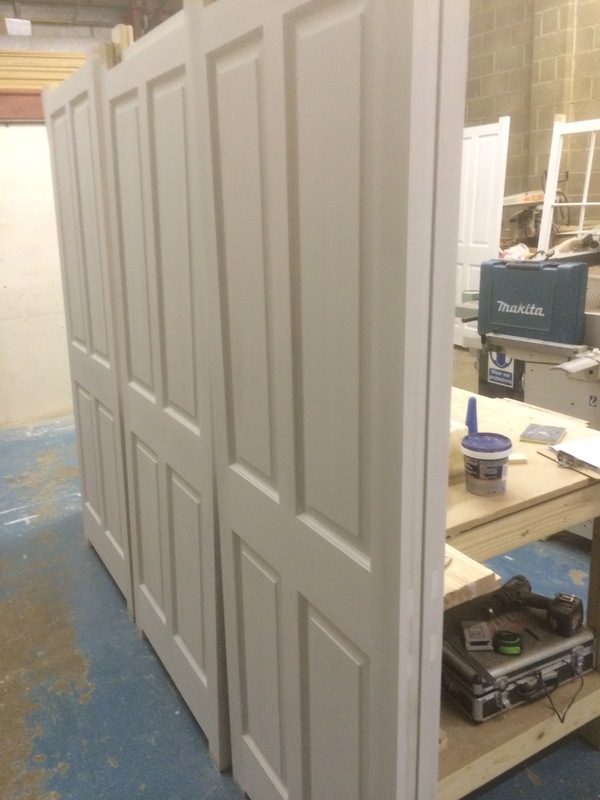 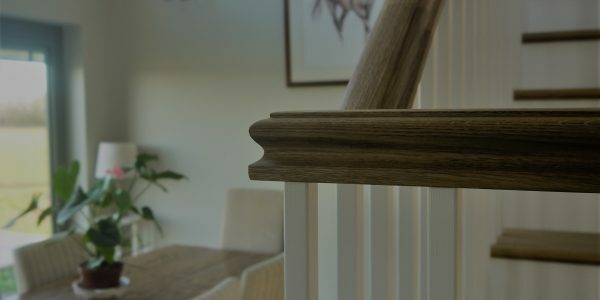 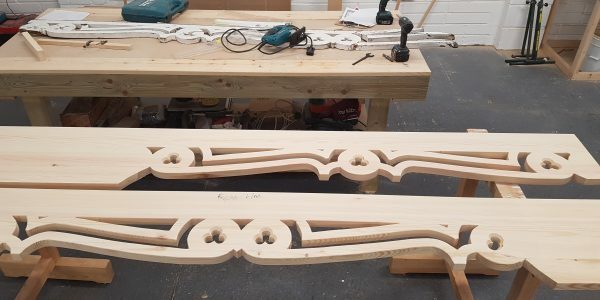 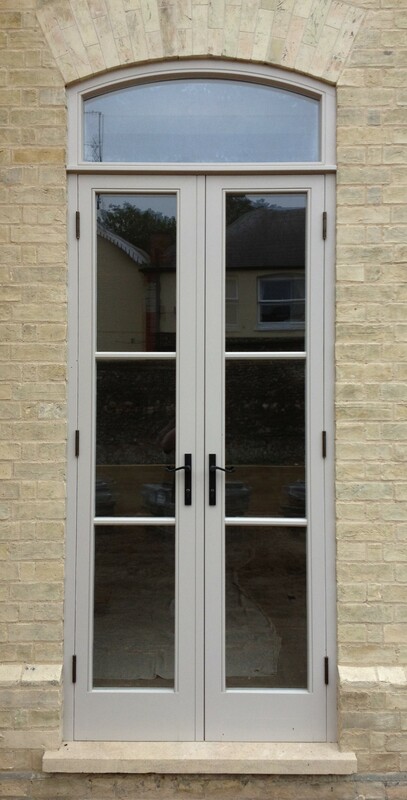 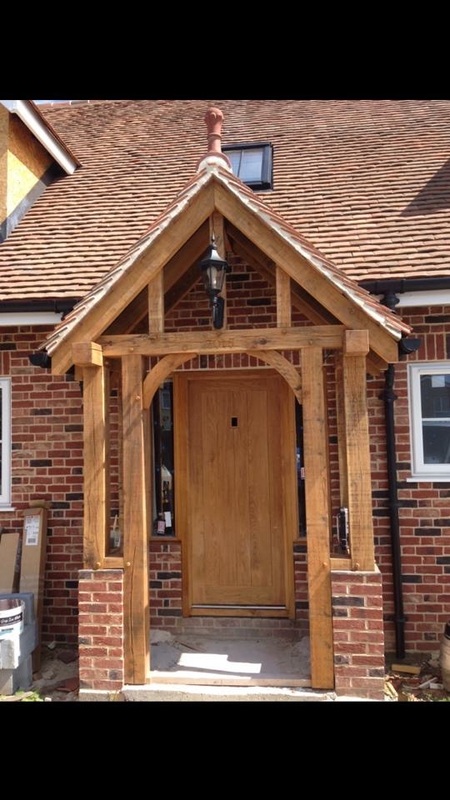 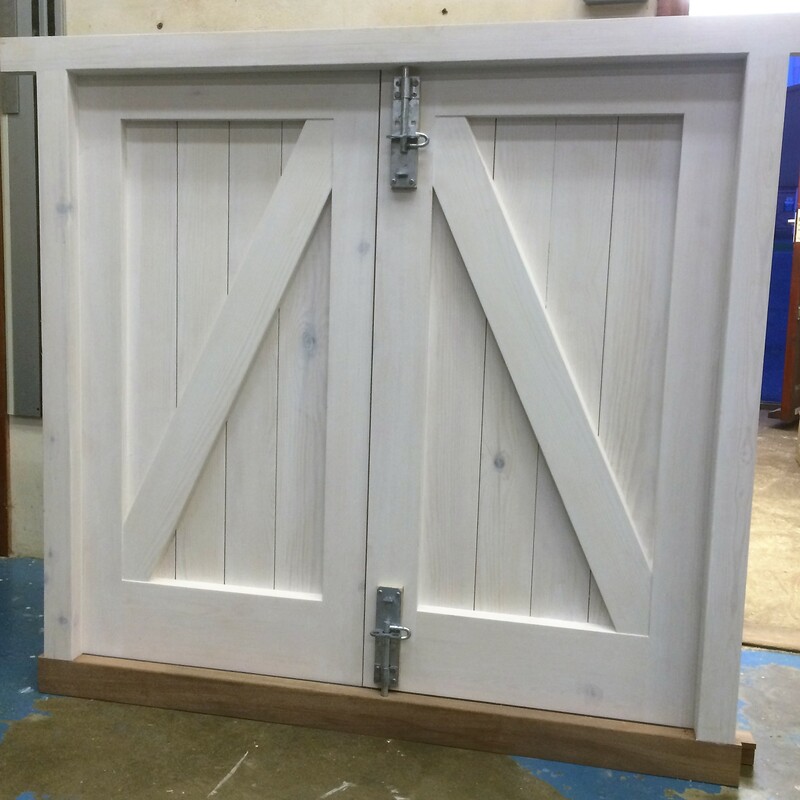 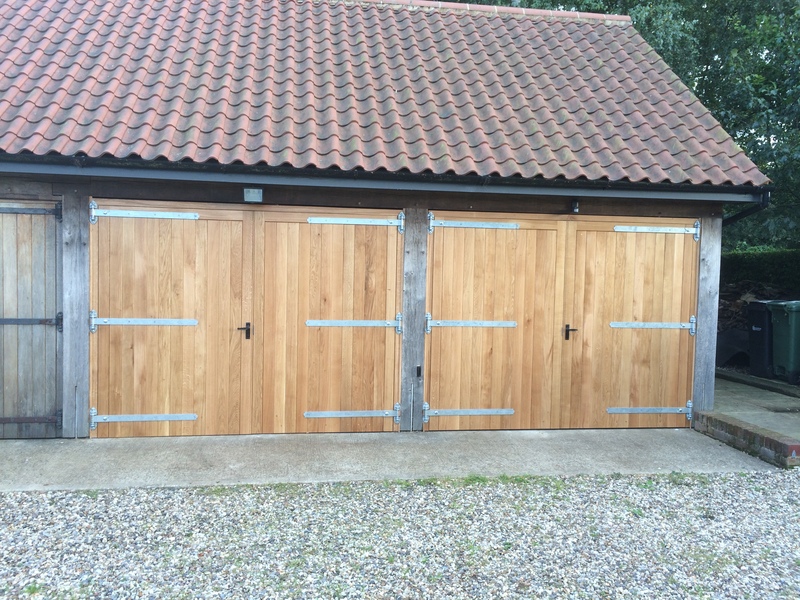 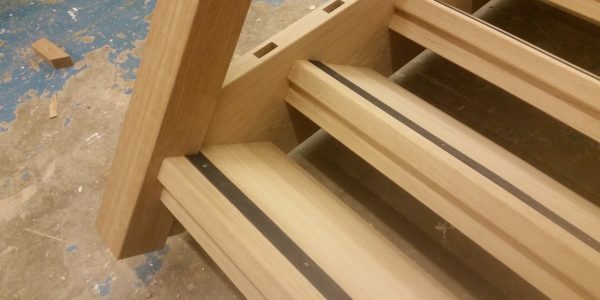 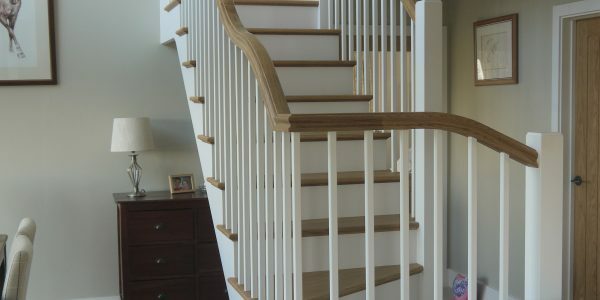 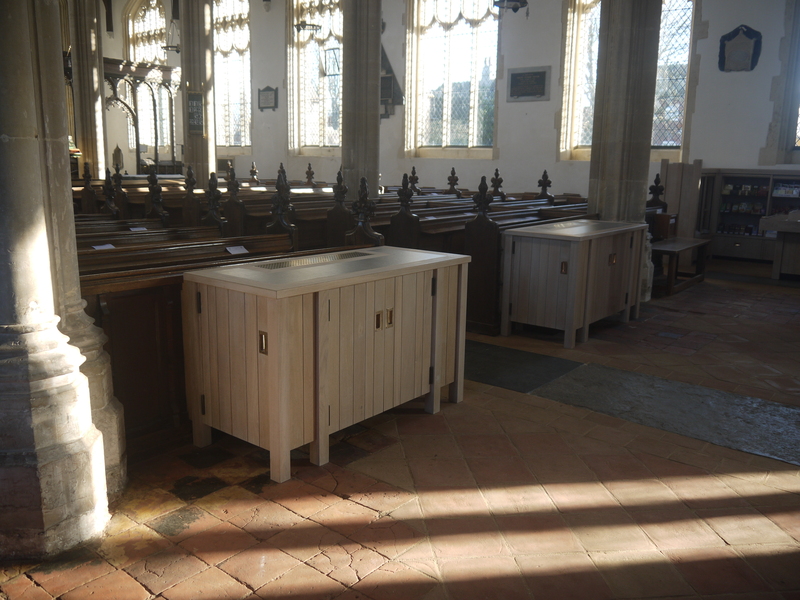 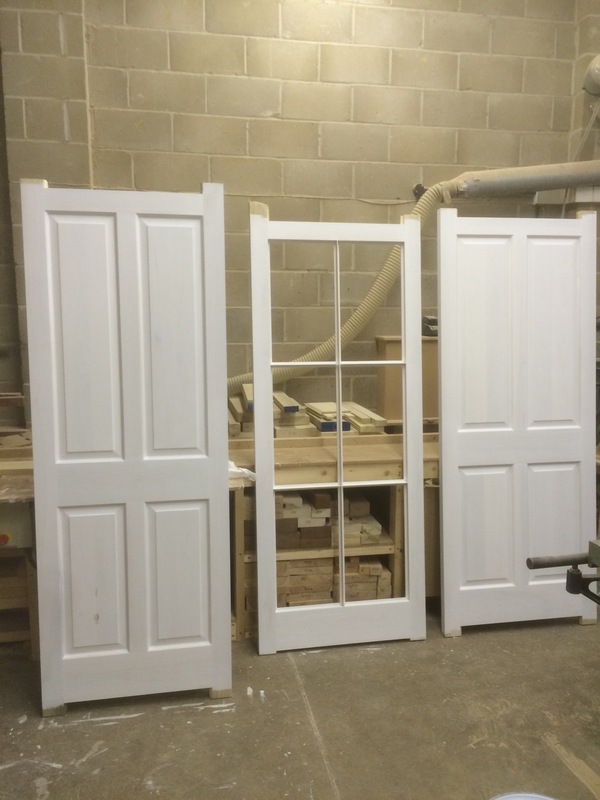 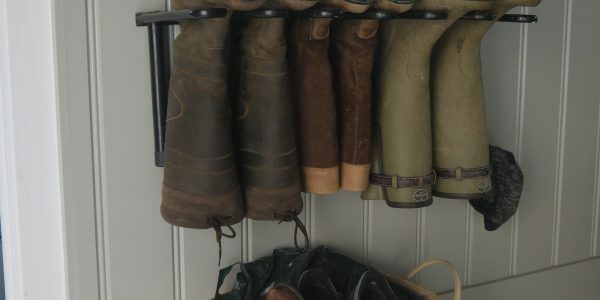 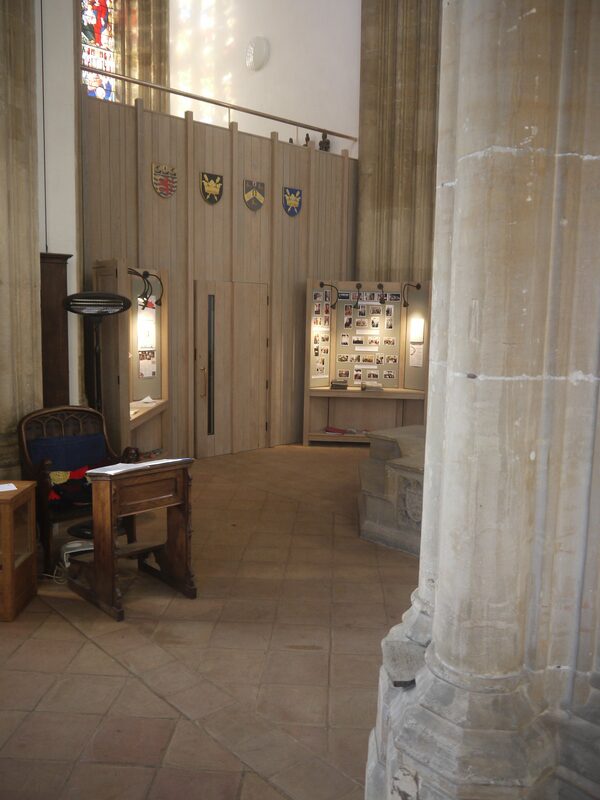 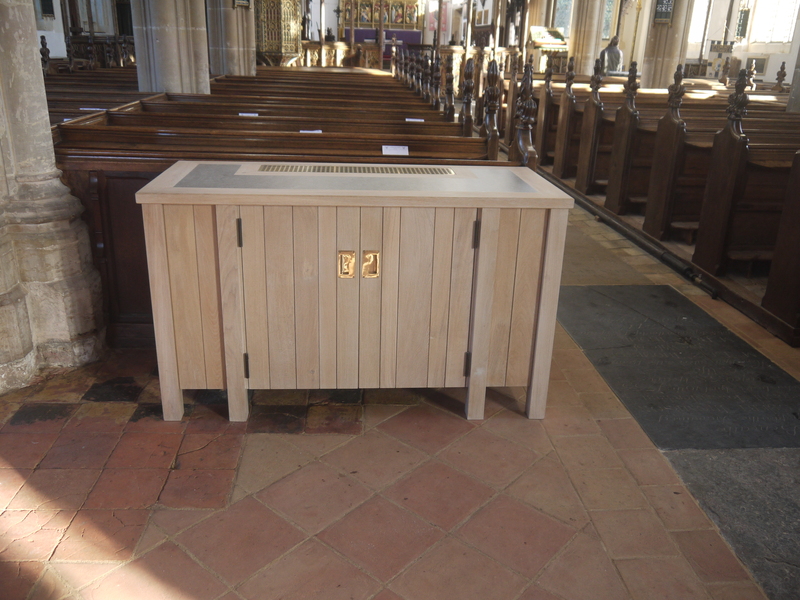 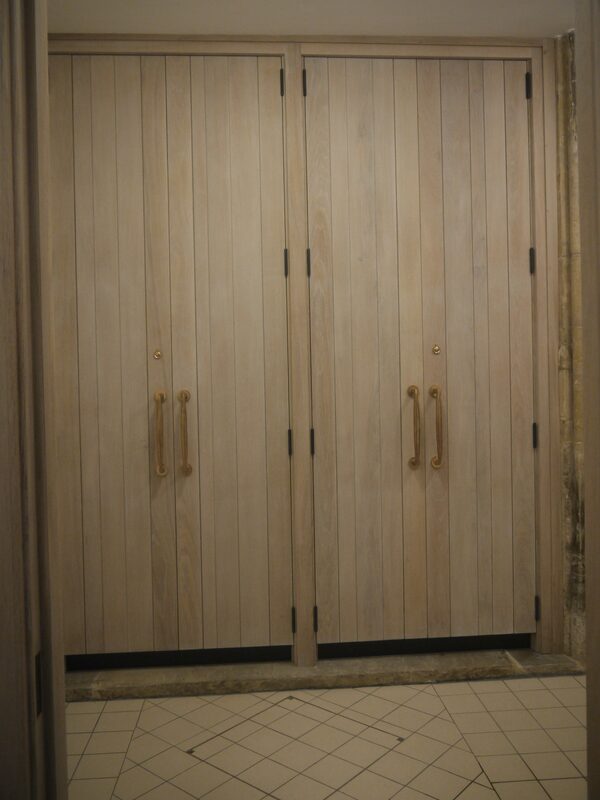 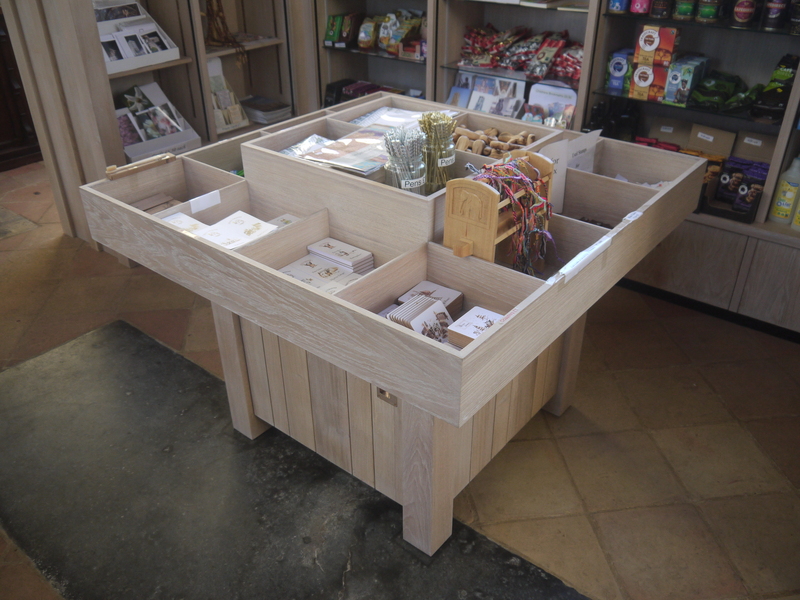 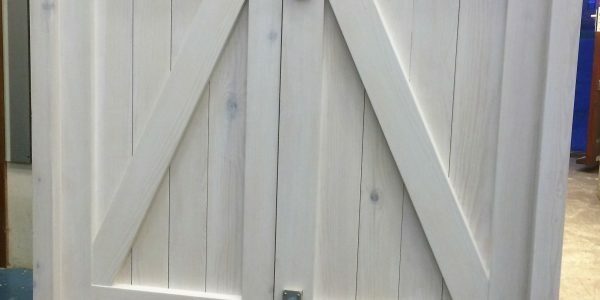 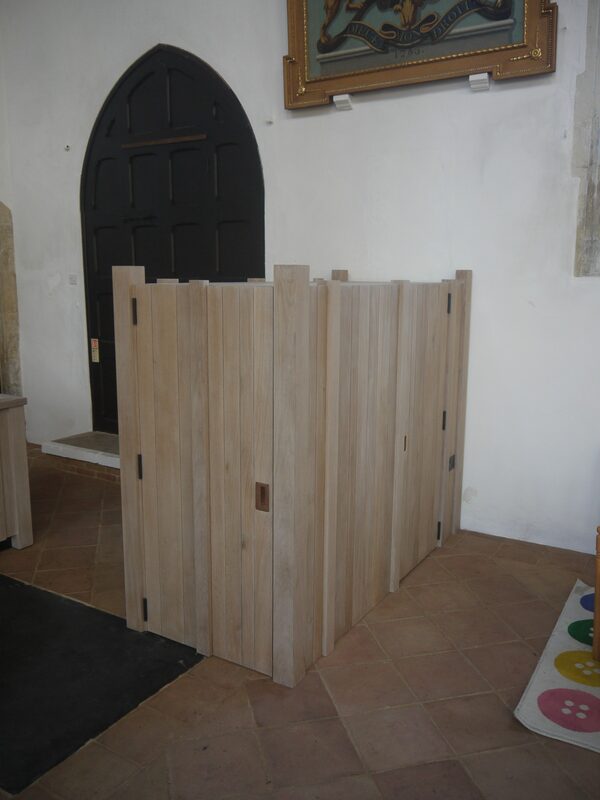 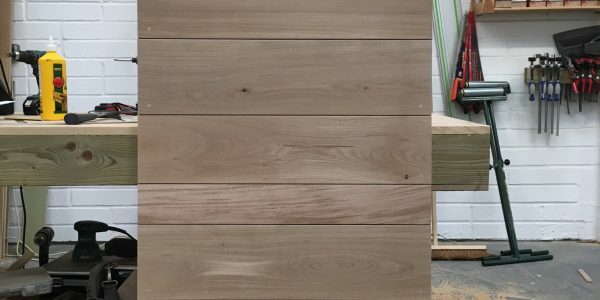 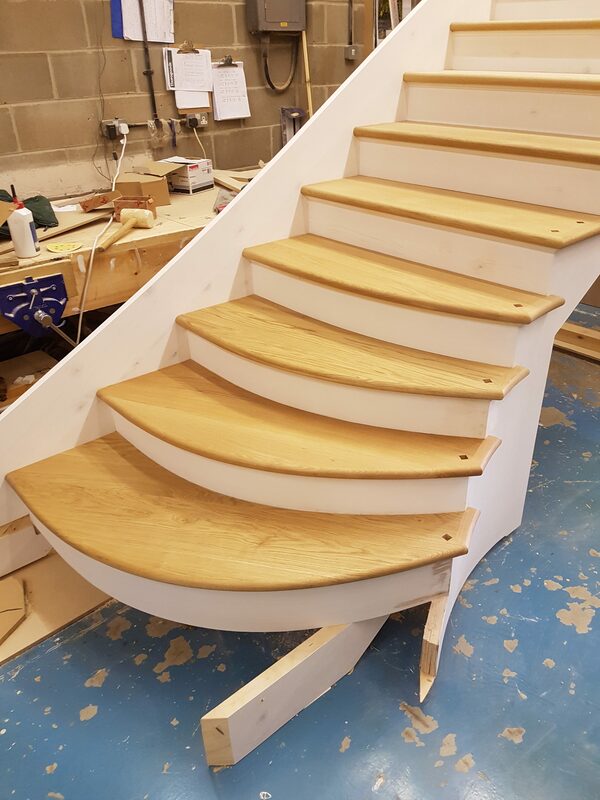 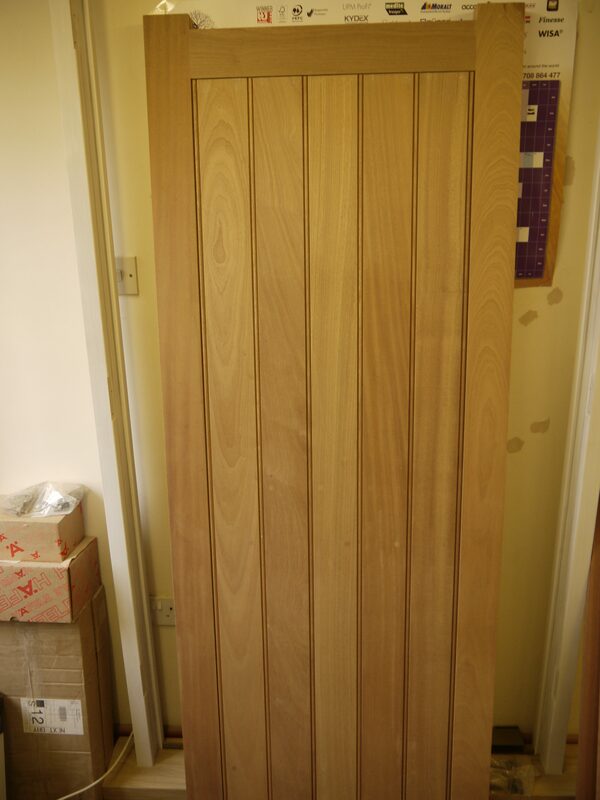 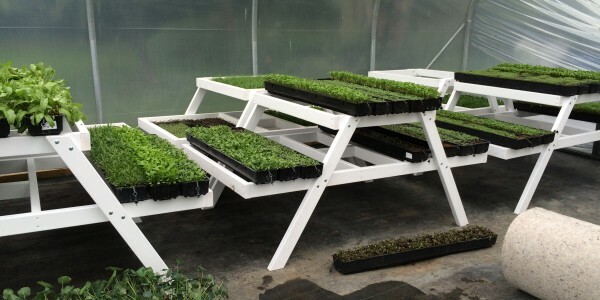 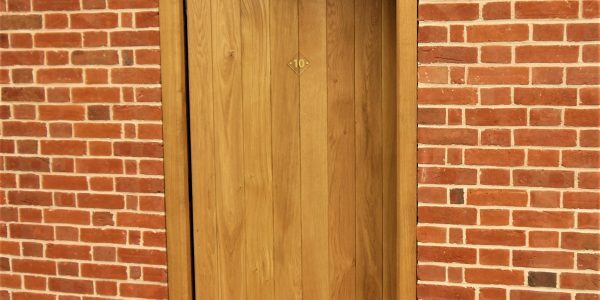 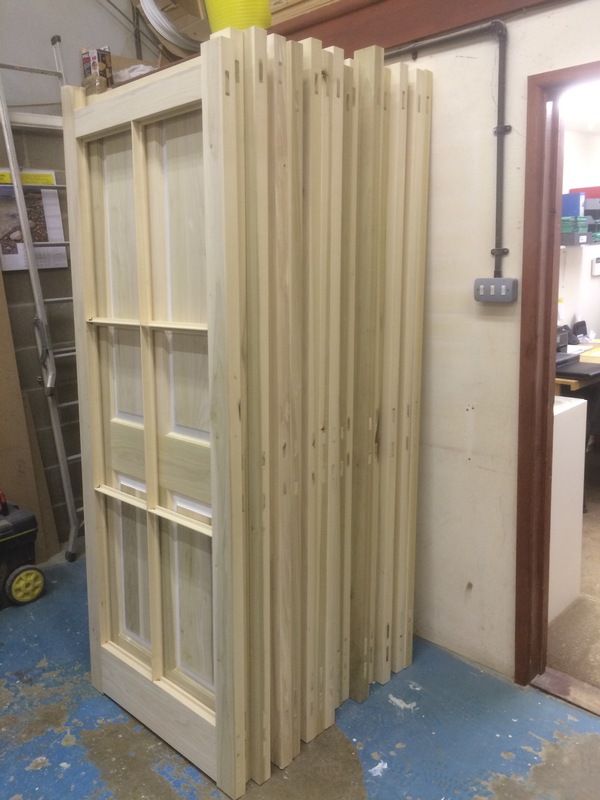 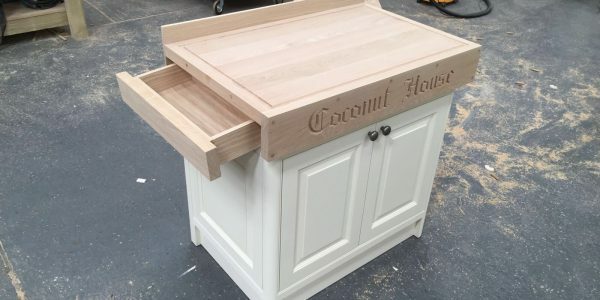 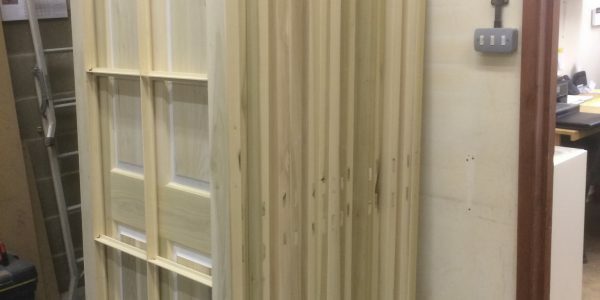 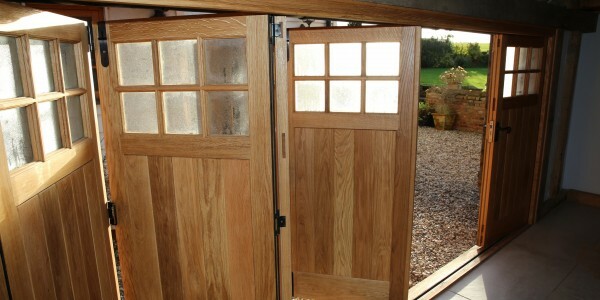 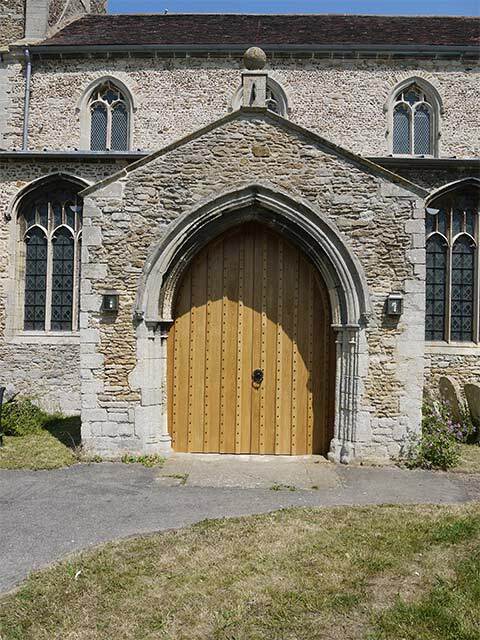 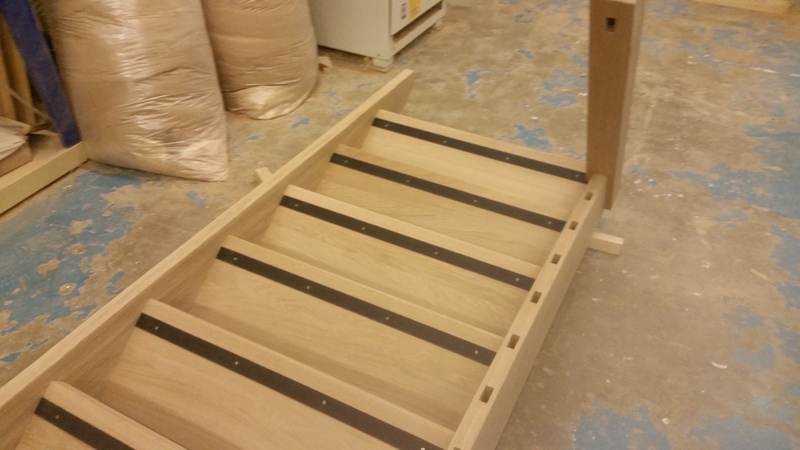 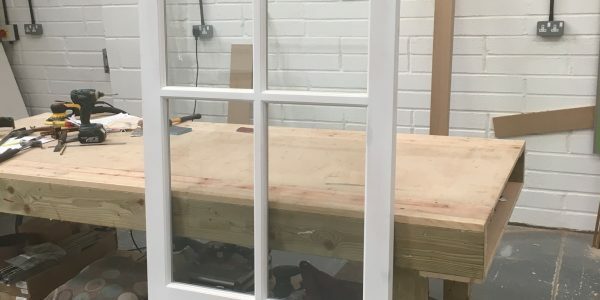 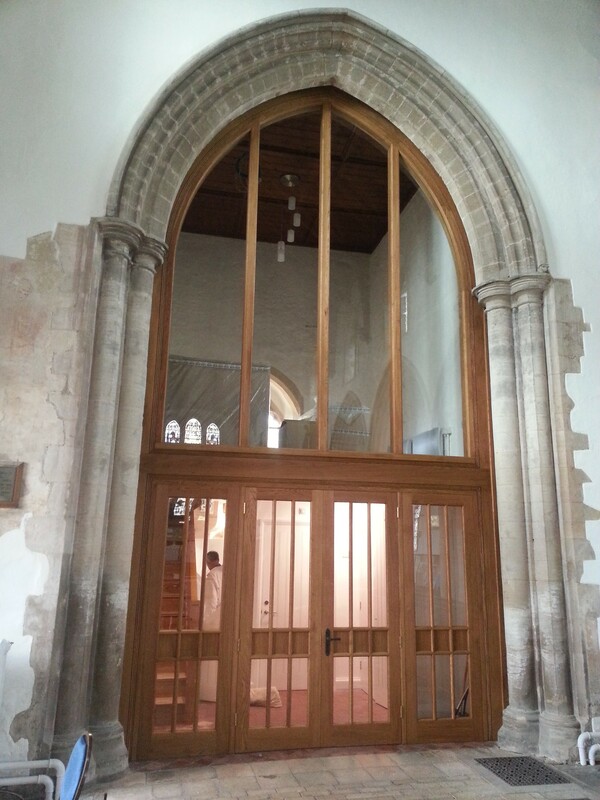 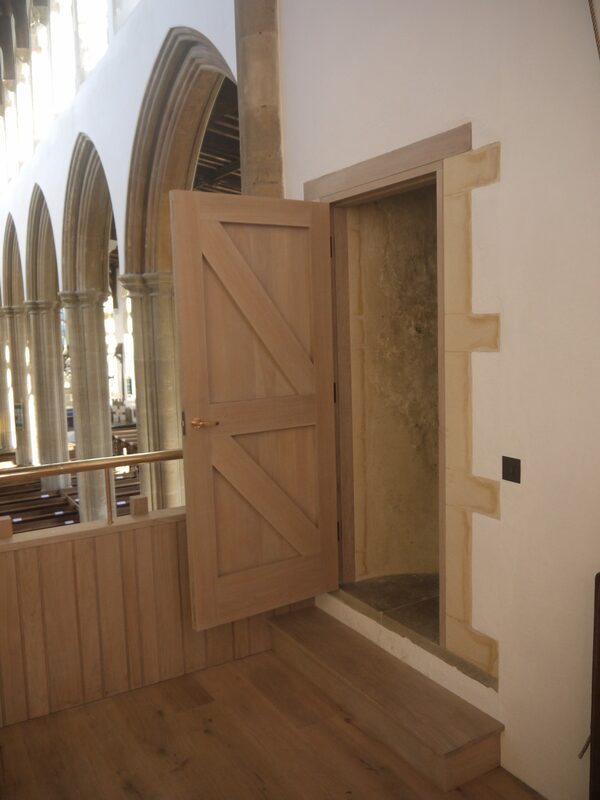 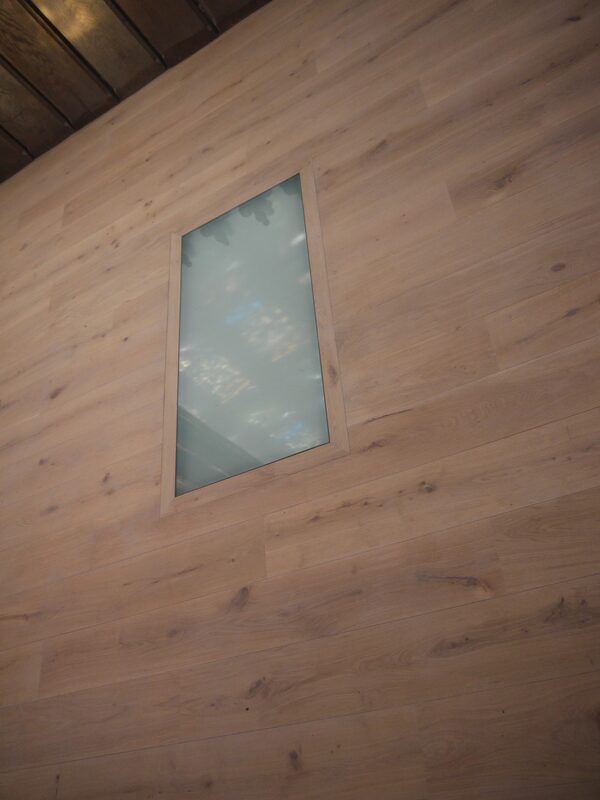 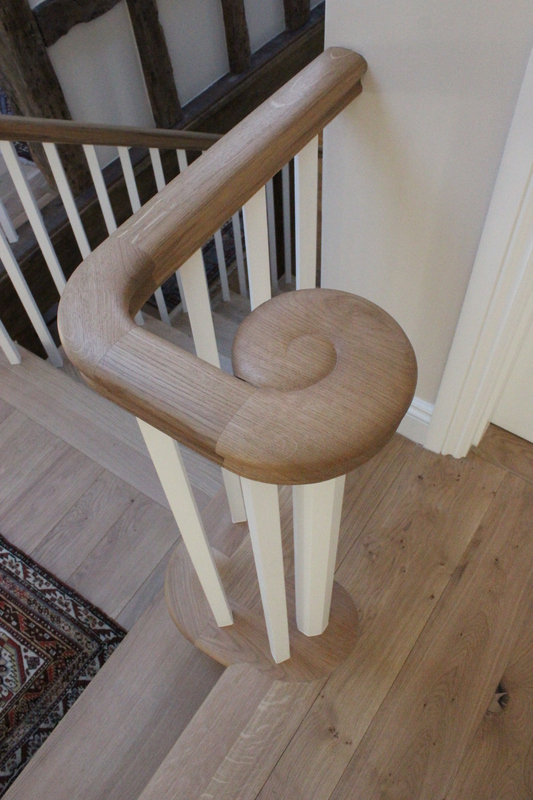 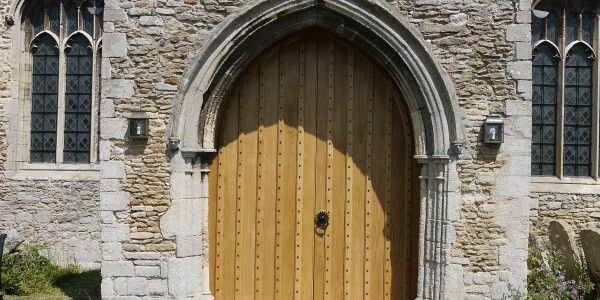 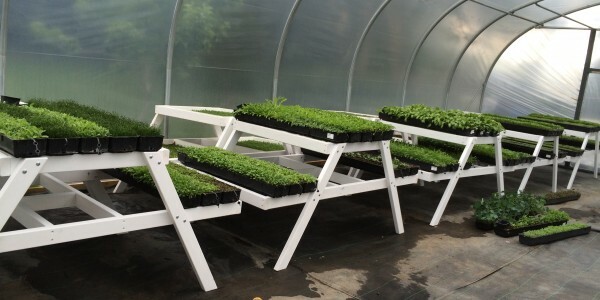 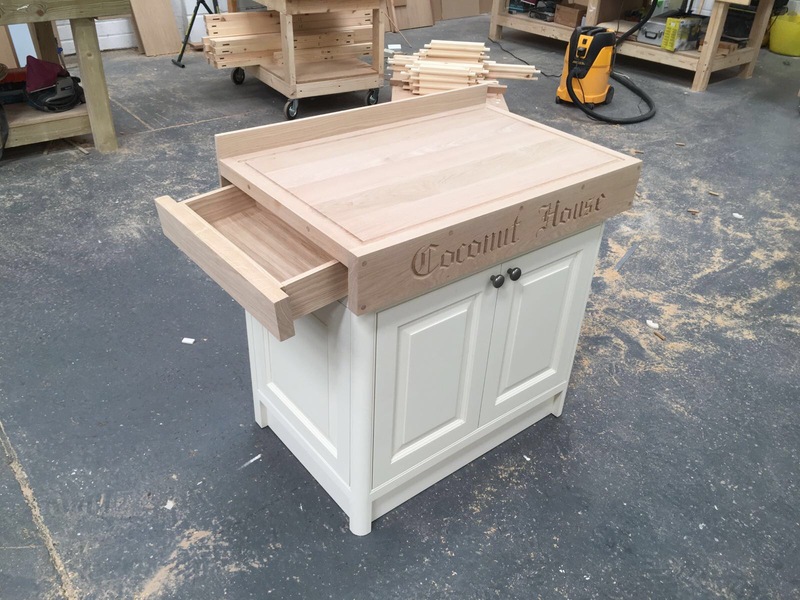 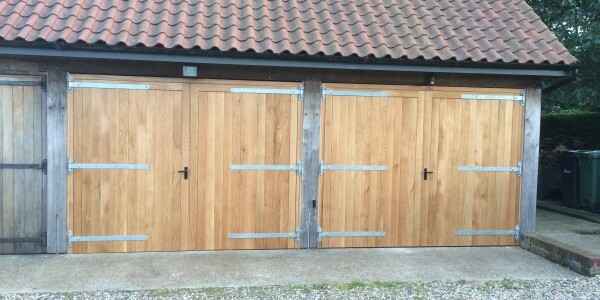 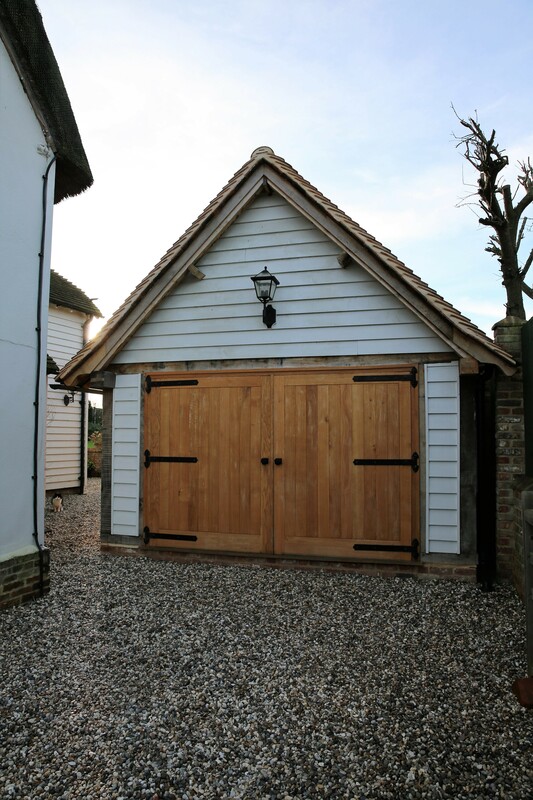 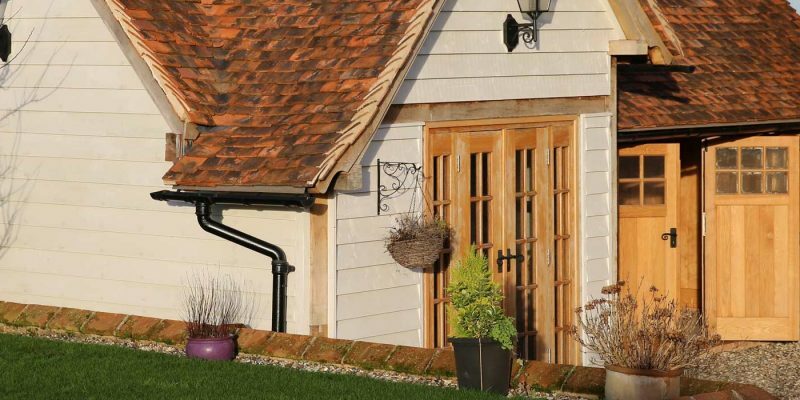 Over the years we have produced a range of joinery products for these clients, over a real variety of projects. 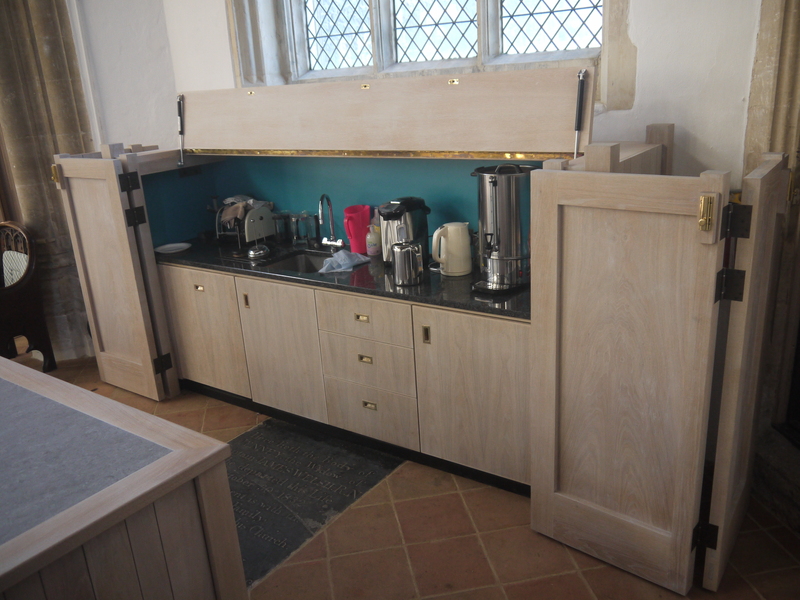 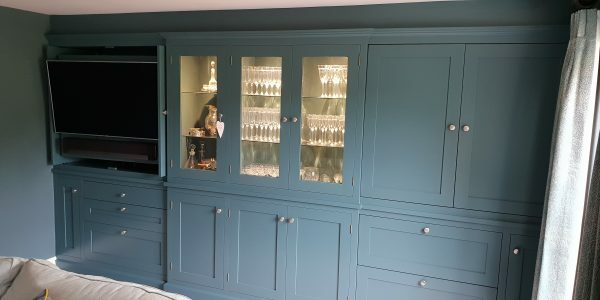 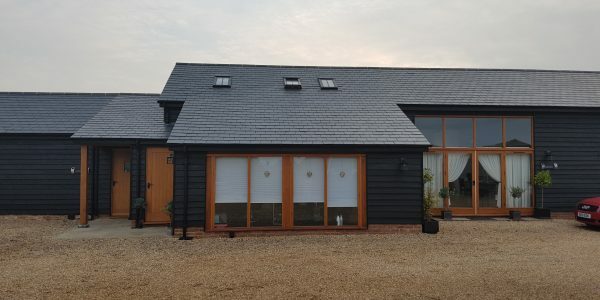 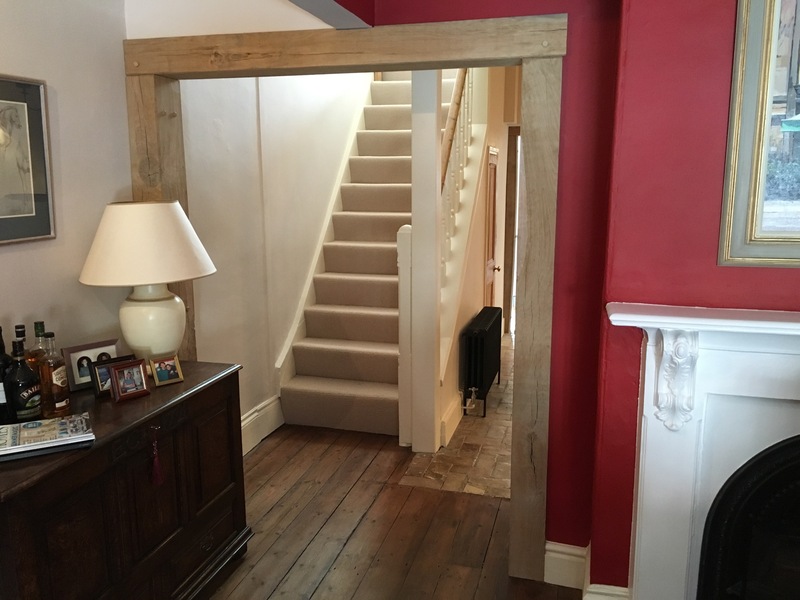 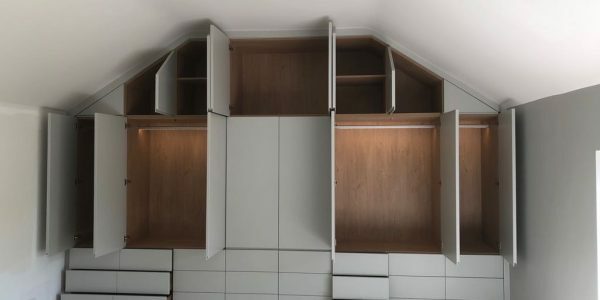 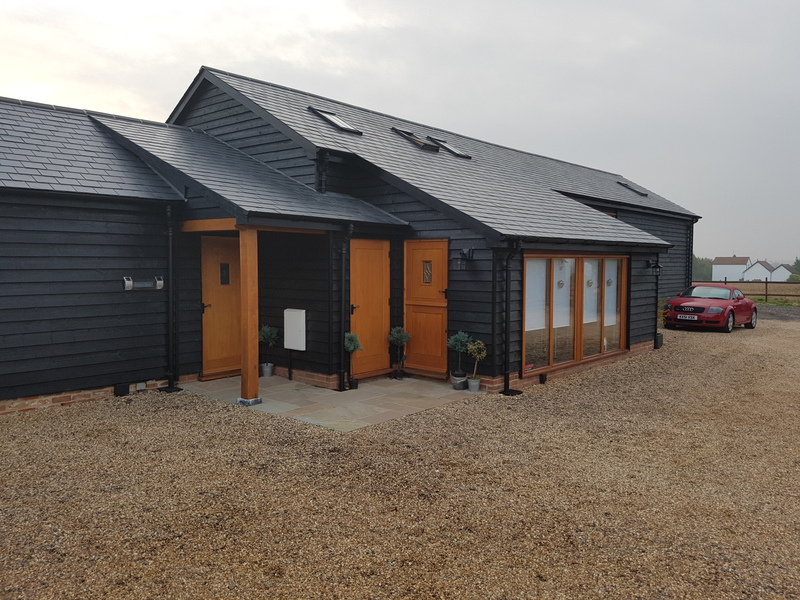 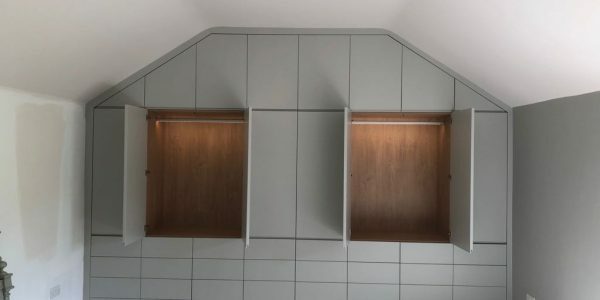 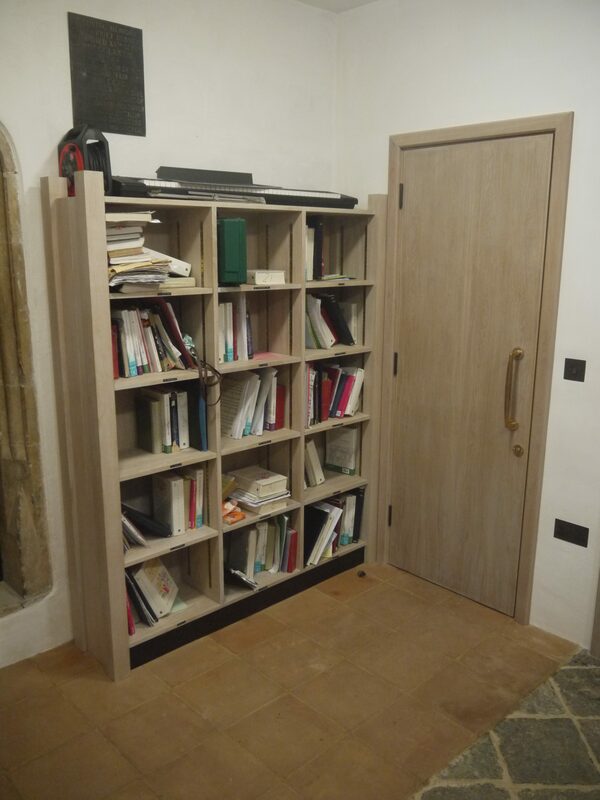 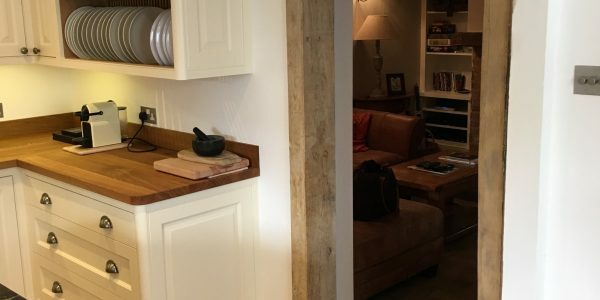 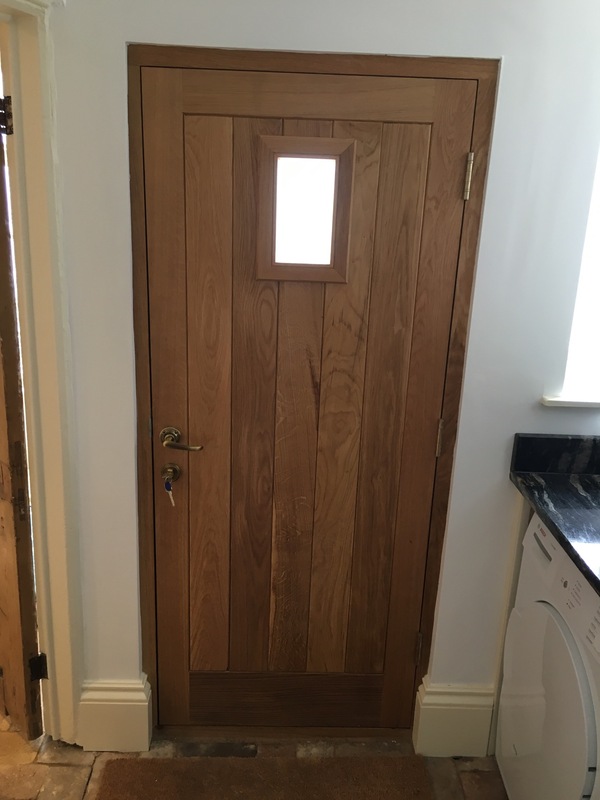 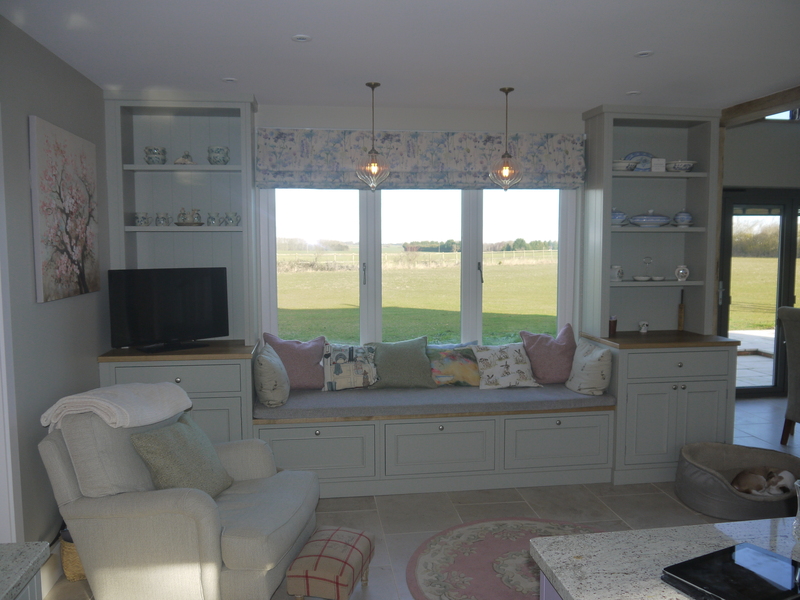 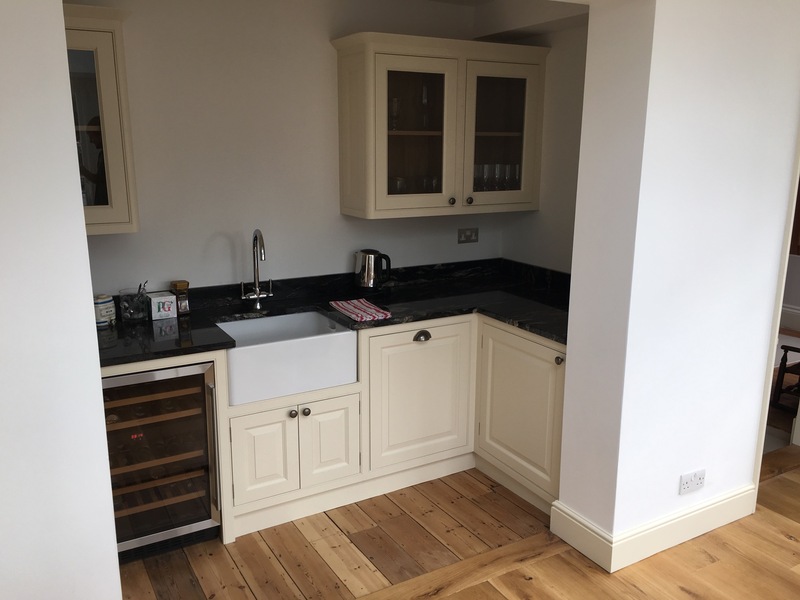 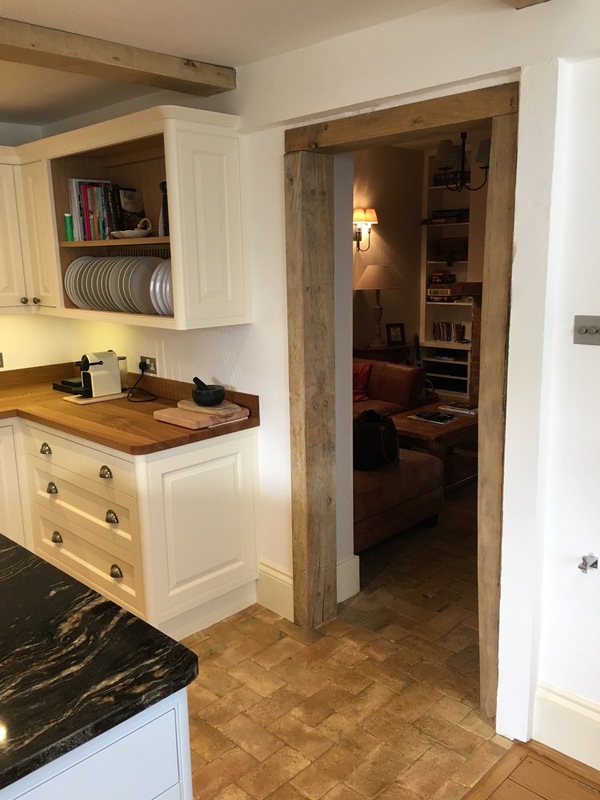 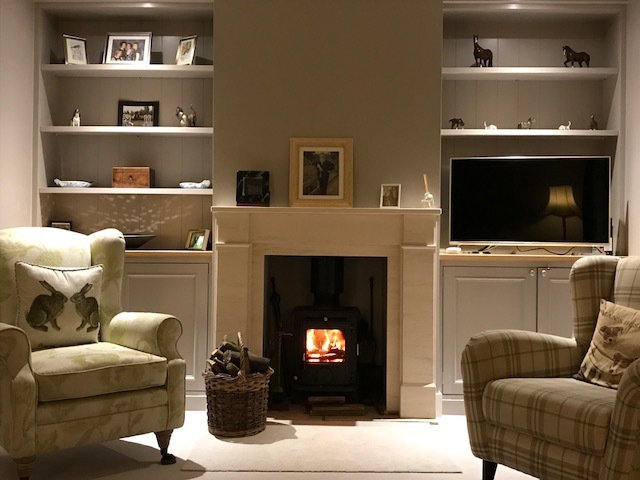 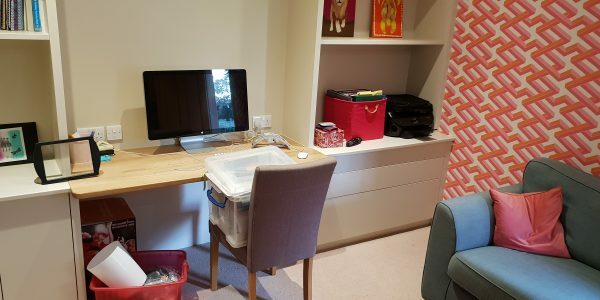 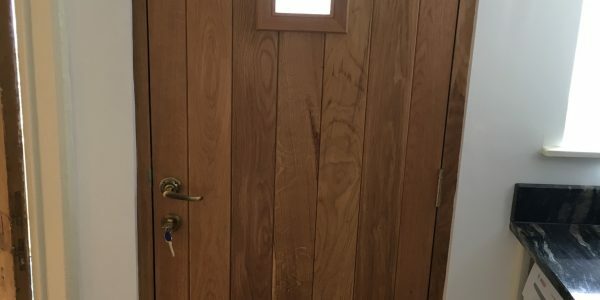 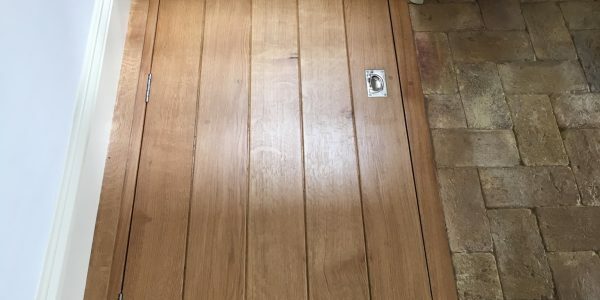 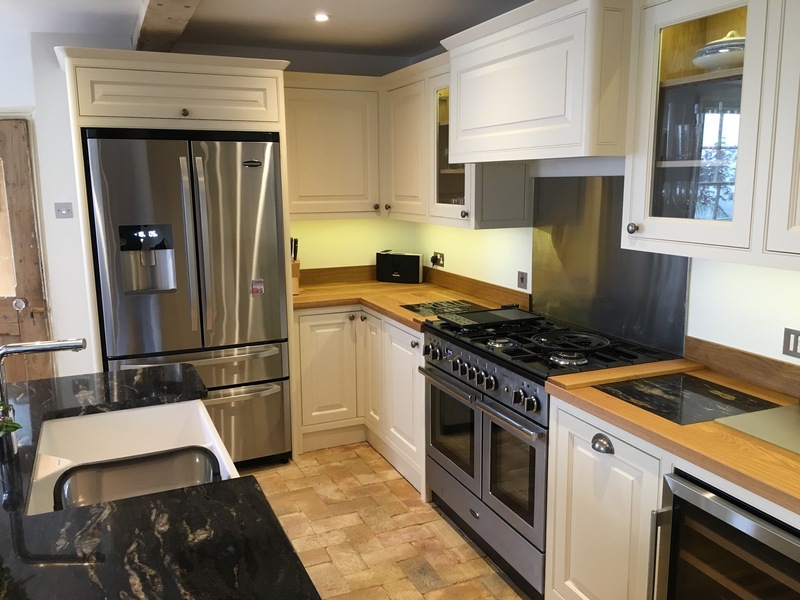 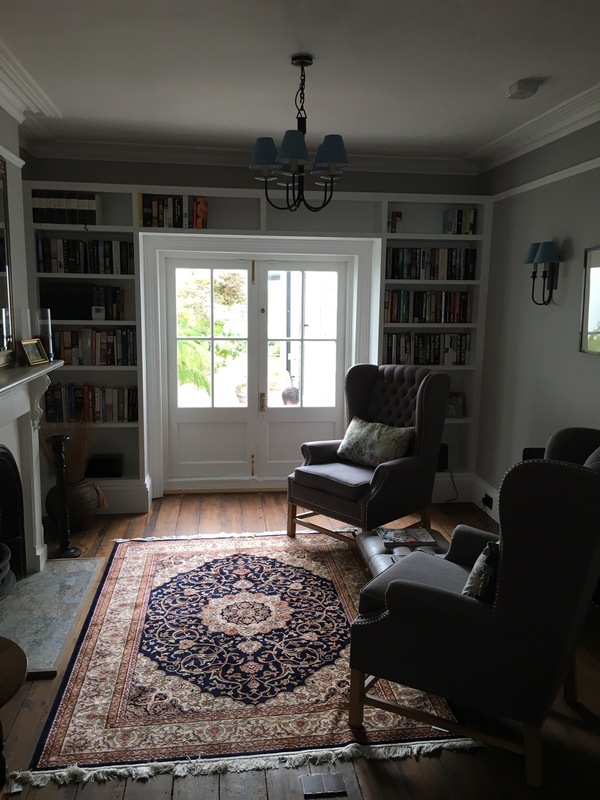 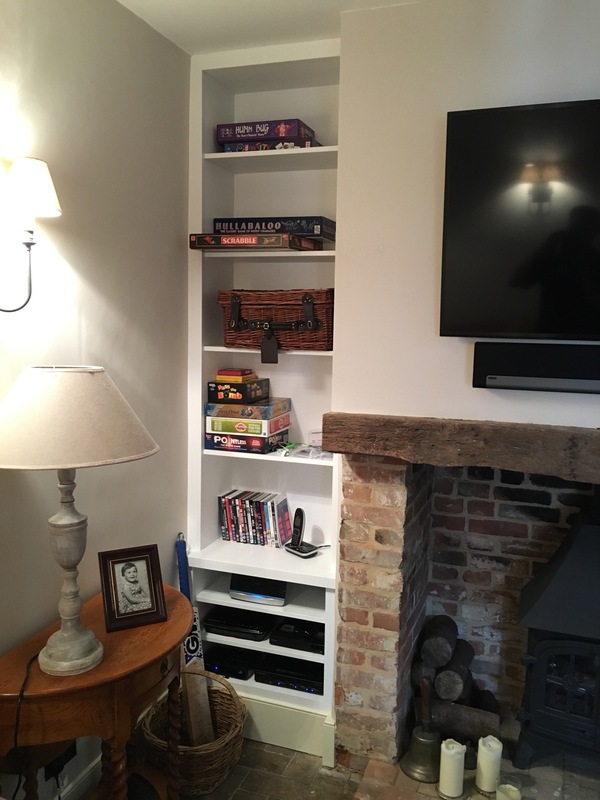 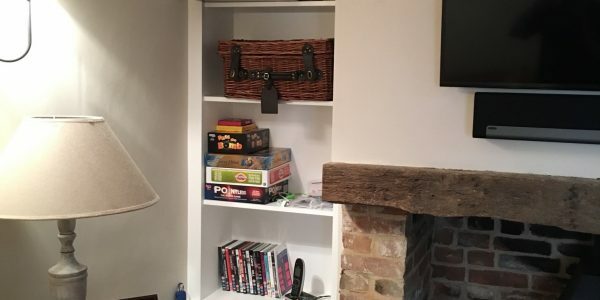 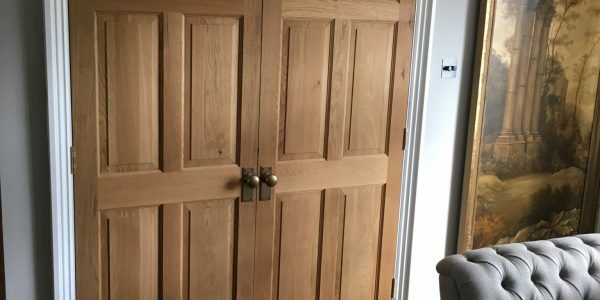 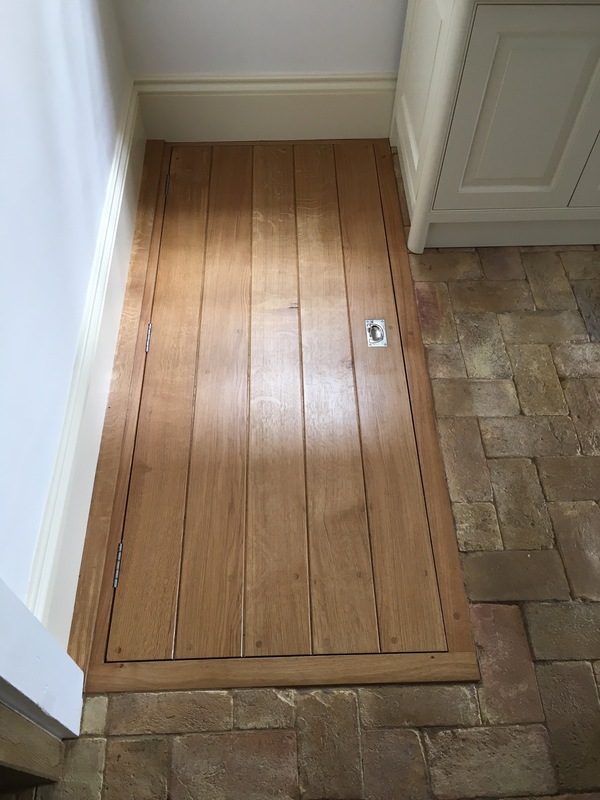 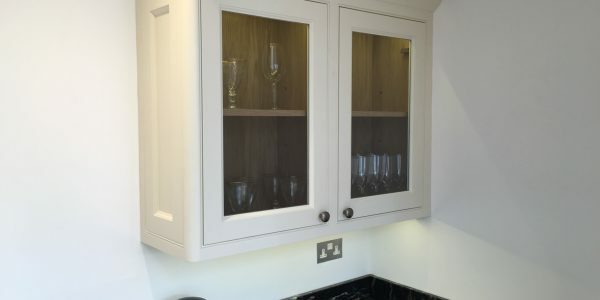 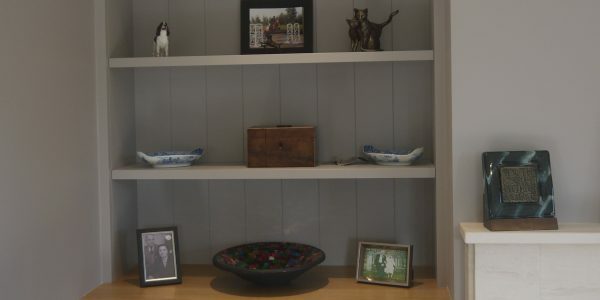 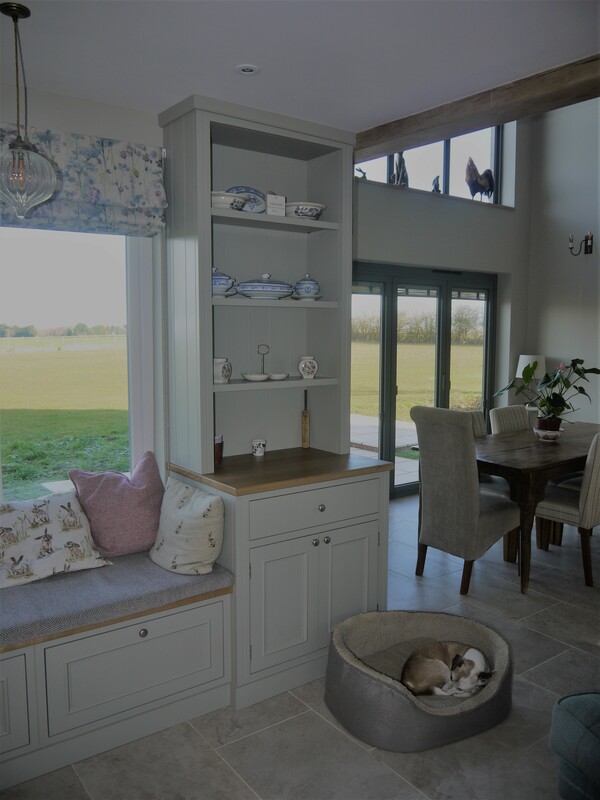 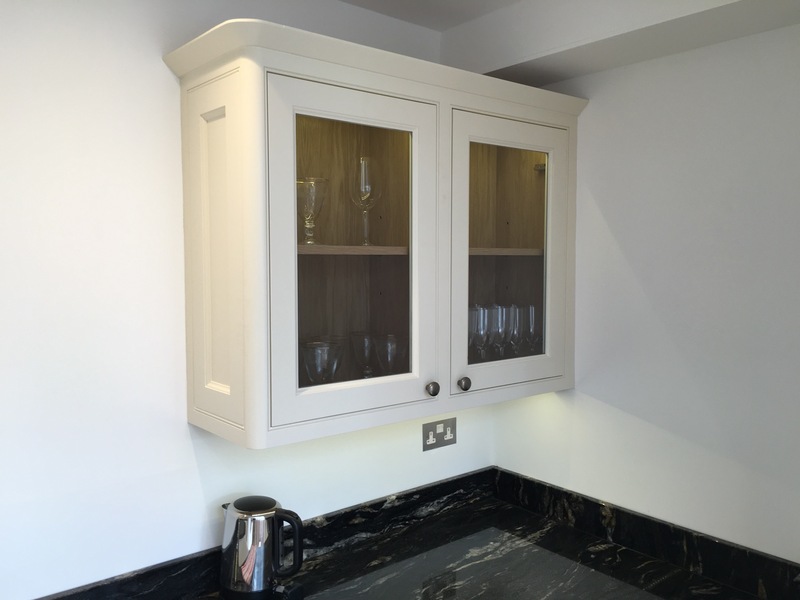 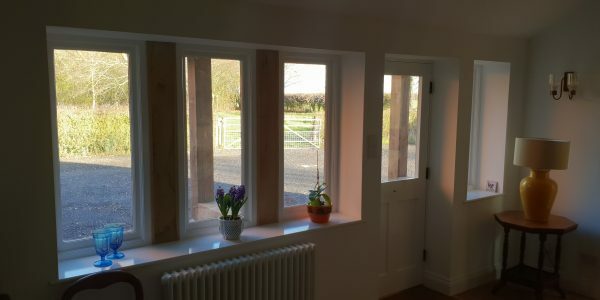 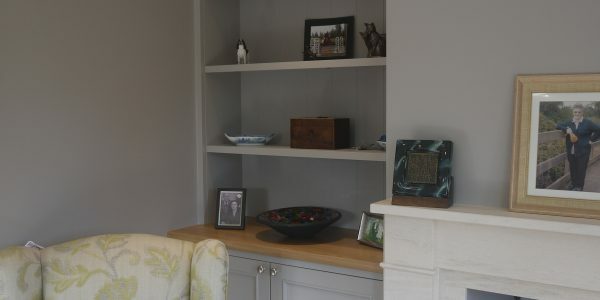 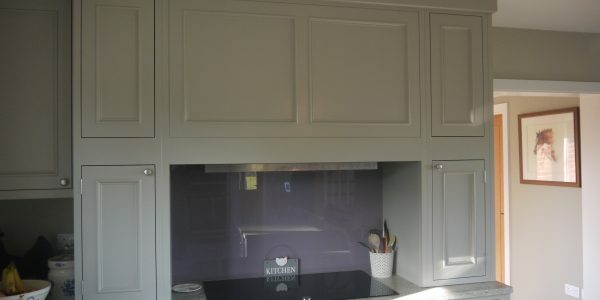 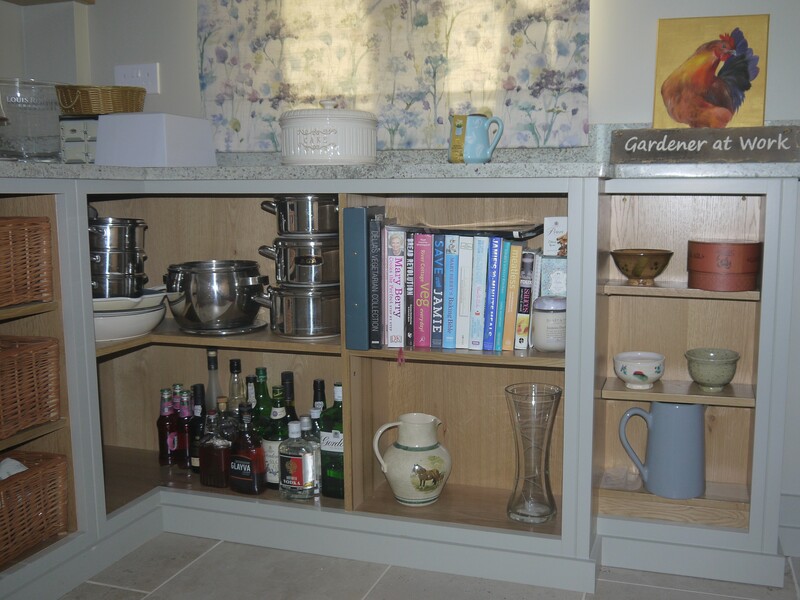 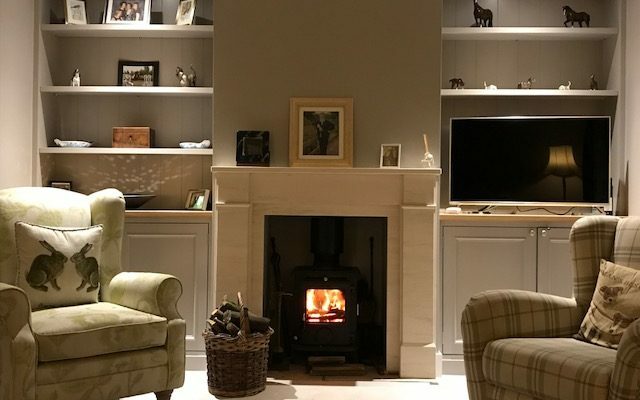 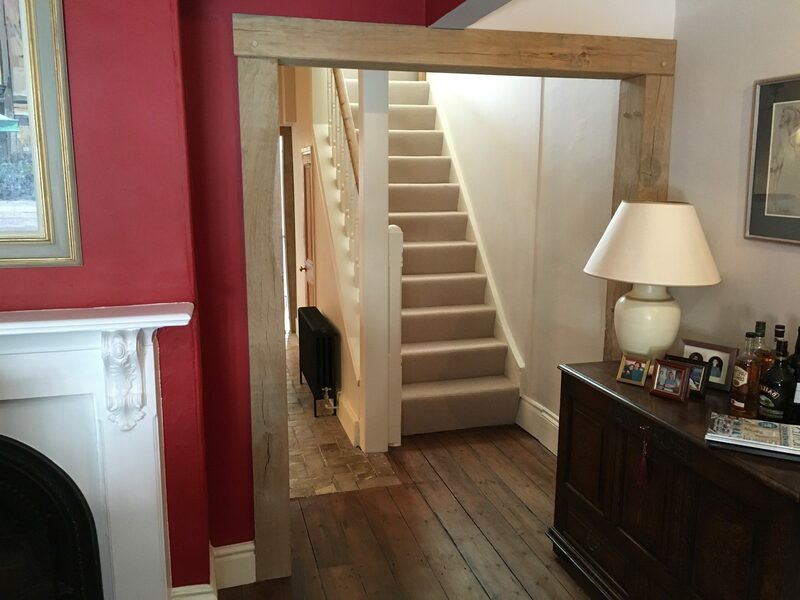 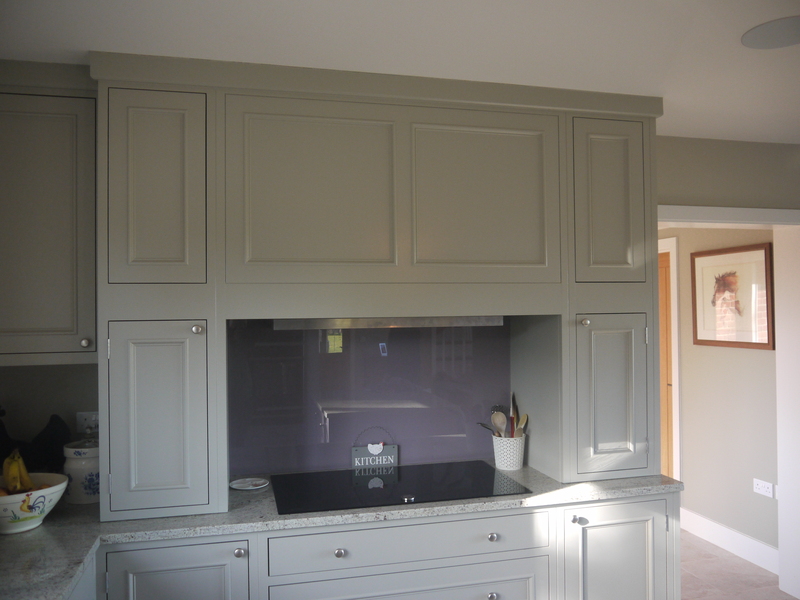 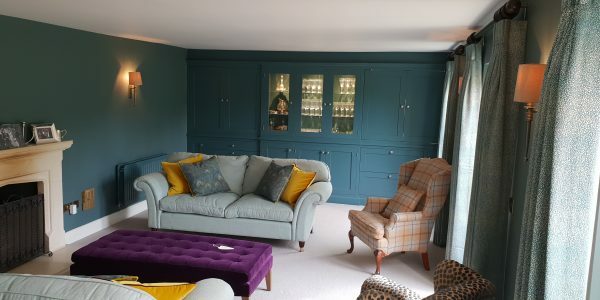 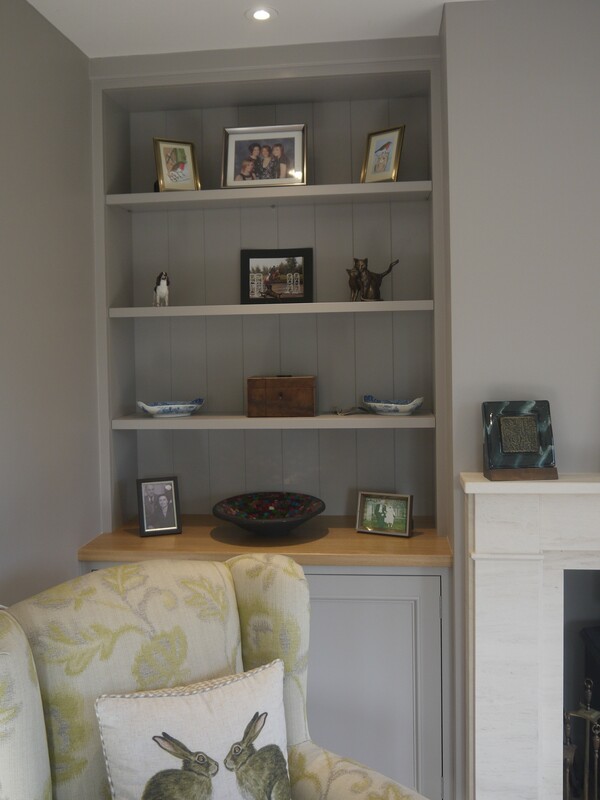 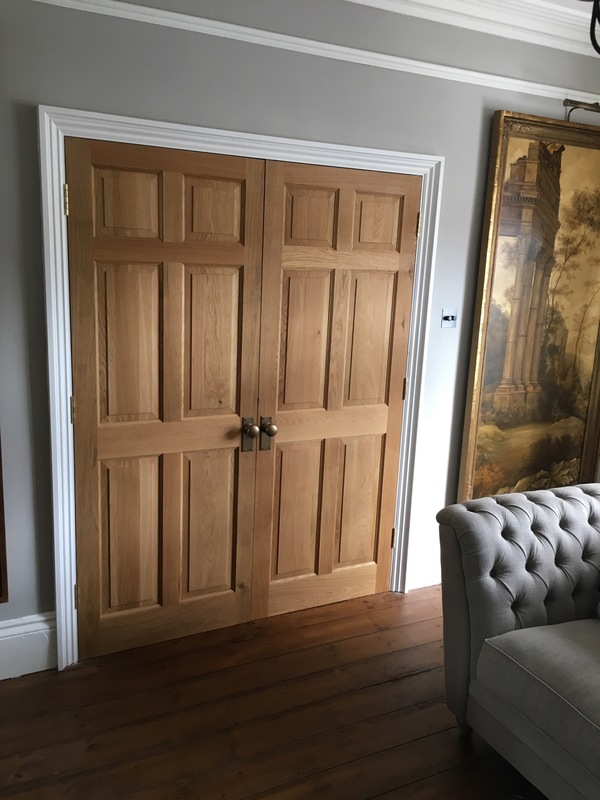 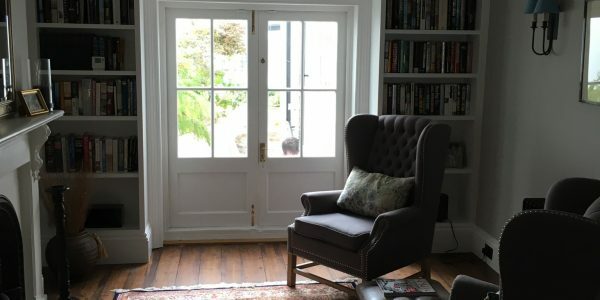 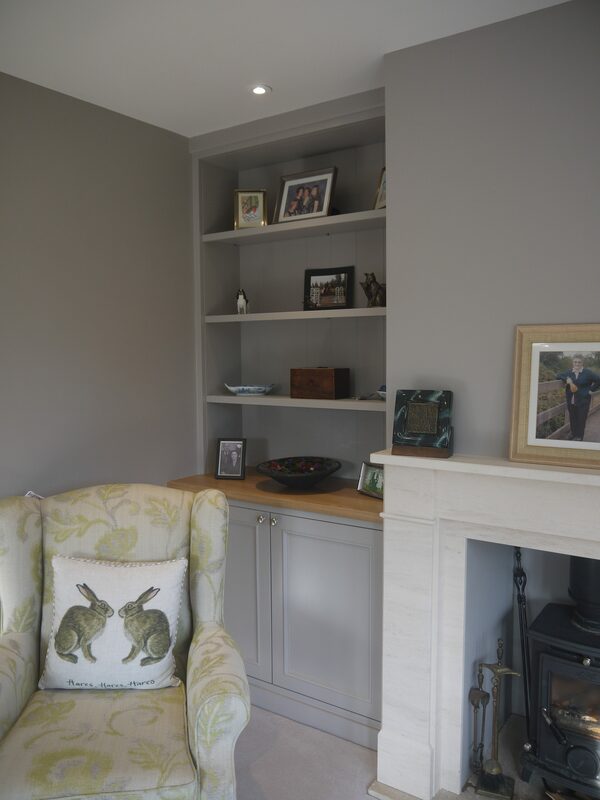 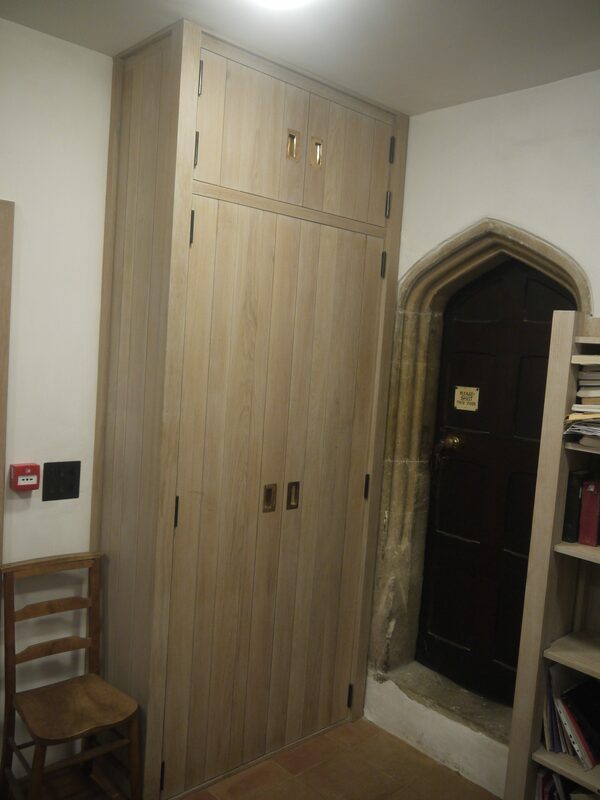 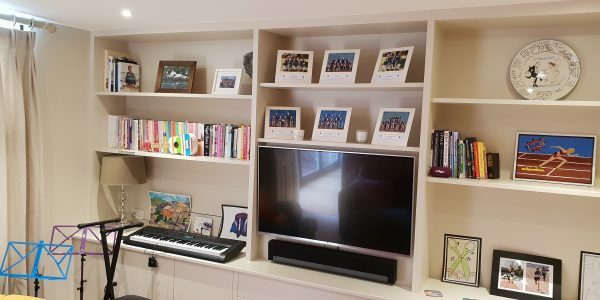 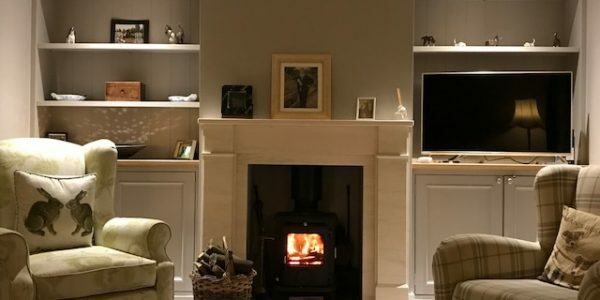 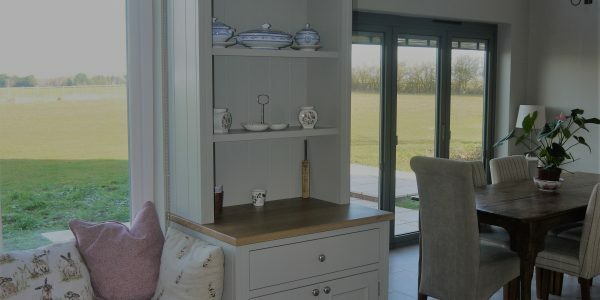 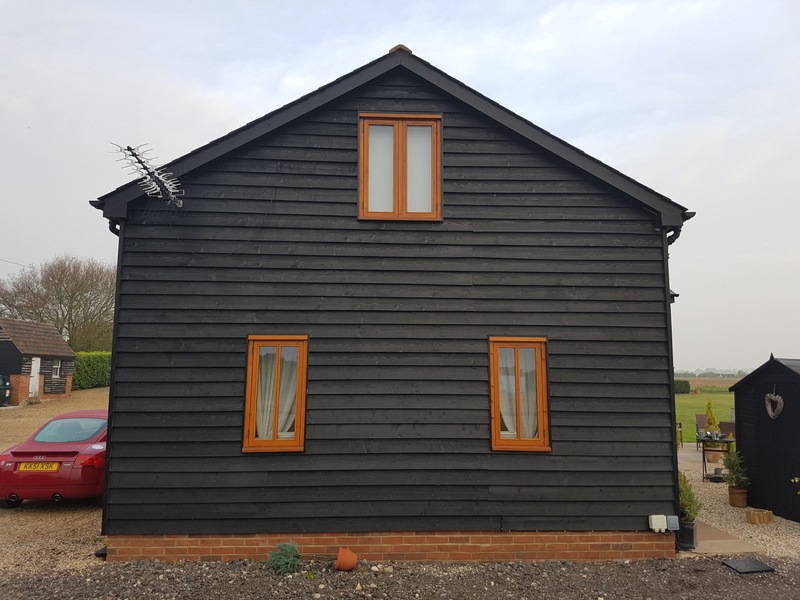 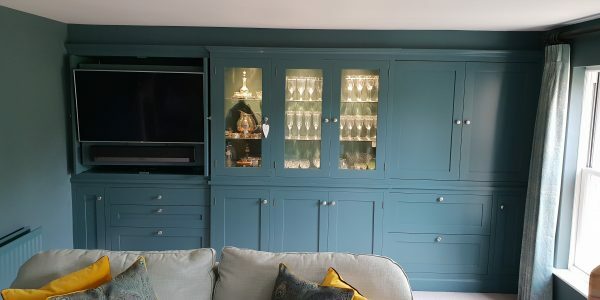 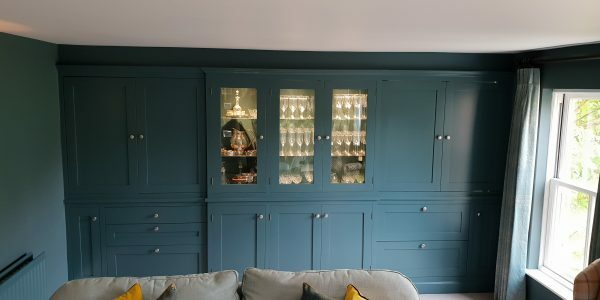 They have fully renovated this particular property and we were very pleased to supply and fit the property with a kitchen, a separate drinks area, a number of internal and external Oak doors, Oak frames, custom made book shelving, a media unit etc. 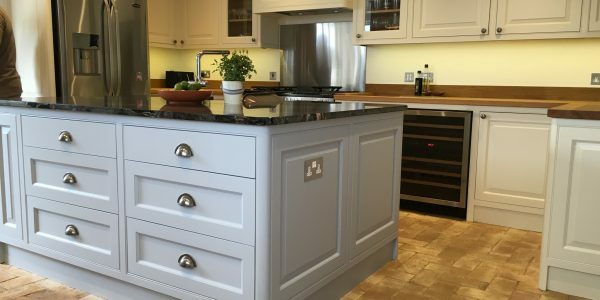 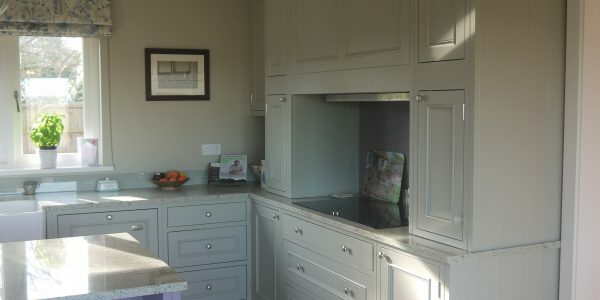 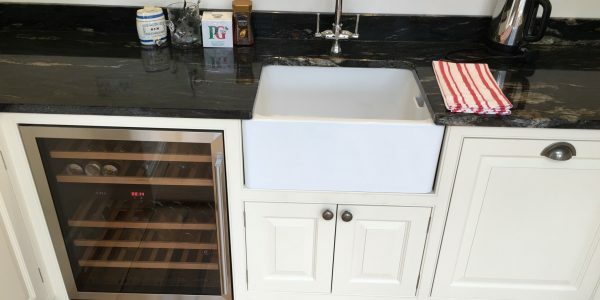 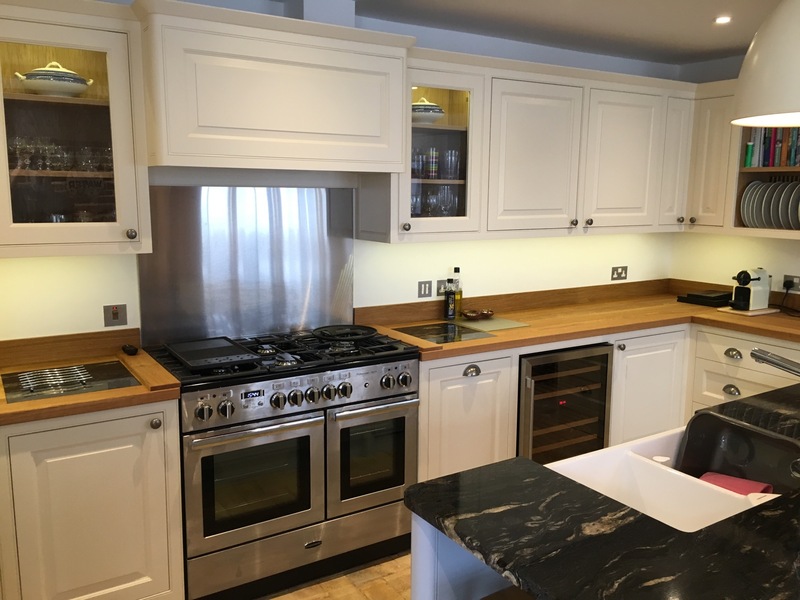 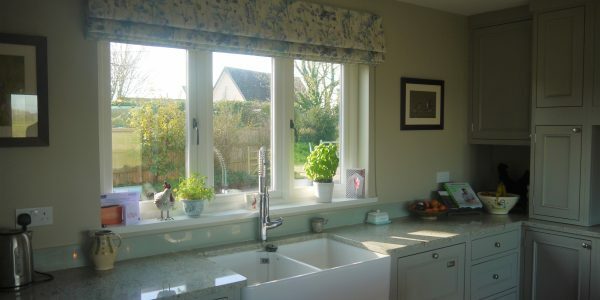 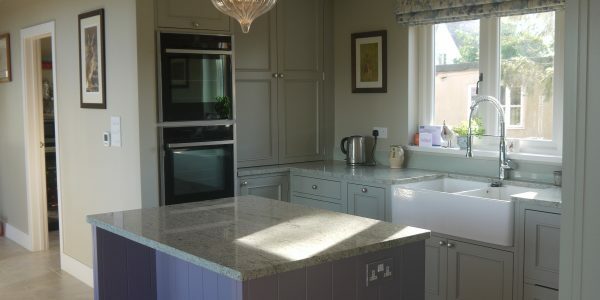 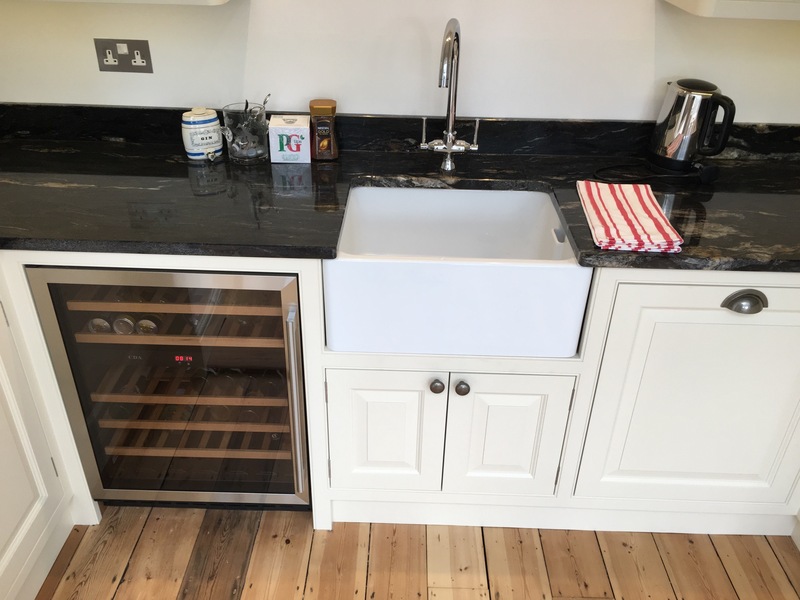 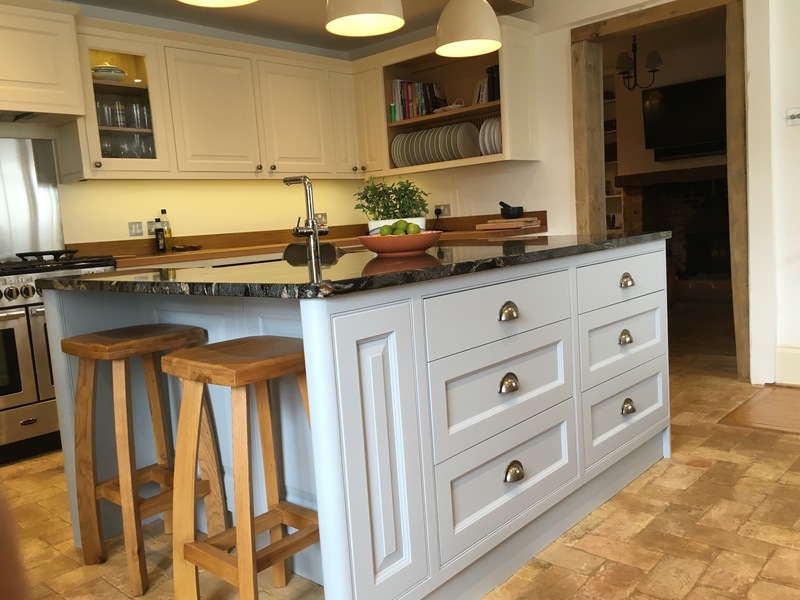 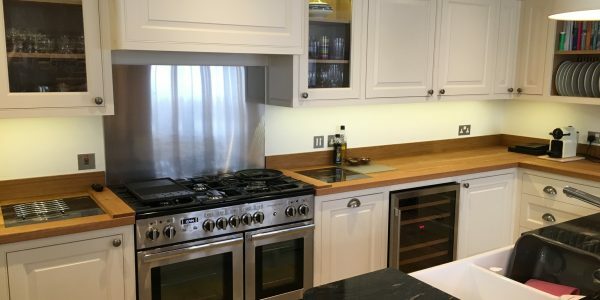 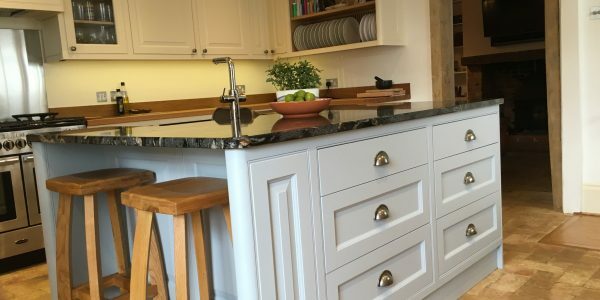 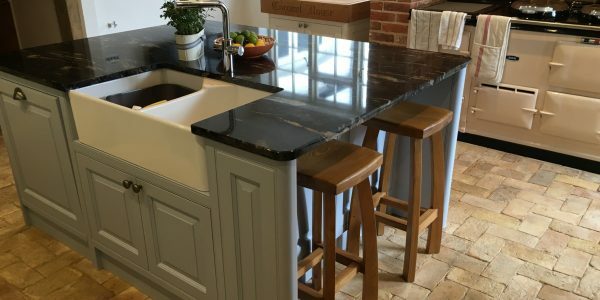 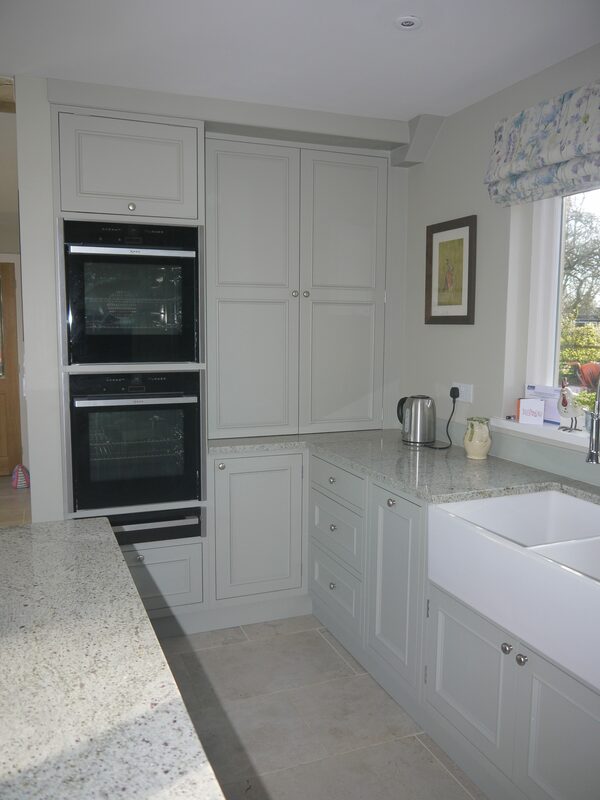 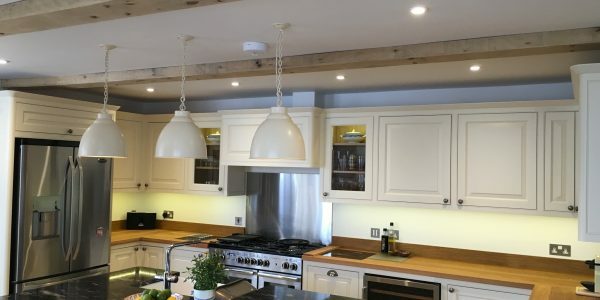 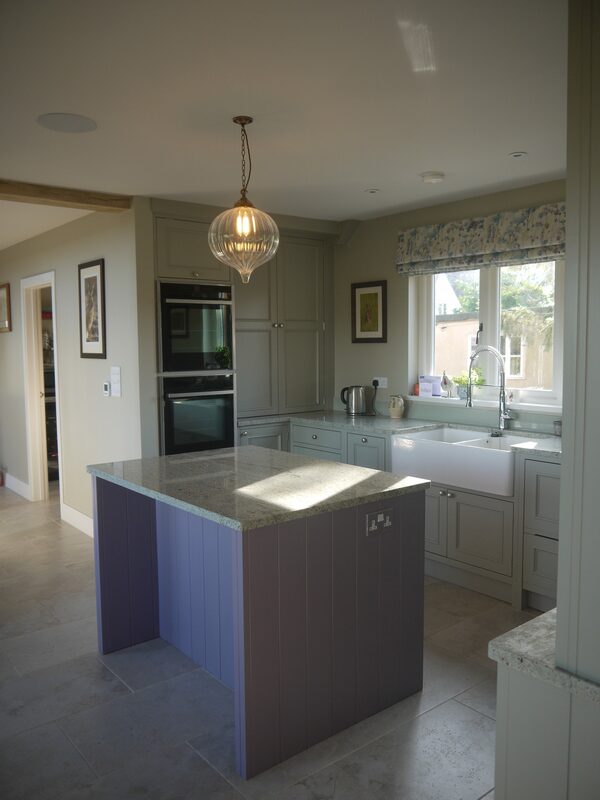 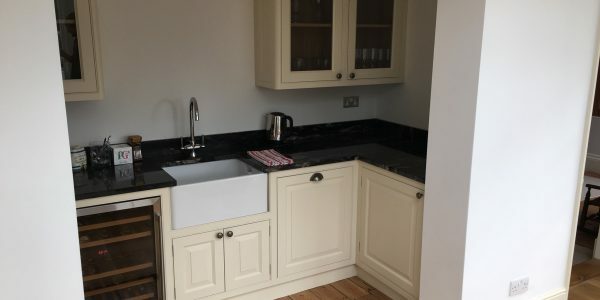 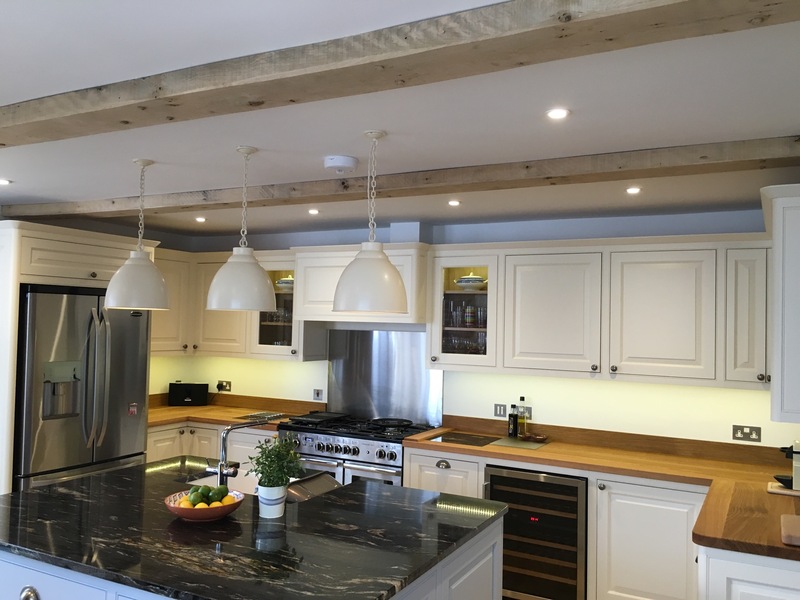 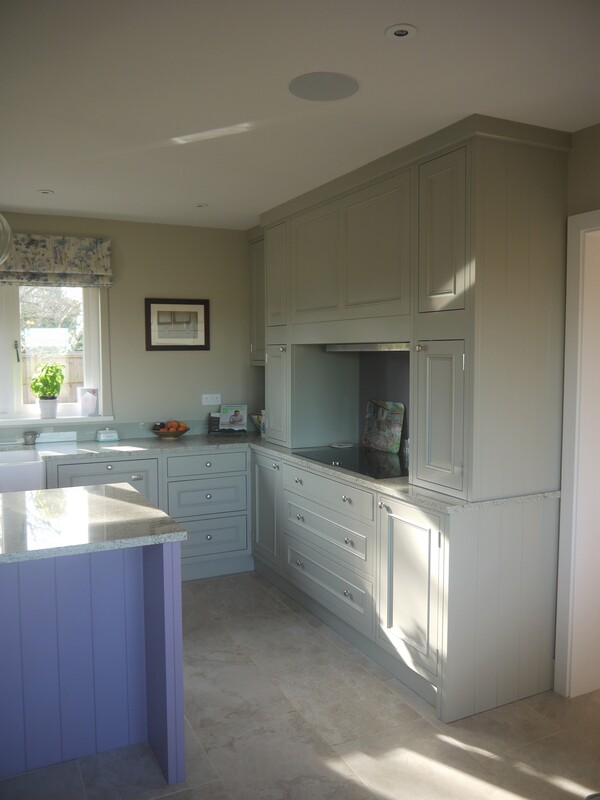 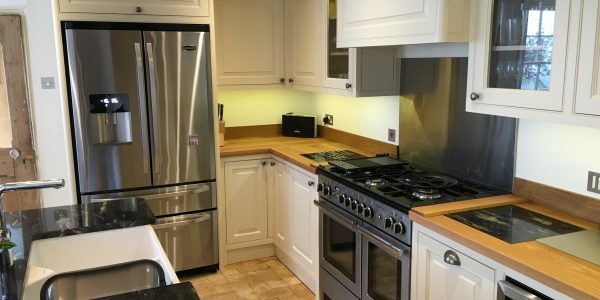 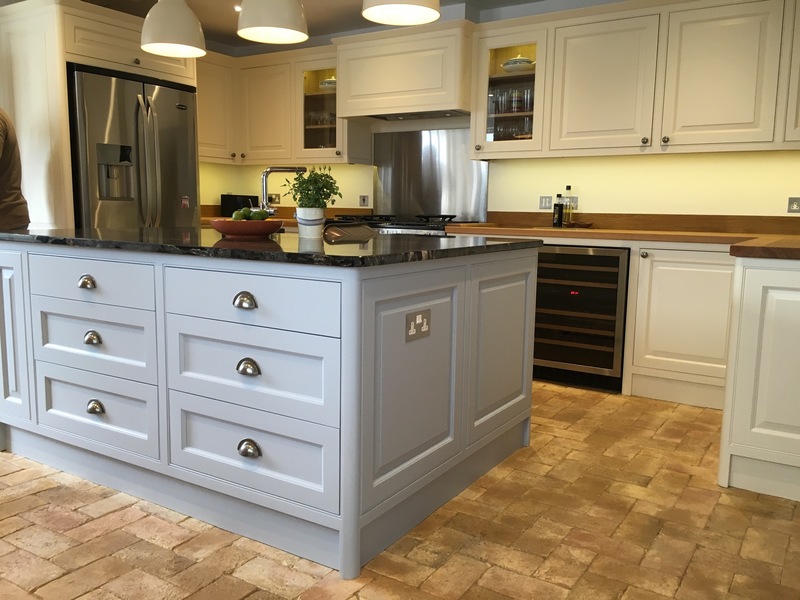 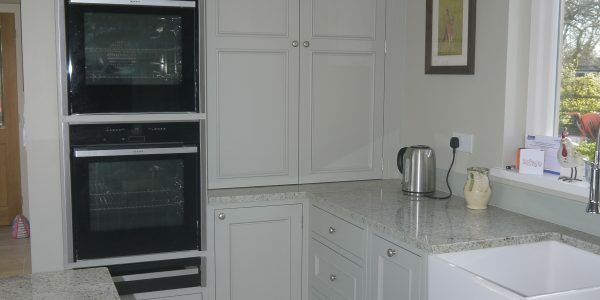 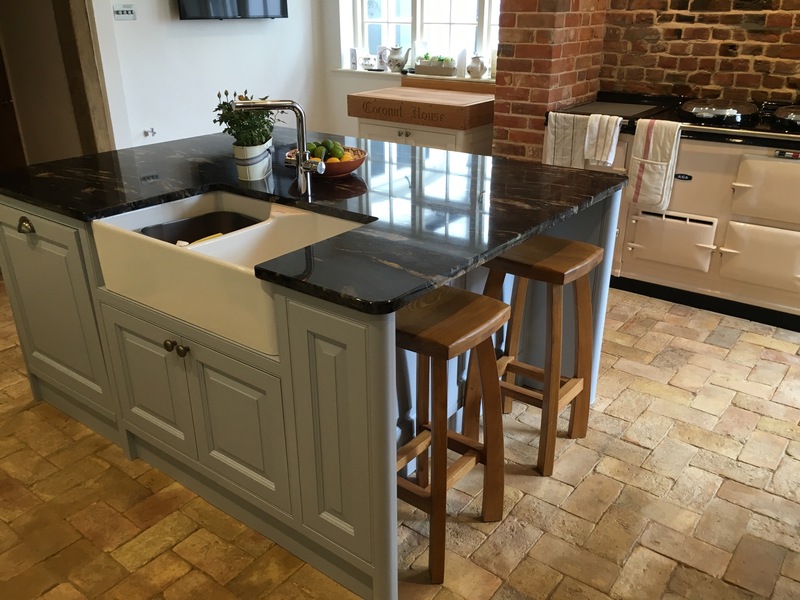 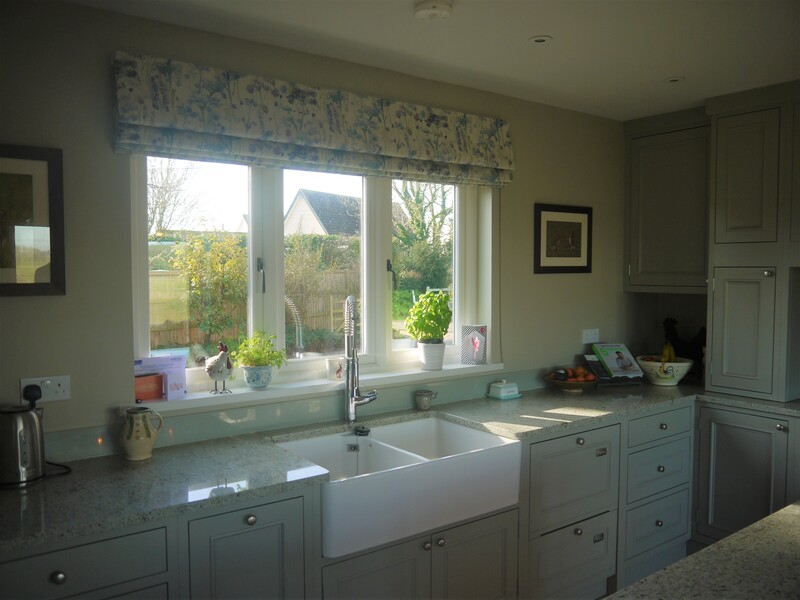 With the kitchen, we helped the clients design the layout, supplied and fitted the entire kitchen and worktops and lastly, sourced all the client’s chosen appliances. 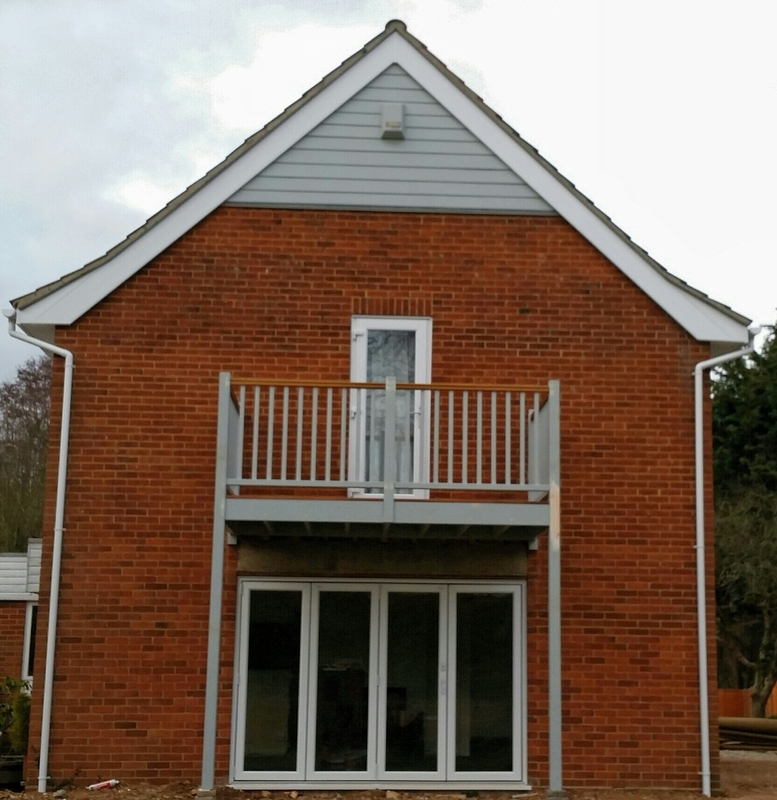 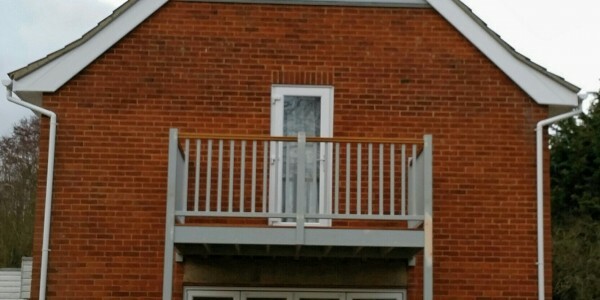 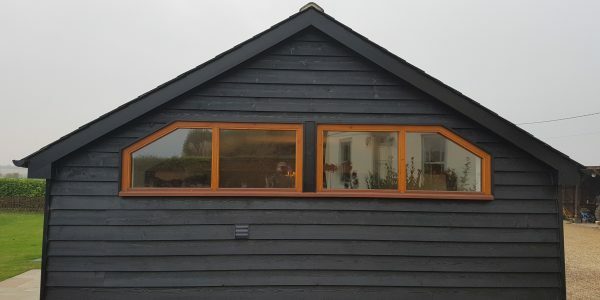 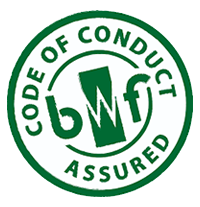 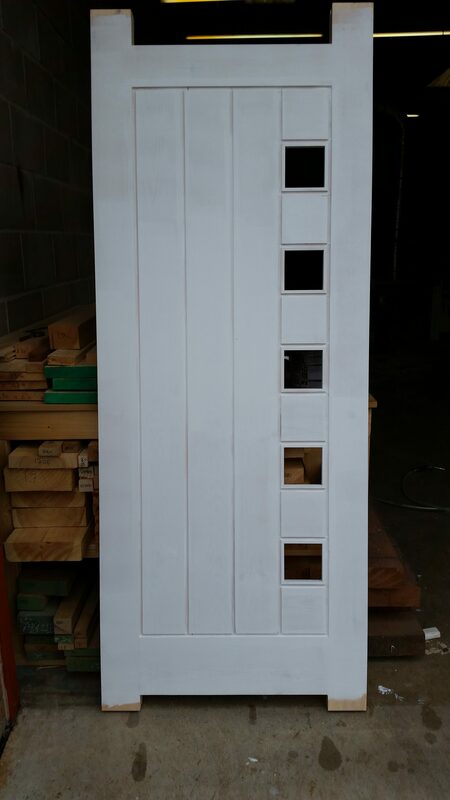 Externally we had the pleasure of replacing the rotten barge boards of the property. 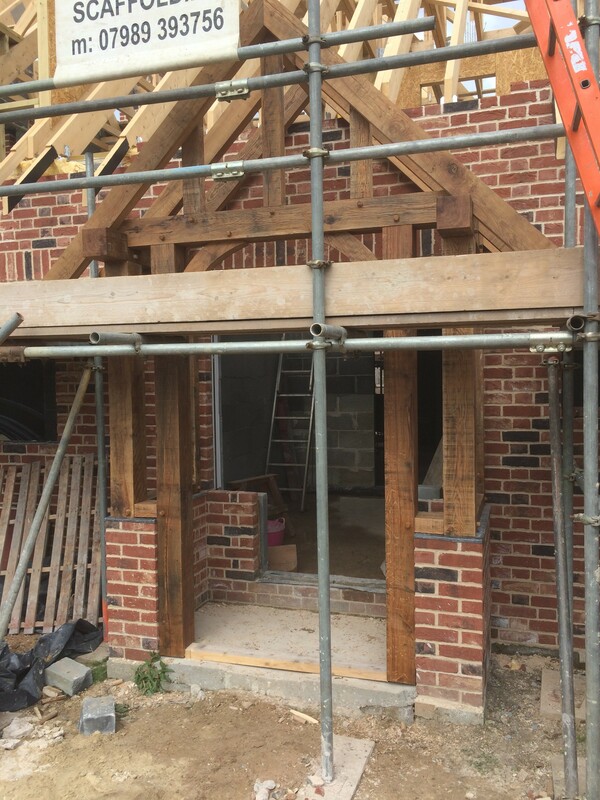 They have an intricate design which needed a lot of care and attention to reproduce but we think they finish the property off beautifully. 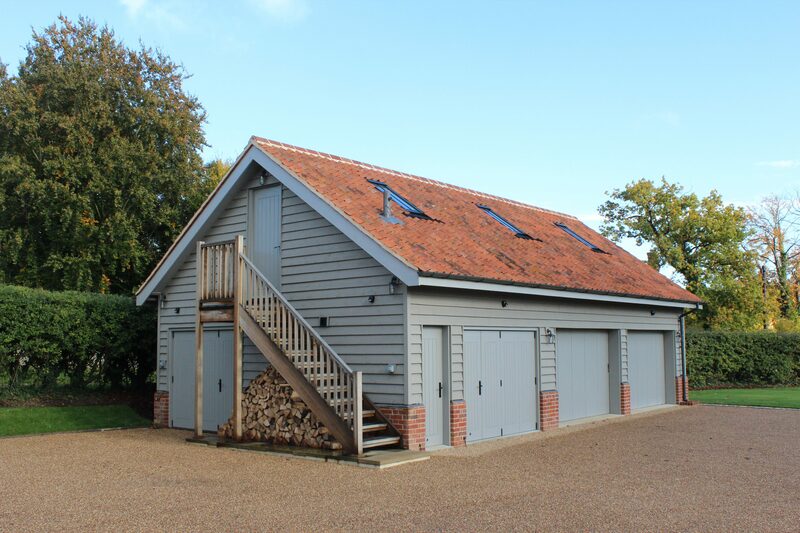 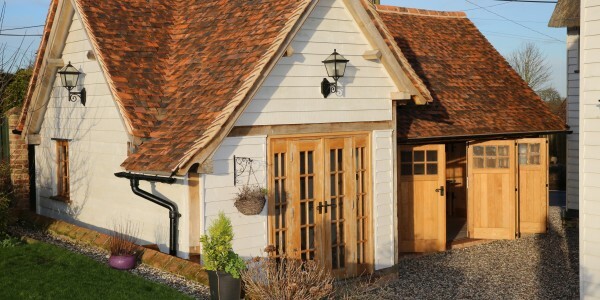 We were very pleased to have been asked to complete a number of small projects on this gorgeous property by the owner. 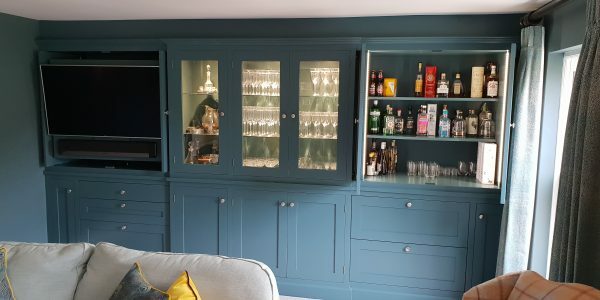 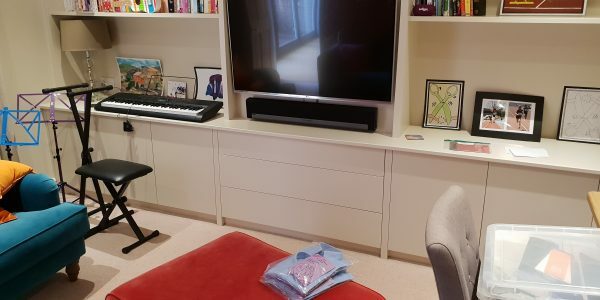 The owner of this property wanted an area that would please the eye and be functional when they entertain.When combining our expertise and their wants and needs, we were able to make this wonderful ergonomic built in unit. 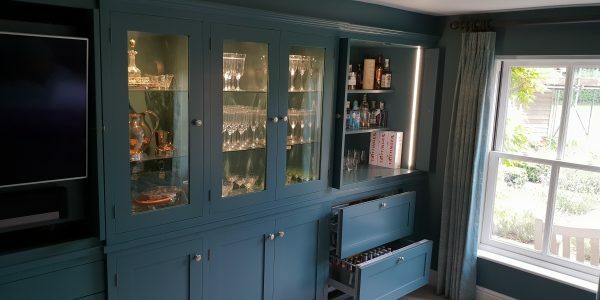 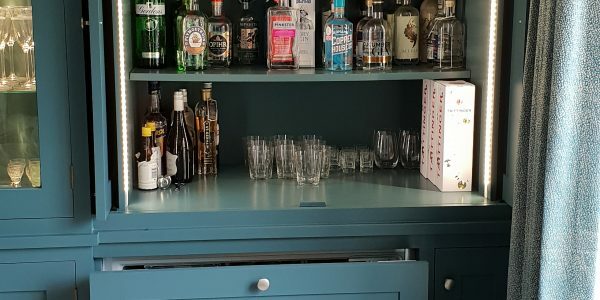 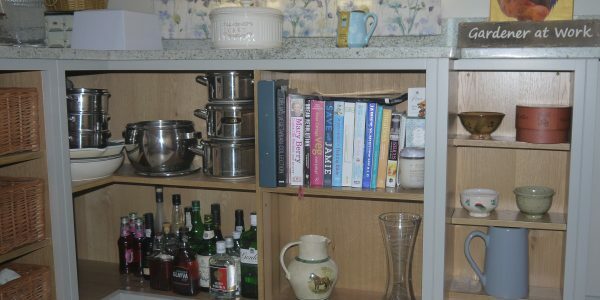 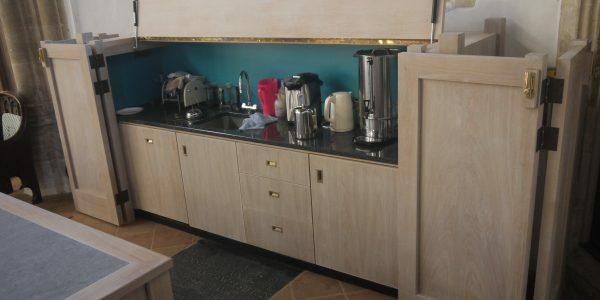 There are three sections to the unit, to the left houses the TV, centre stage is the glassware display and to the right we have the after dinner drinks, complete with fridge drawers. 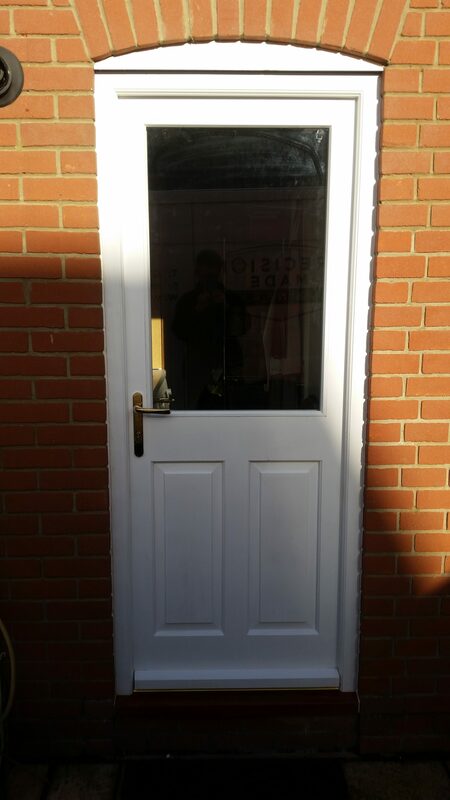 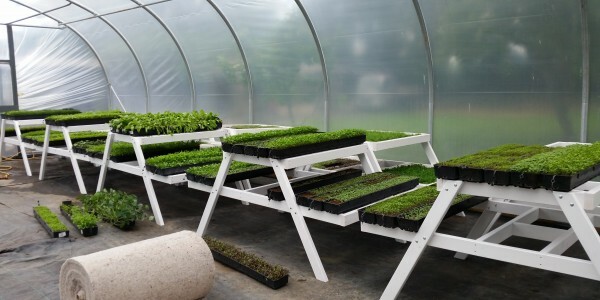 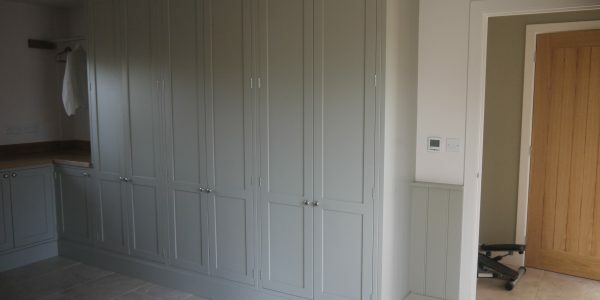 To complete this unit was an absolute pleasure. We were asked to compliment opposite side of the room with matching fitted book shelves, nd with the correct lighting it really did make this an amazing feature to the room. 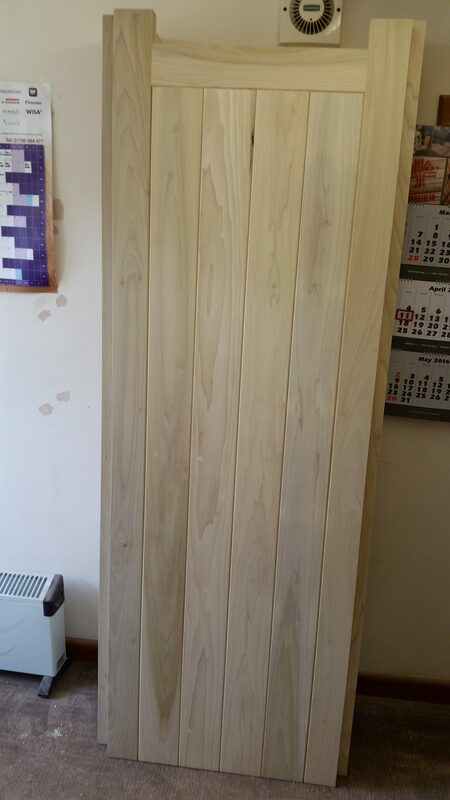 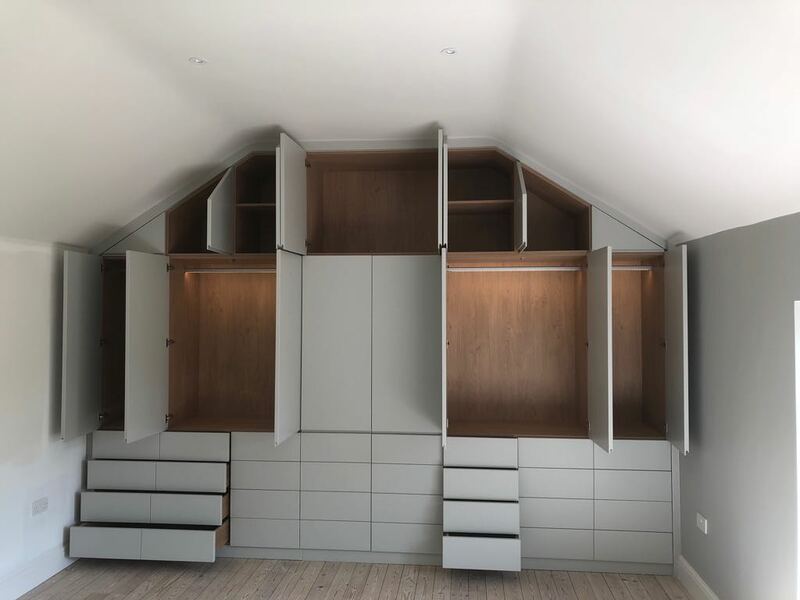 We were asked to add more storage to the clients playroom and master bedroom. 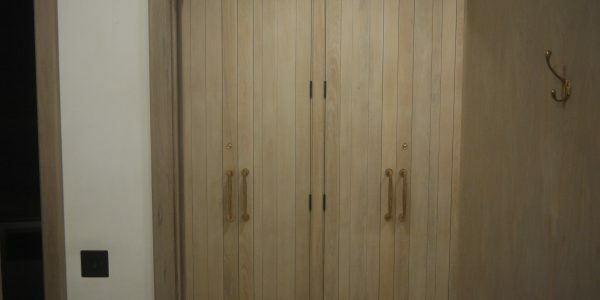 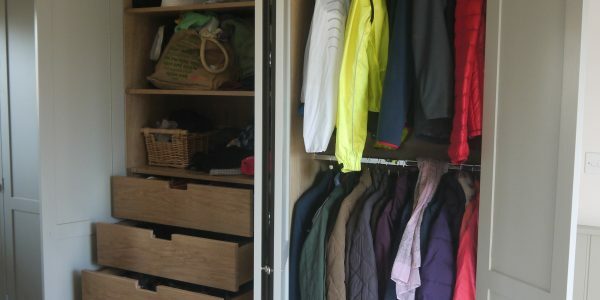 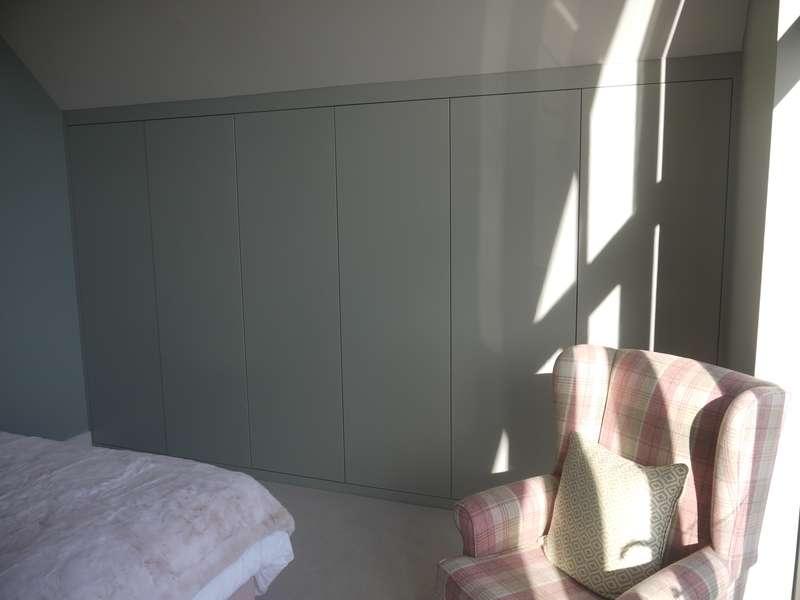 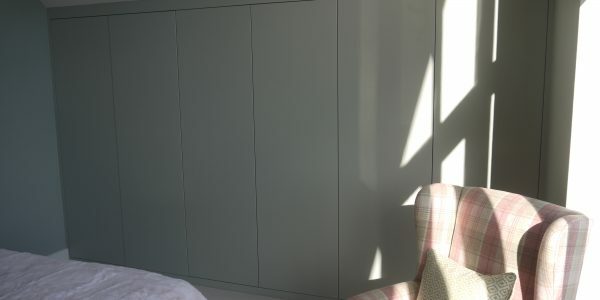 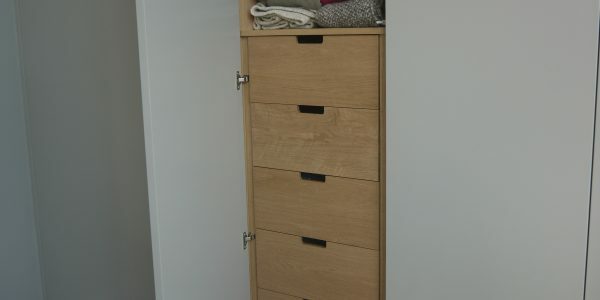 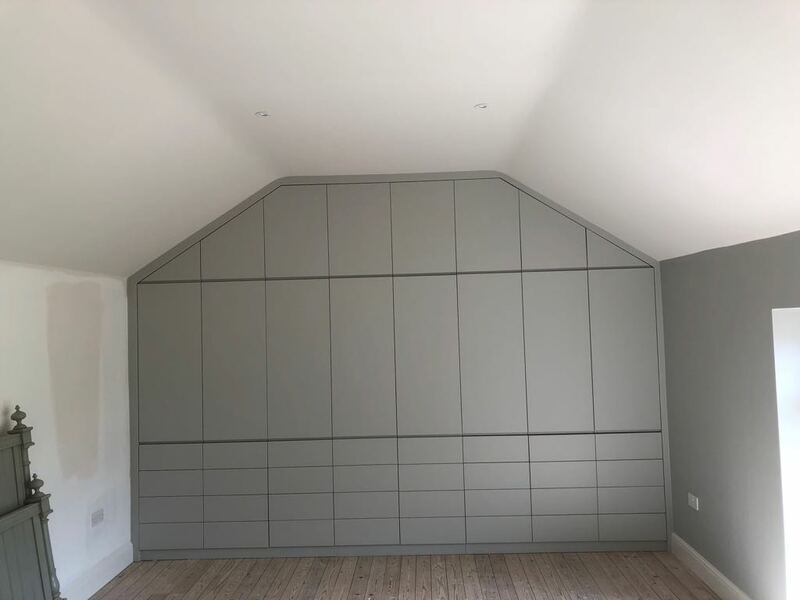 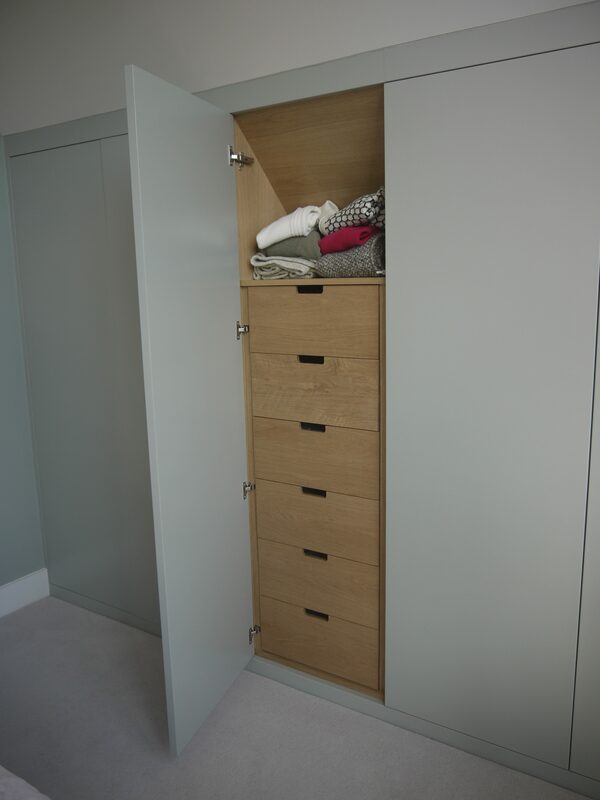 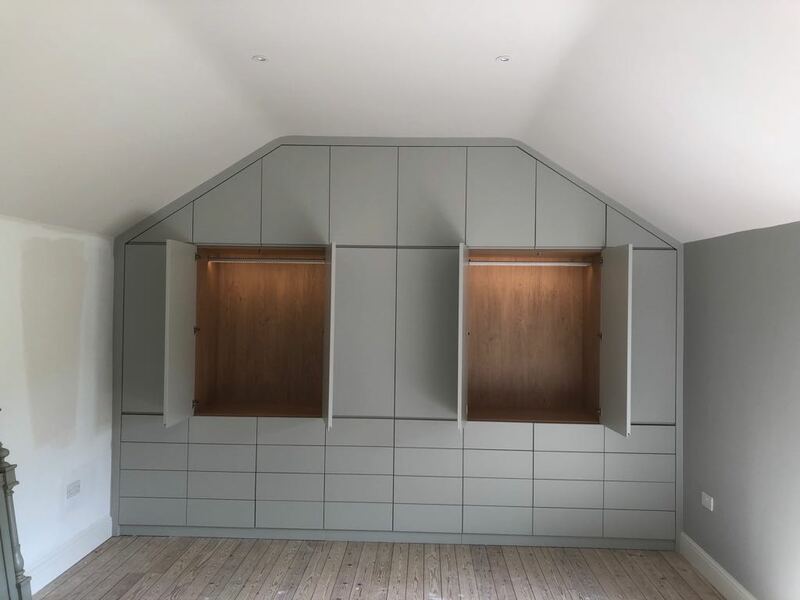 In the master bedroom we were able to build this built in wardrobe and drawers, adding a lot of storage space to this room, yet keeping it crisp, clean and ultra-contemporary with the push release doors. 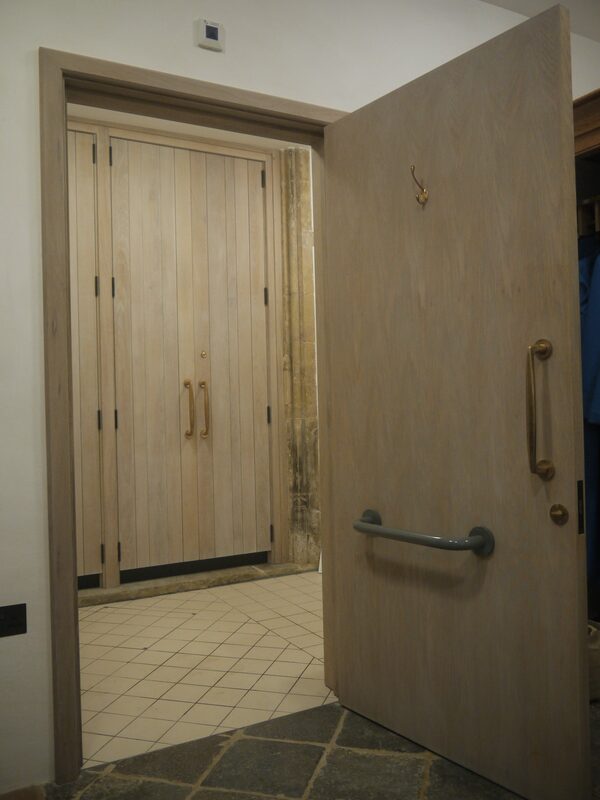 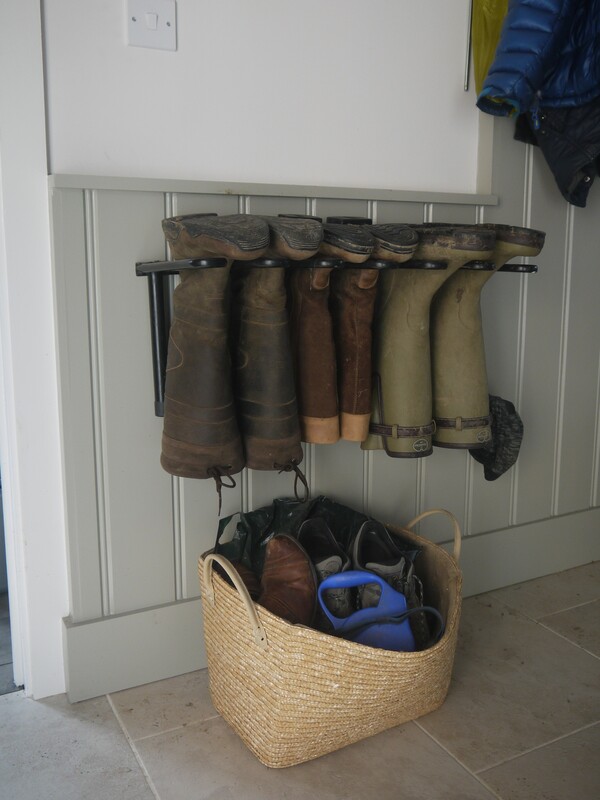 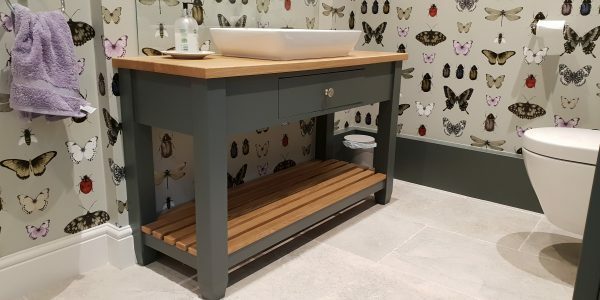 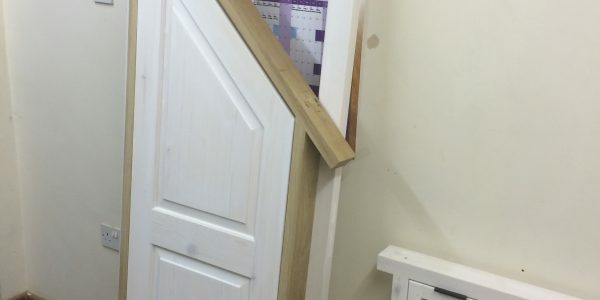 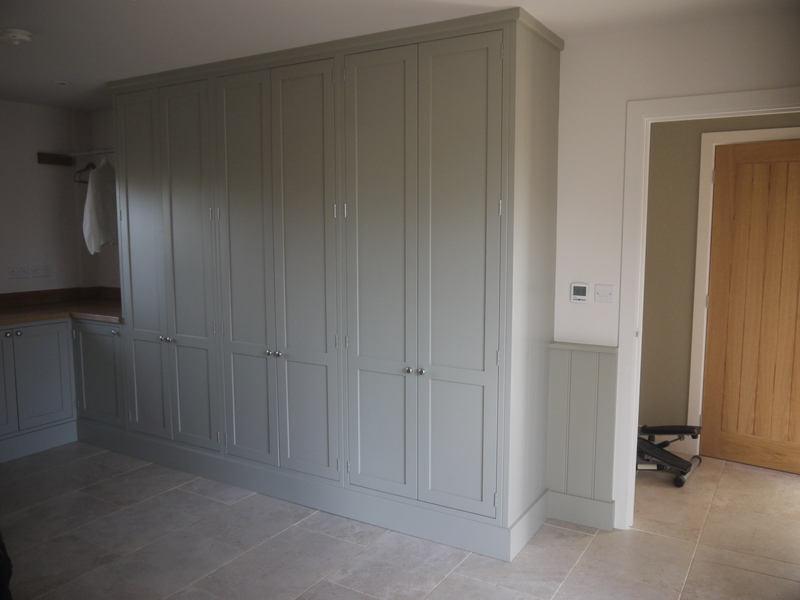 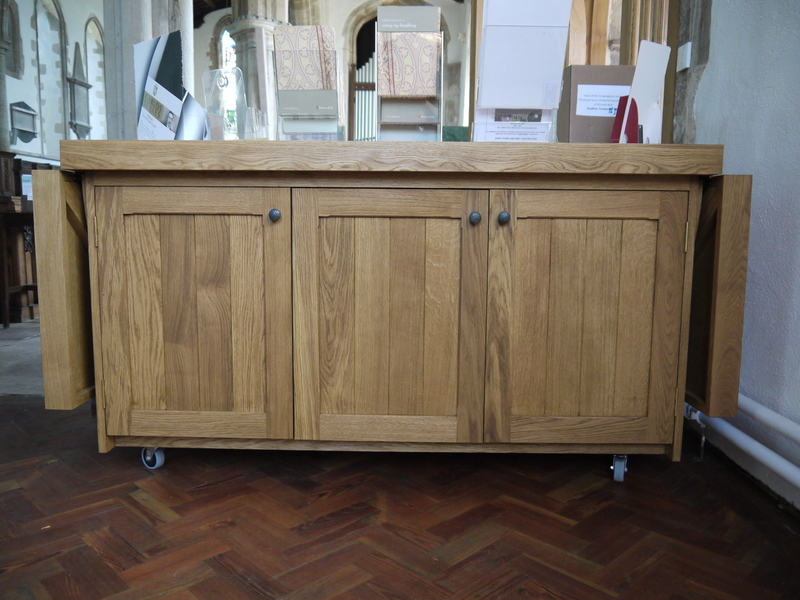 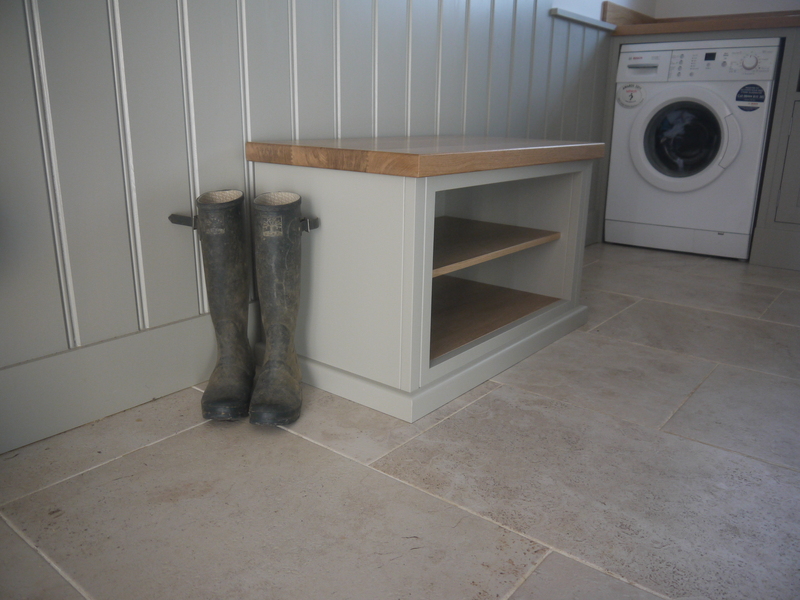 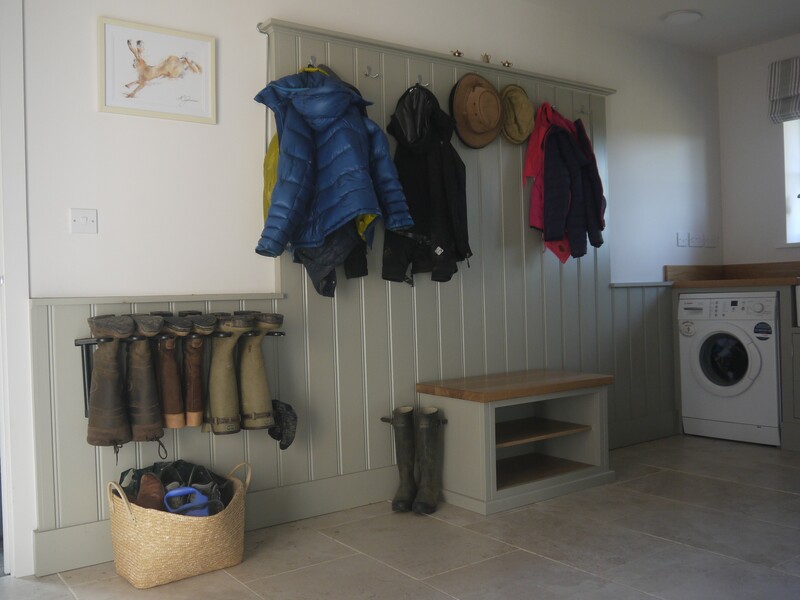 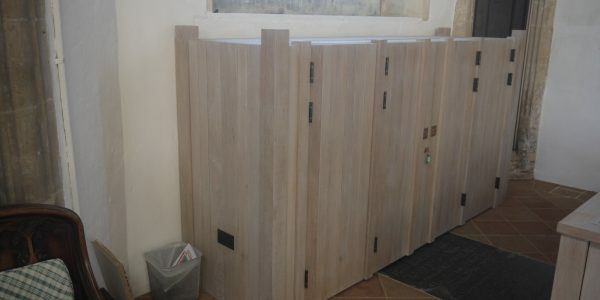 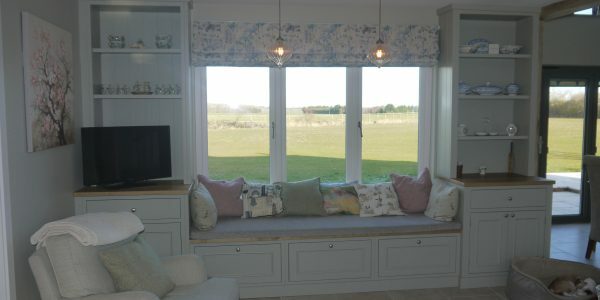 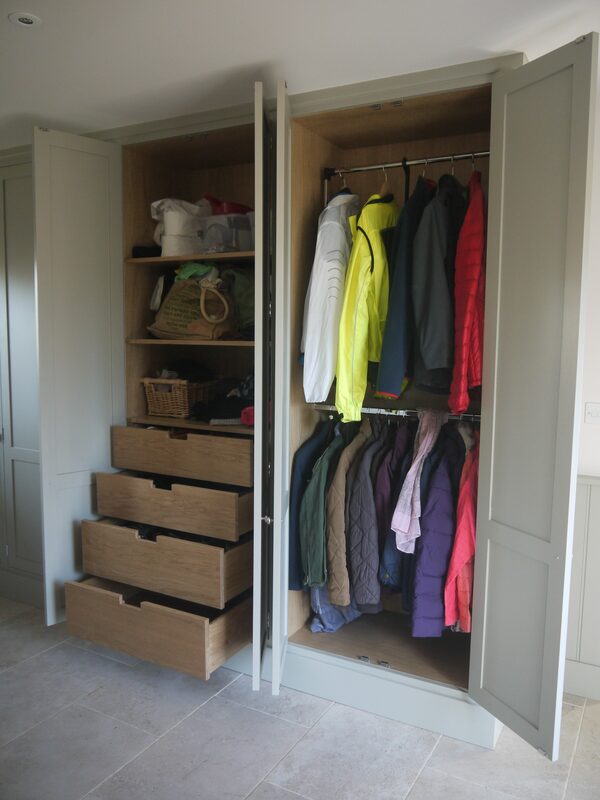 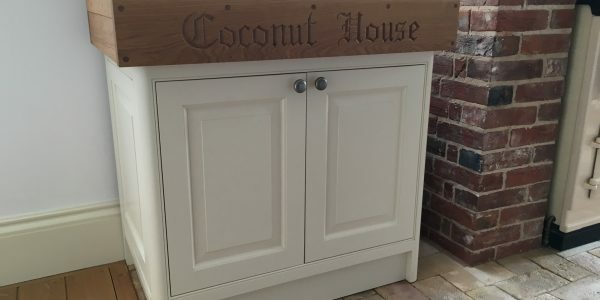 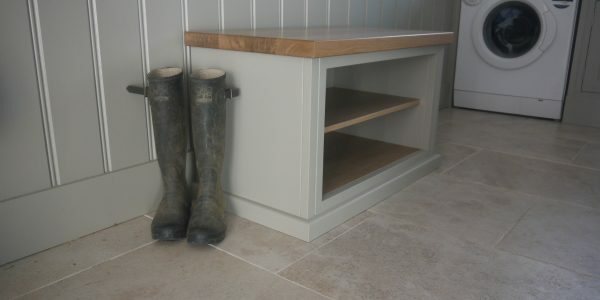 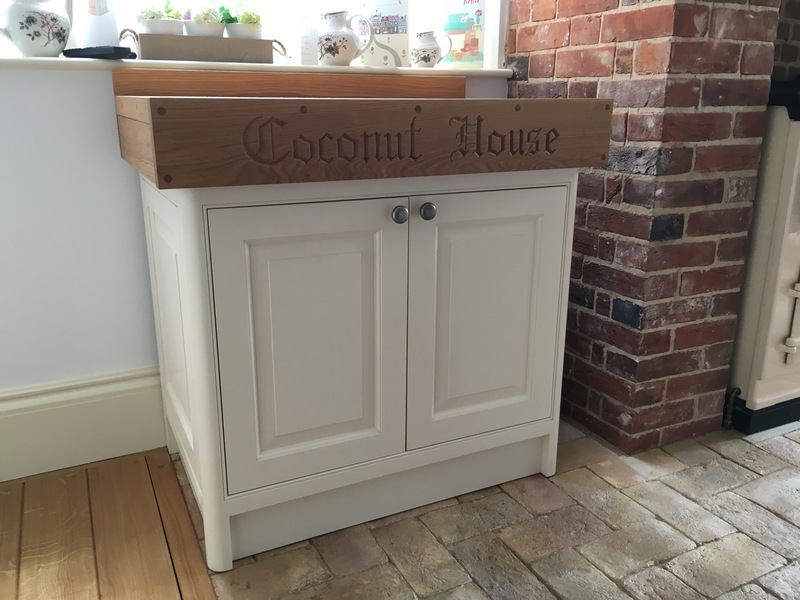 In the Cloakroom we added a lovely vanity table and cupboard making it practical yet spacious.